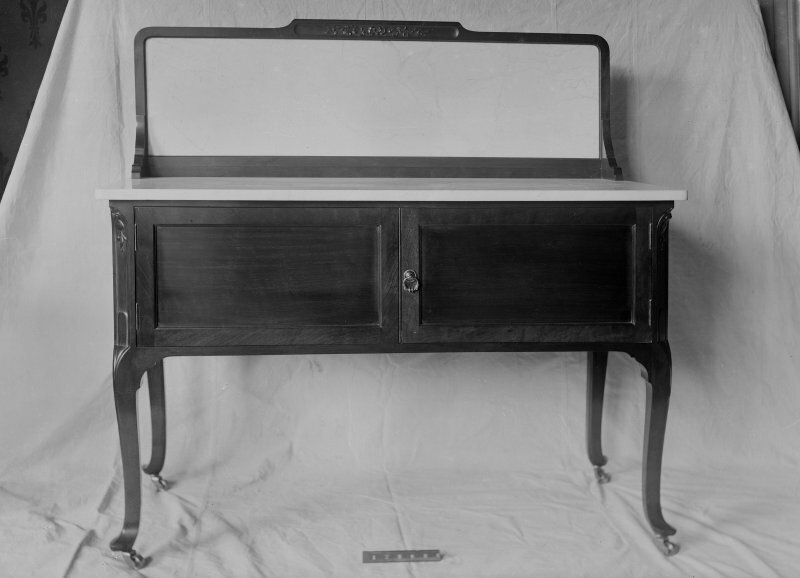 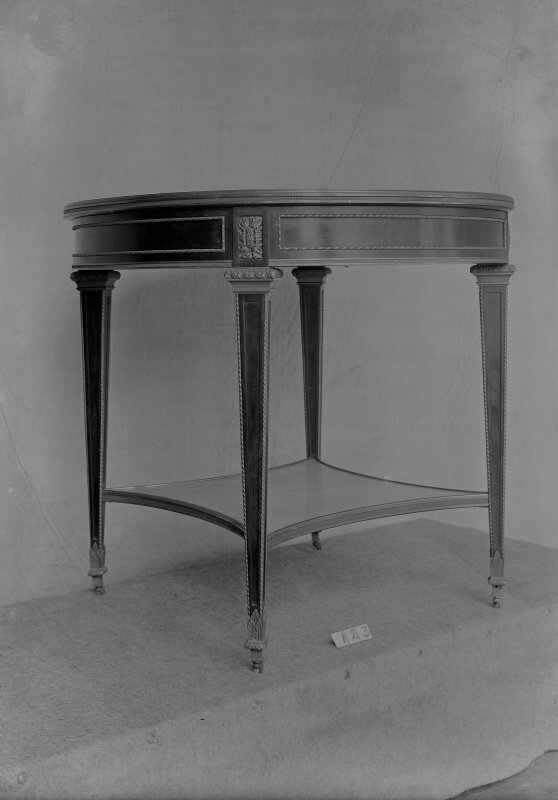 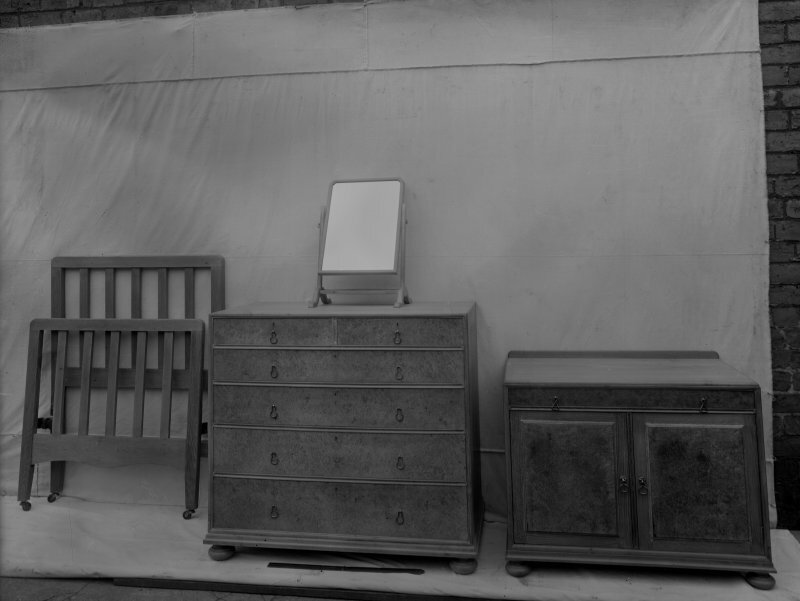 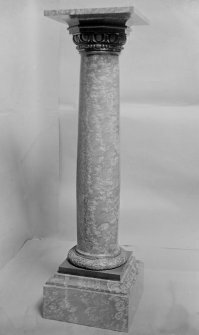 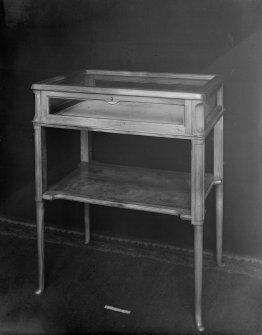 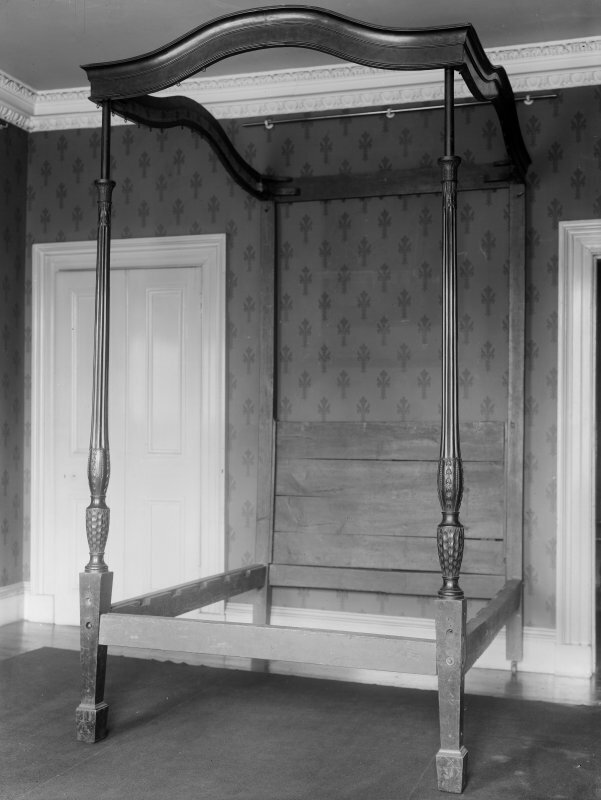 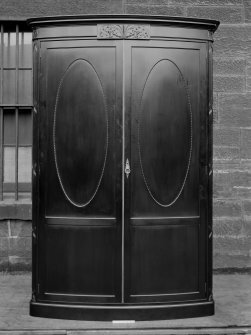 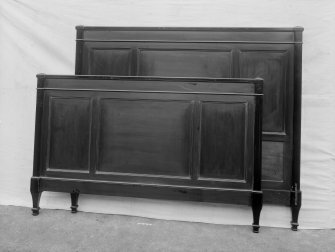 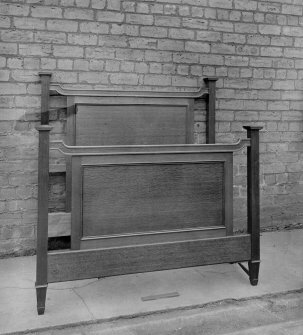 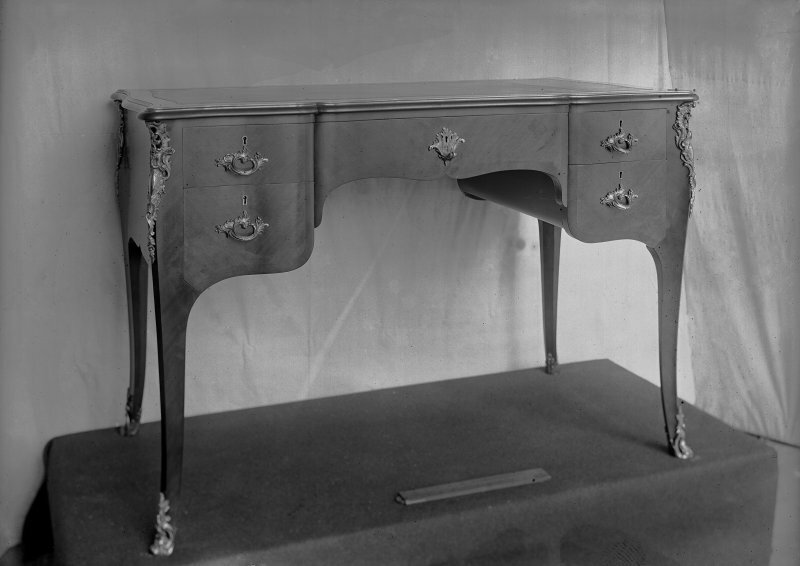 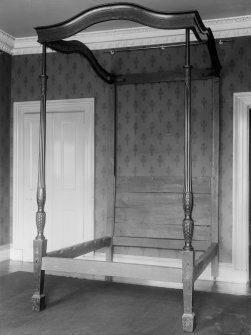 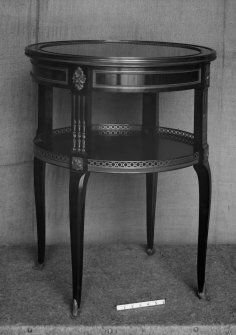 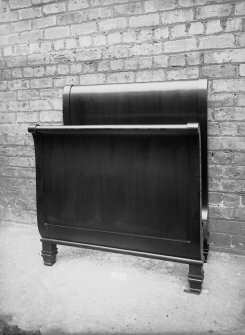 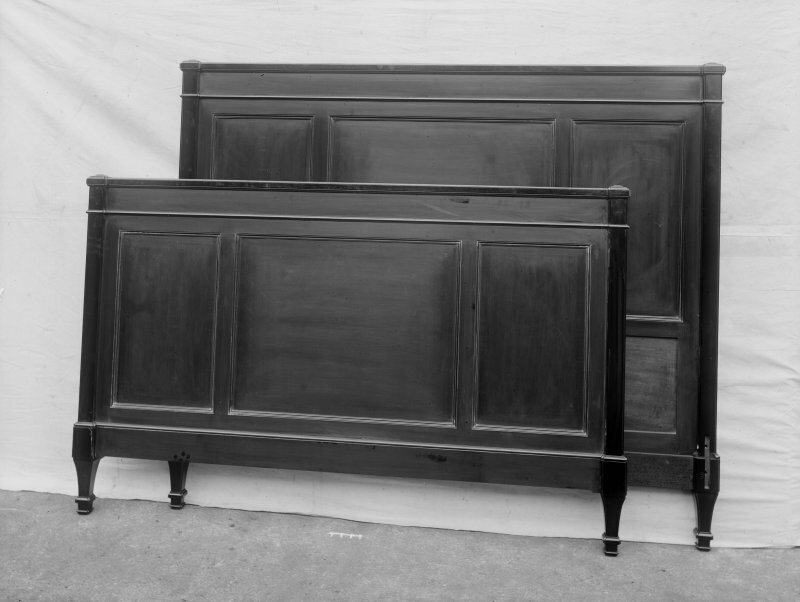 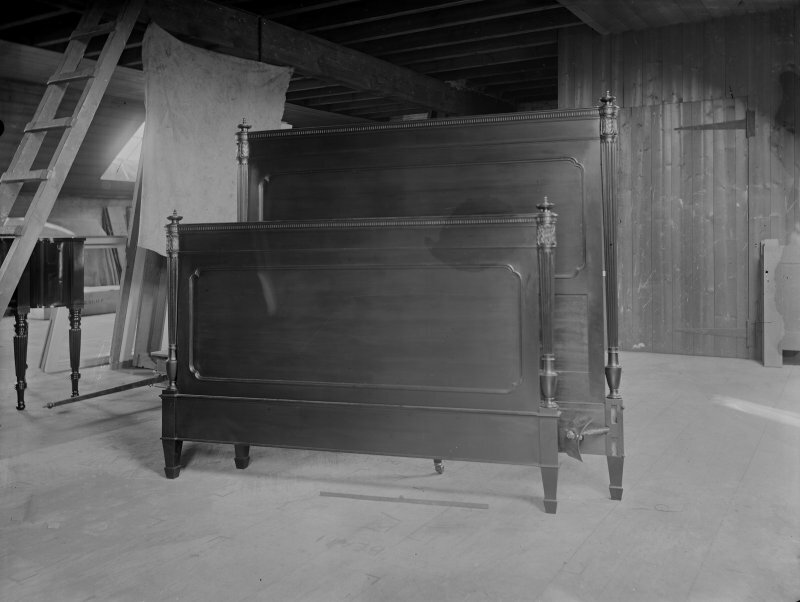 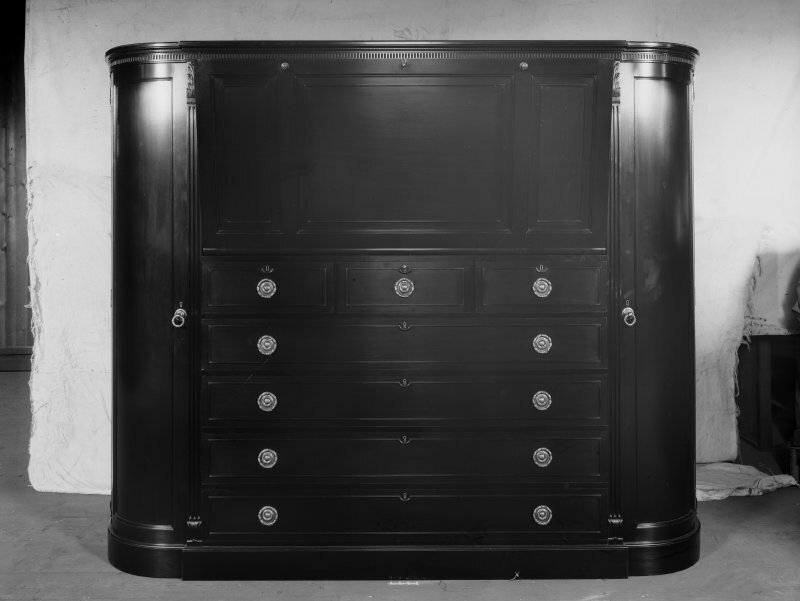 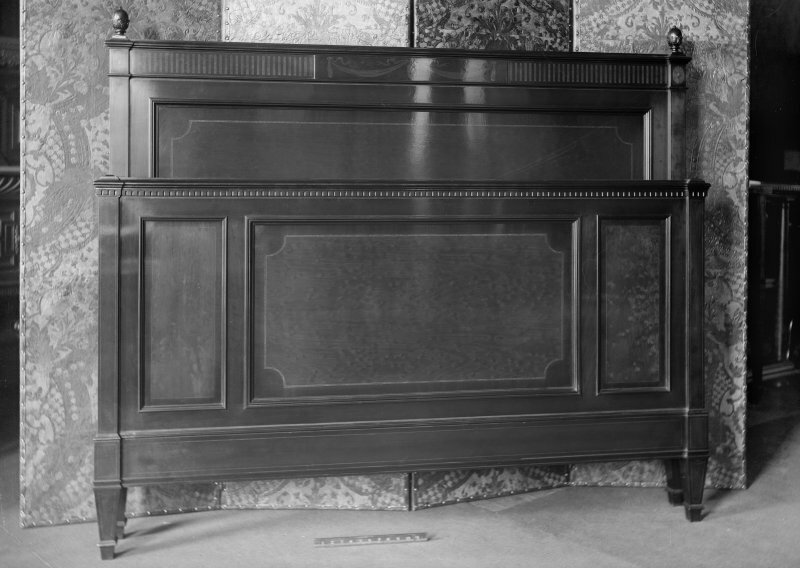 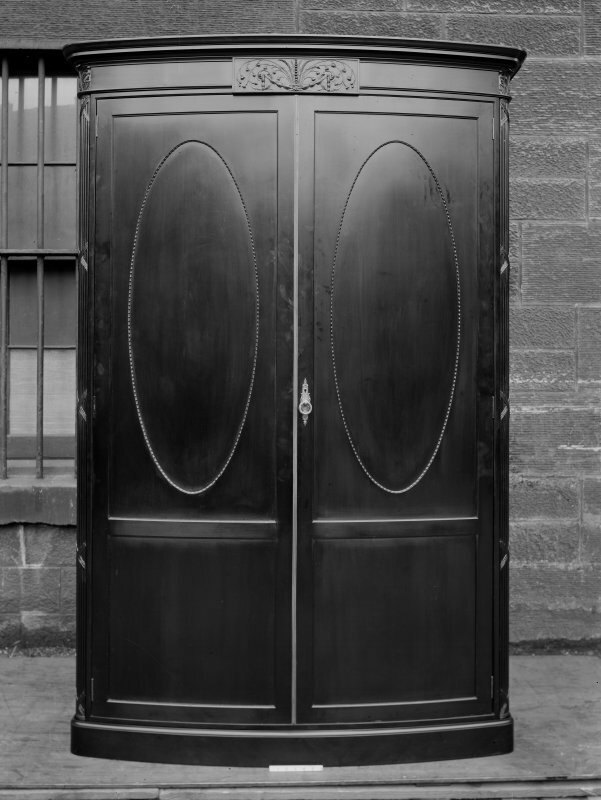 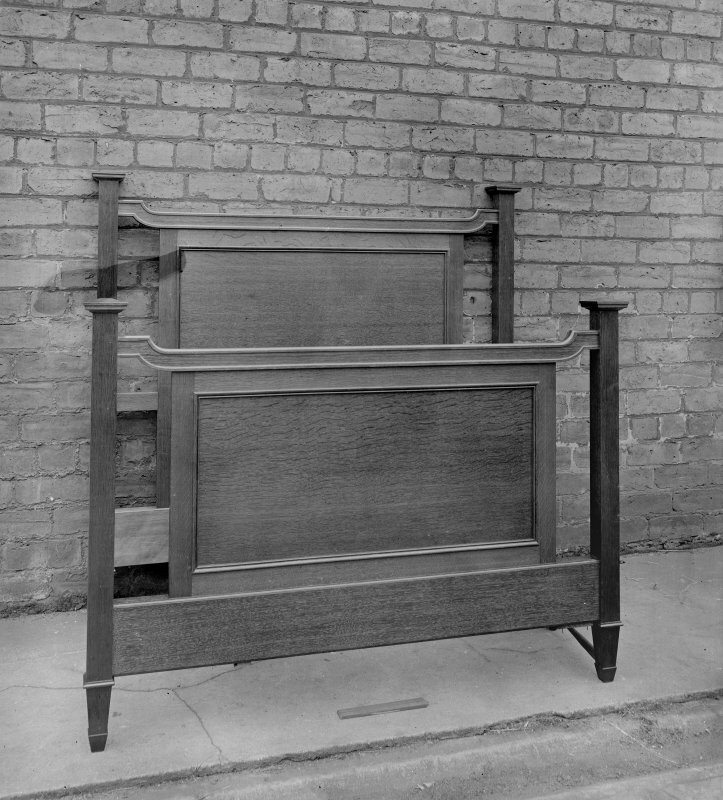 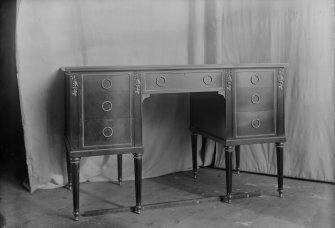 Whytock and Reid were the premier cabinet makers and upholsterers in Edinburgh for nearly 200 years. 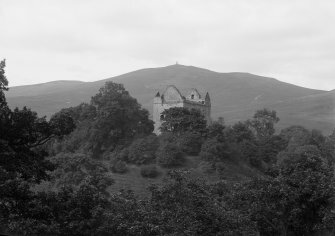 The company began in 1807, when Richard Whytock established his Edinburgh based haberdashery selling drapery and textiles. 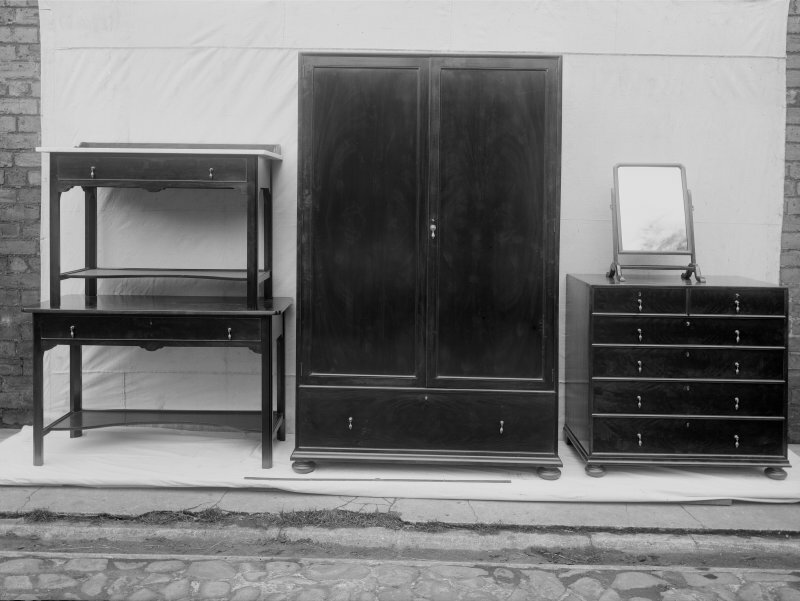 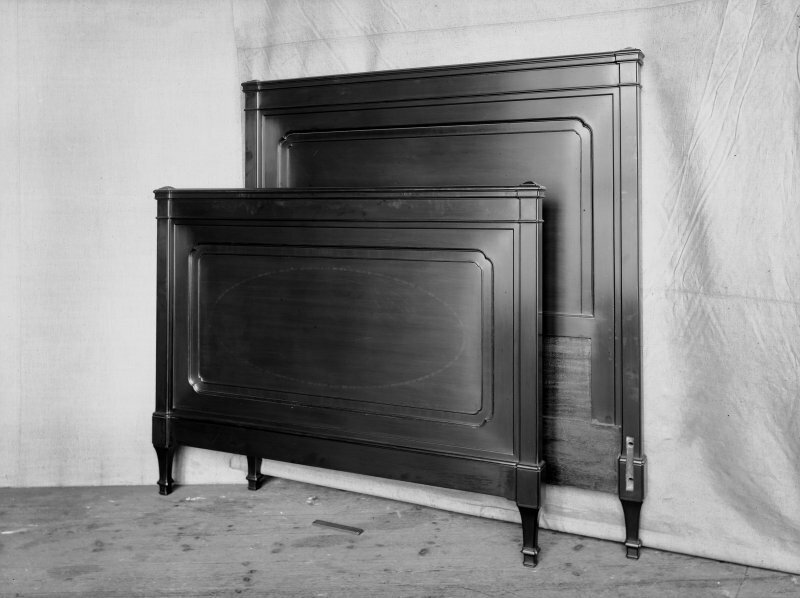 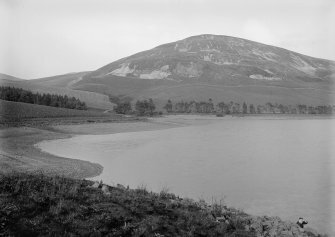 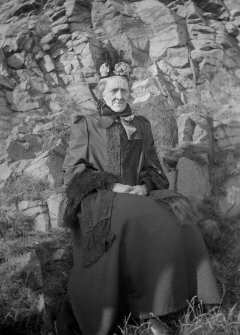 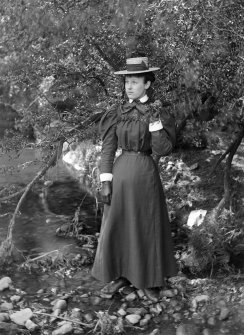 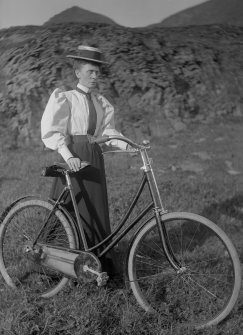 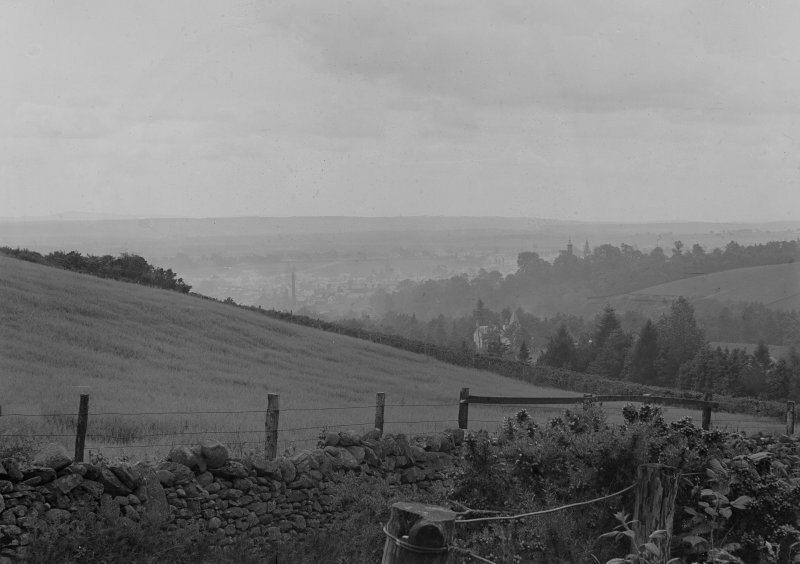 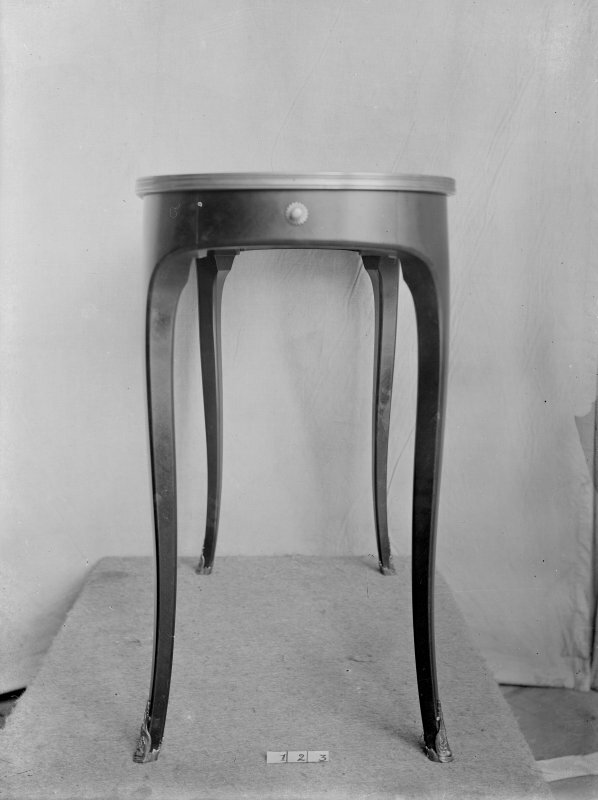 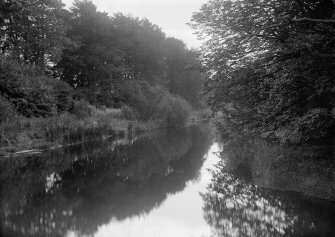 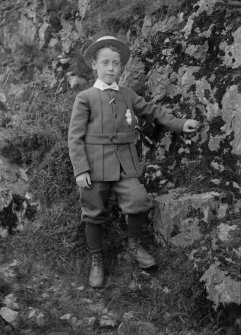 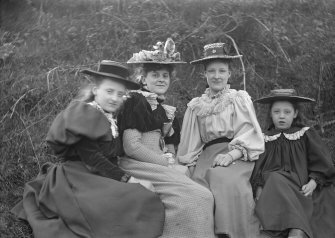 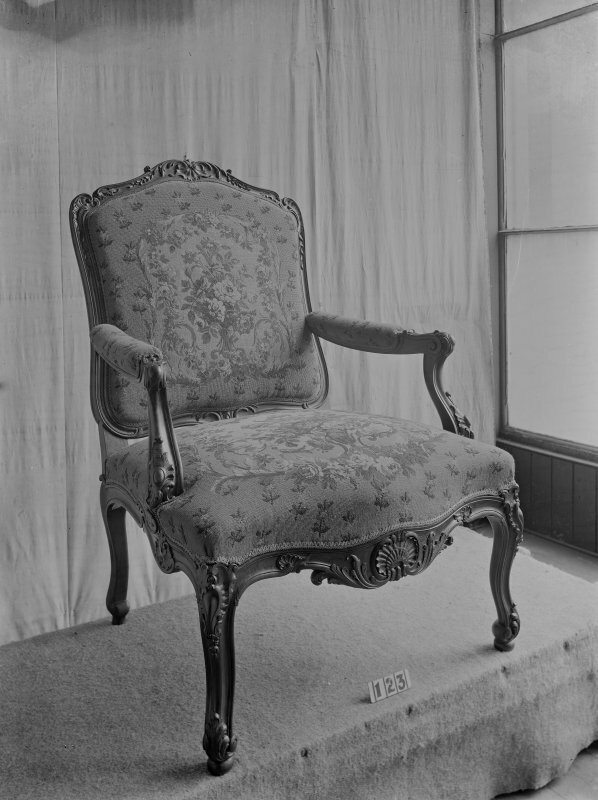 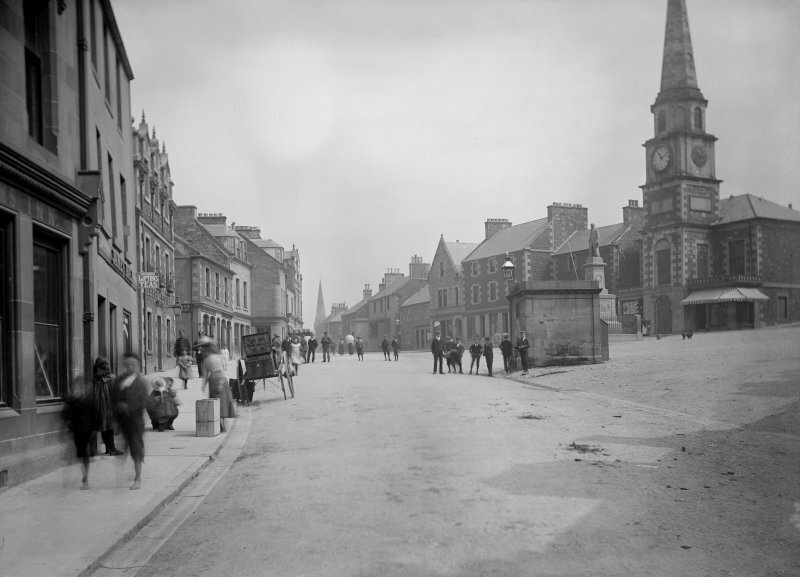 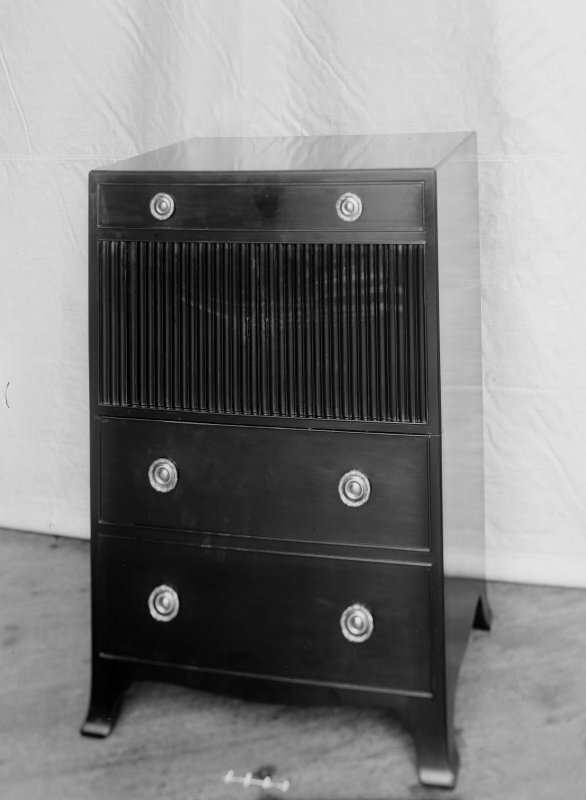 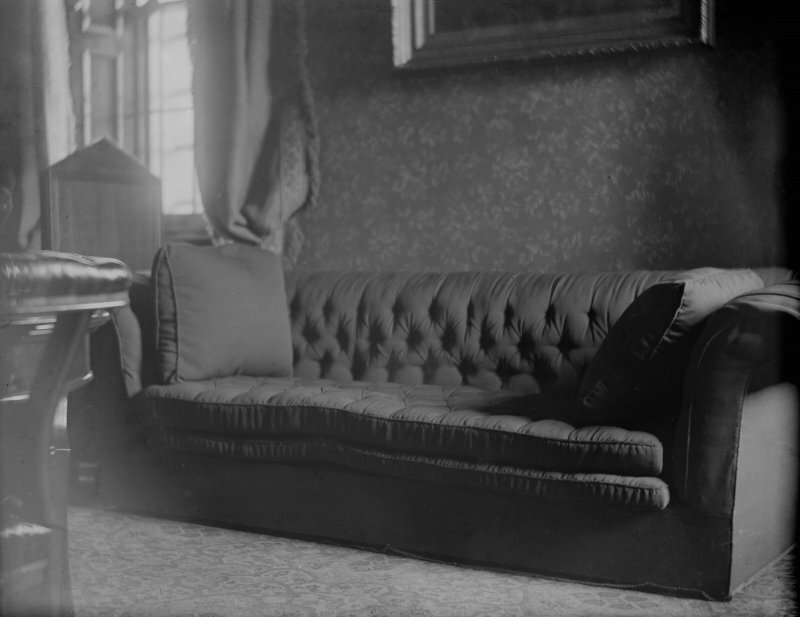 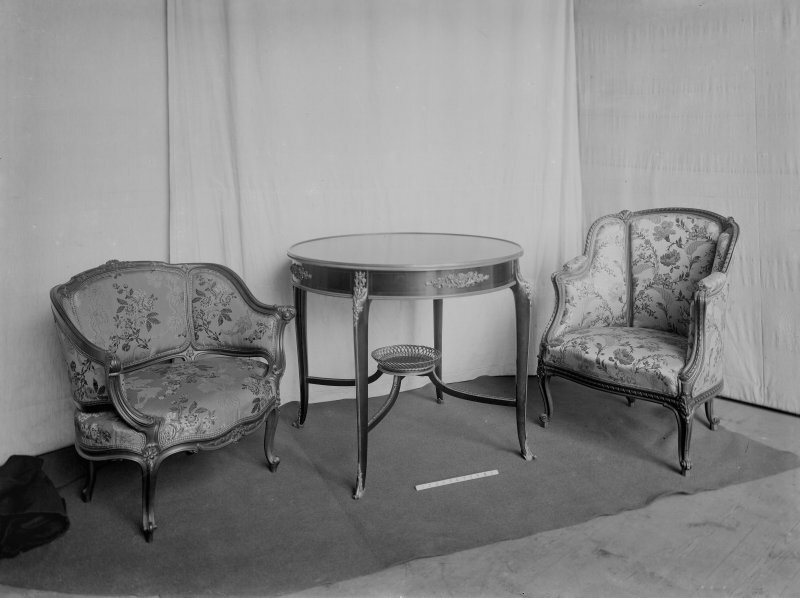 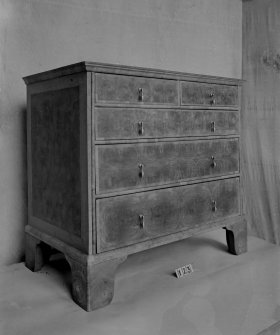 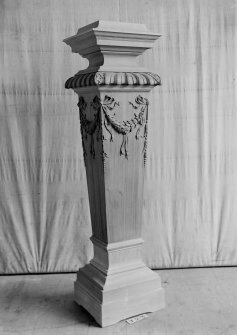 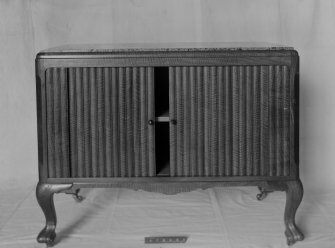 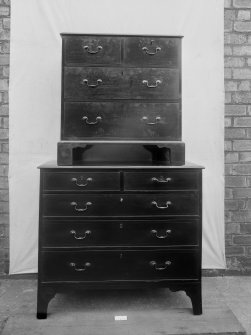 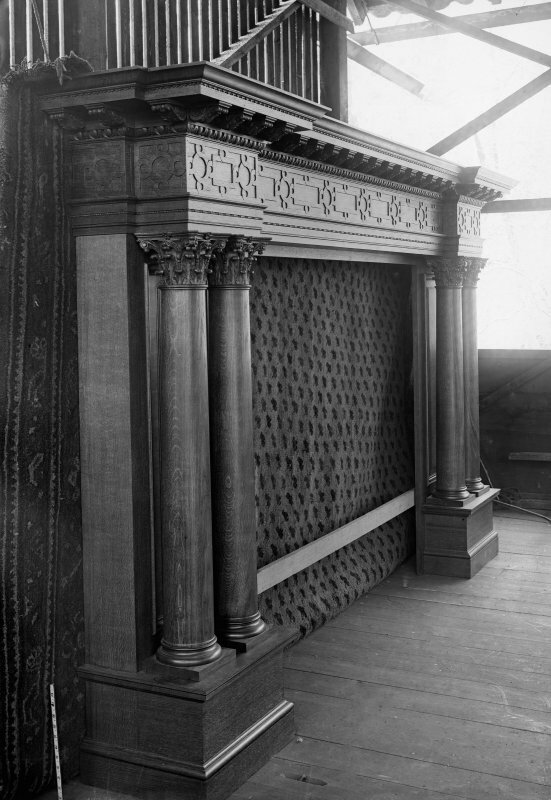 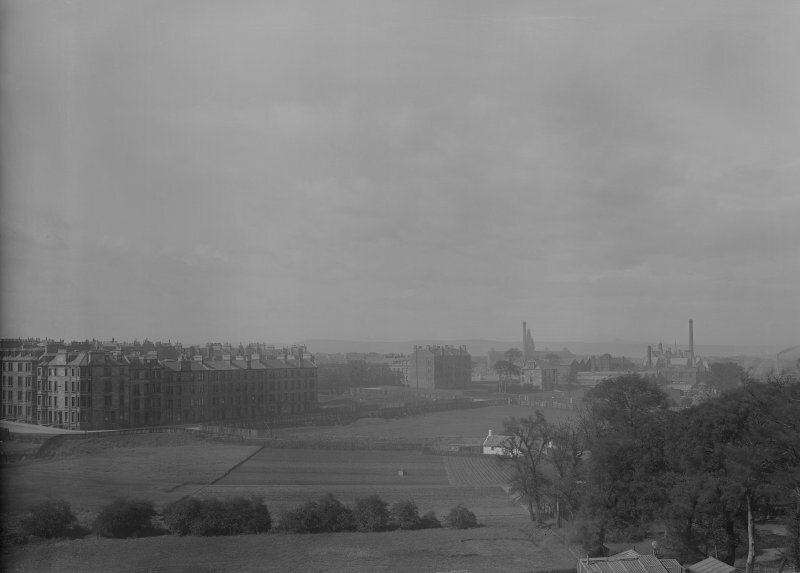 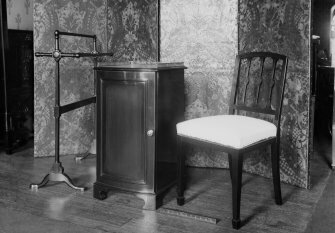 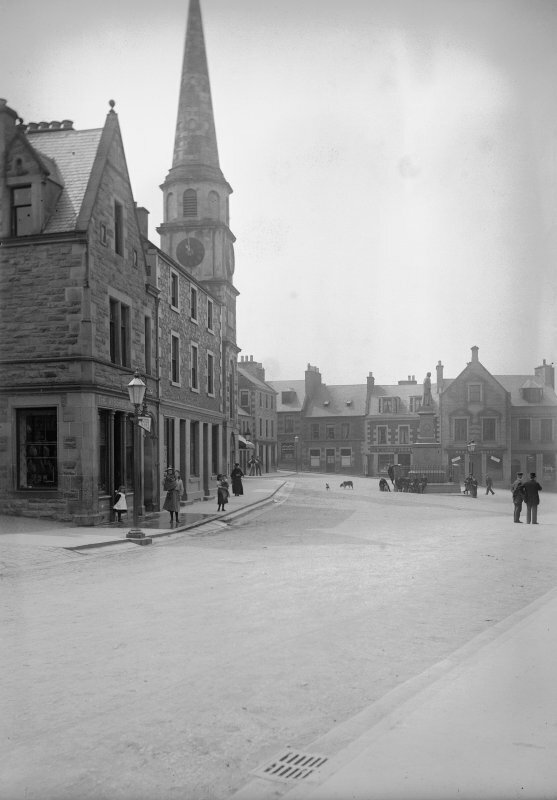 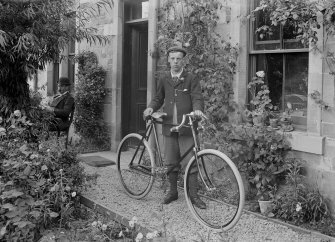 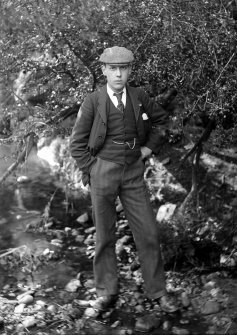 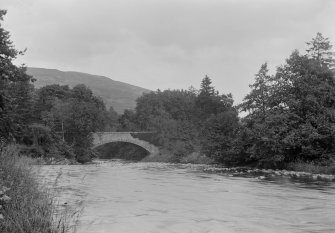 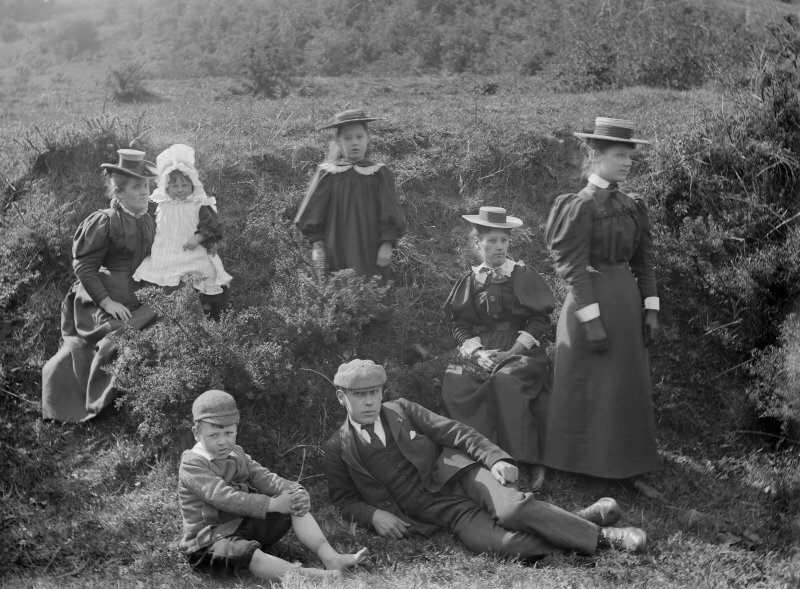 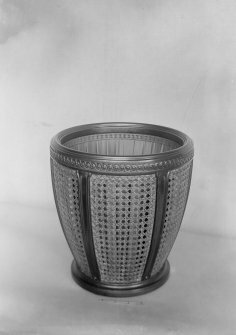 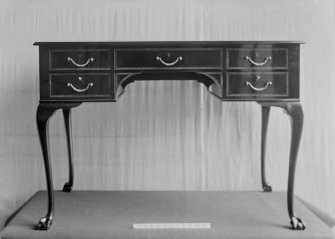 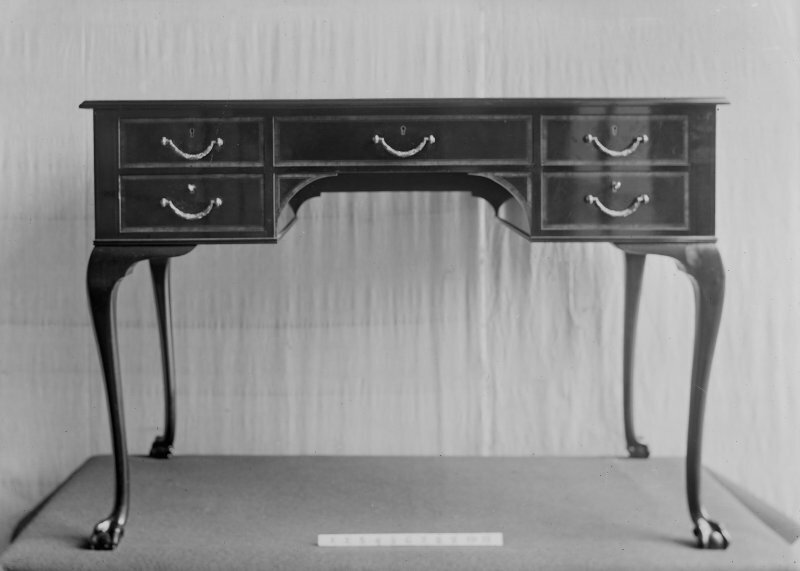 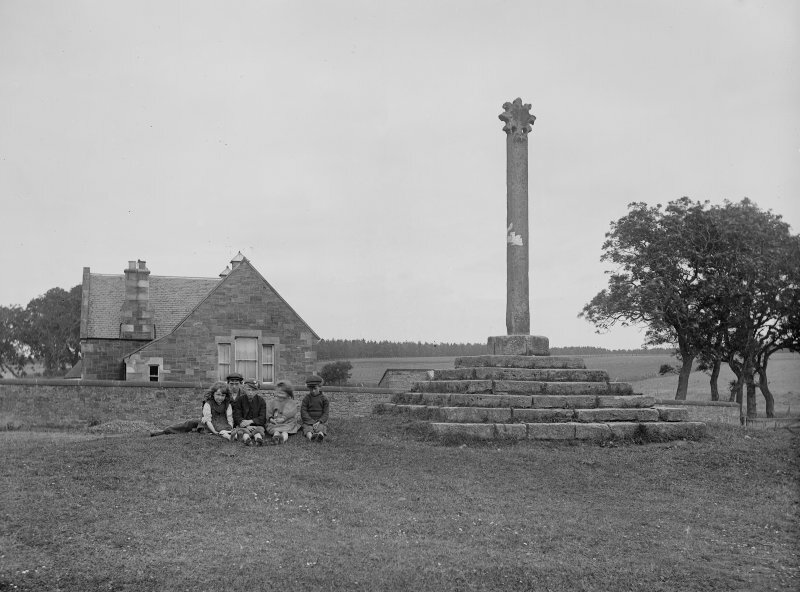 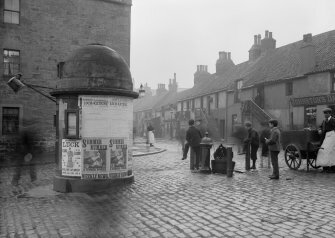 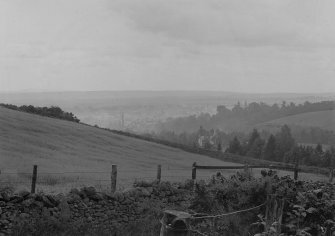 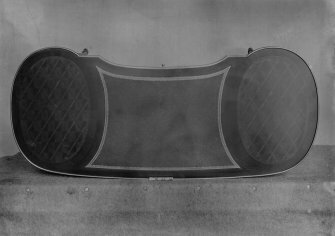 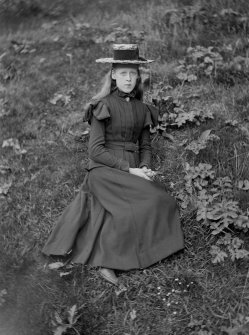 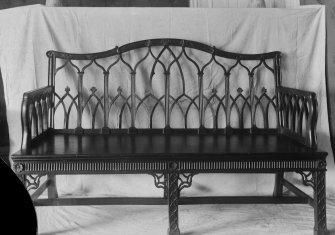 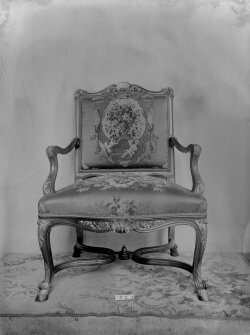 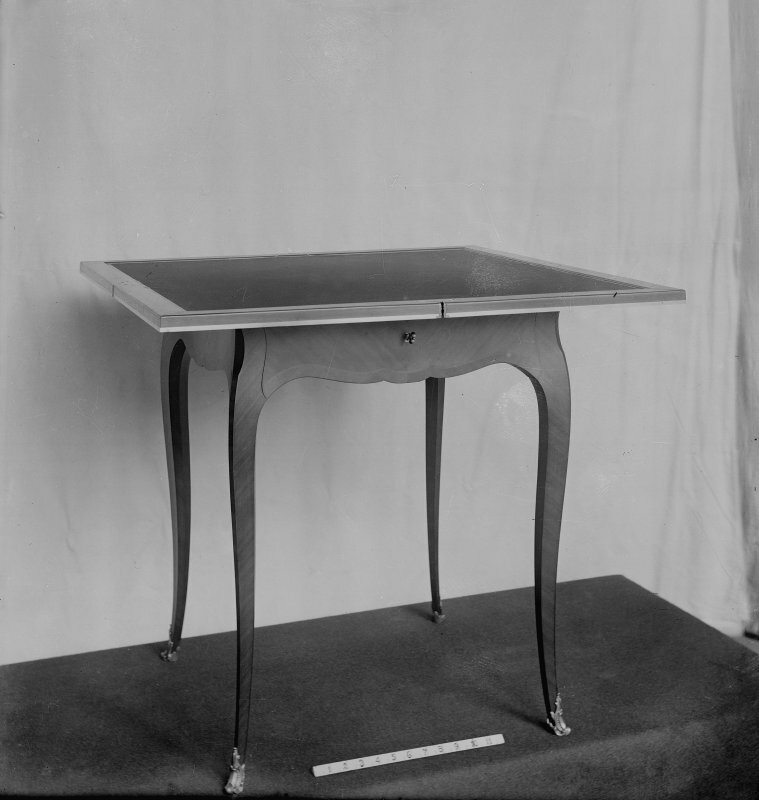 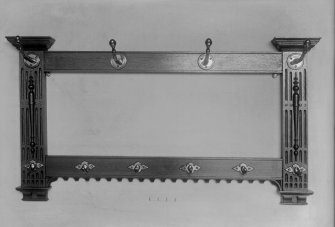 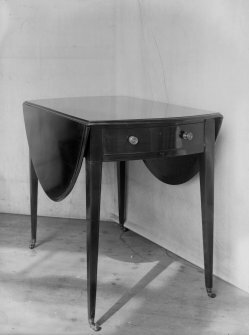 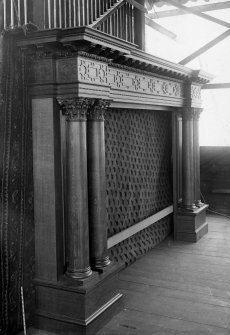 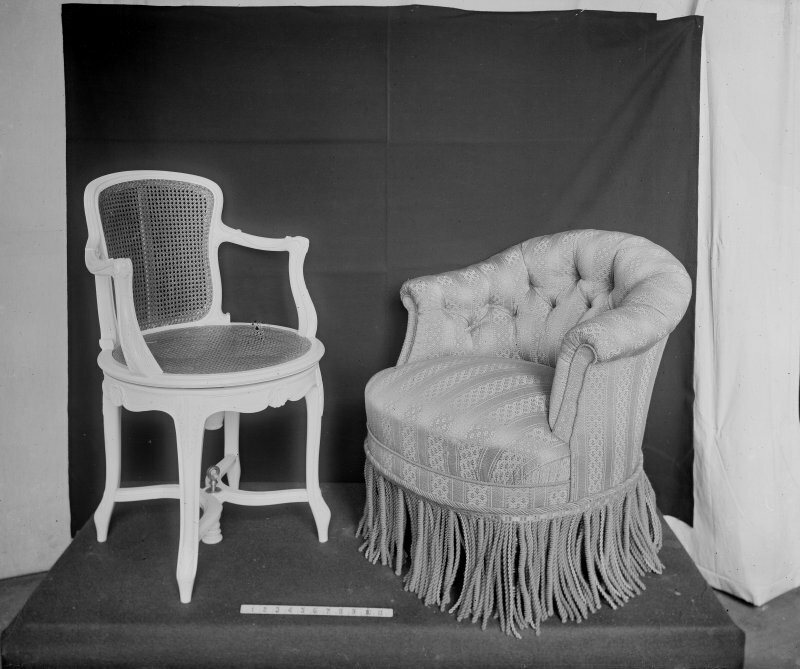 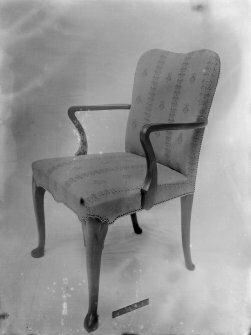 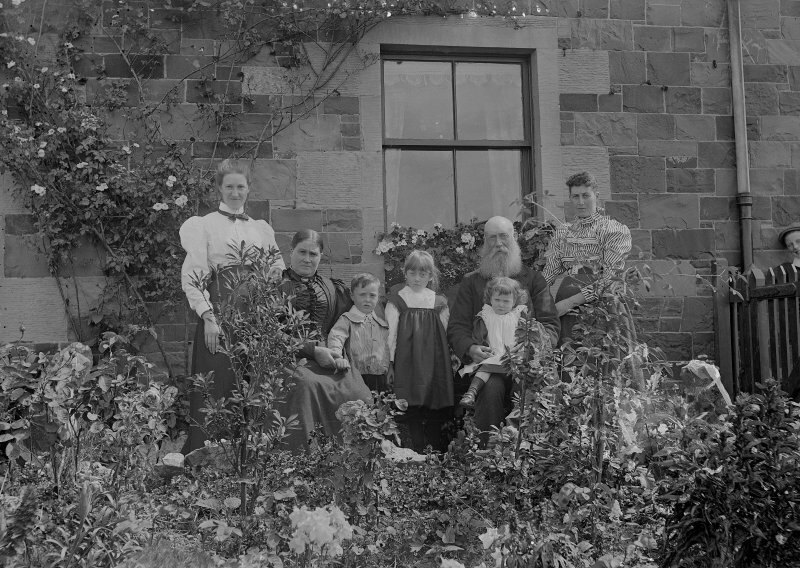 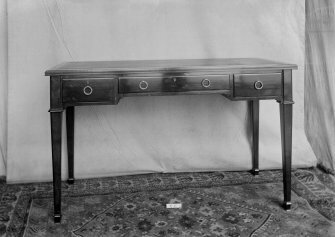 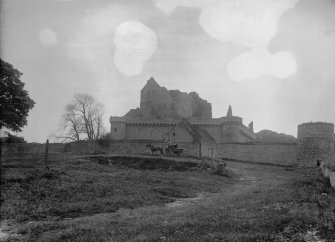 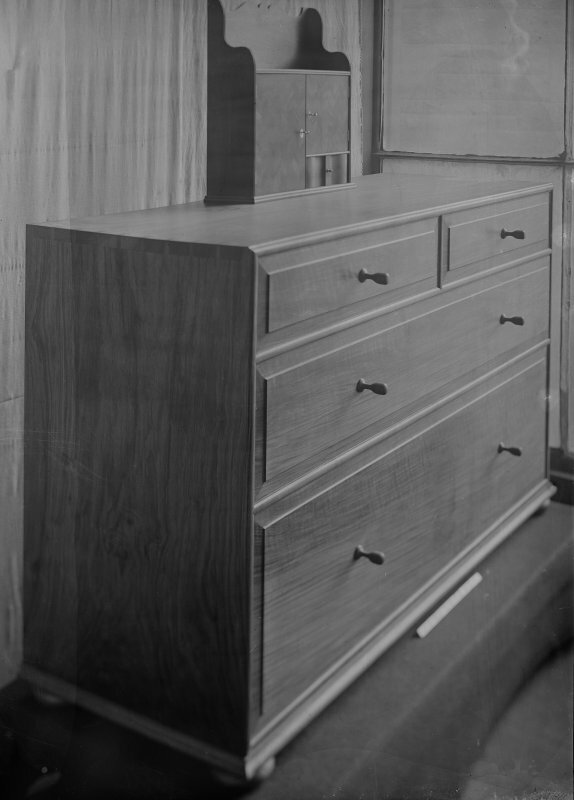 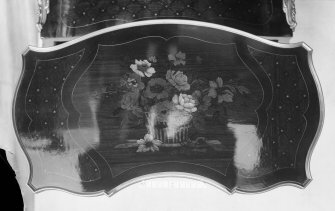 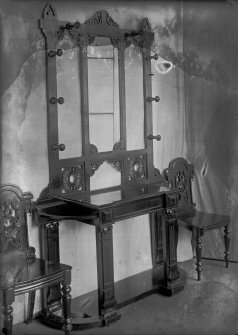 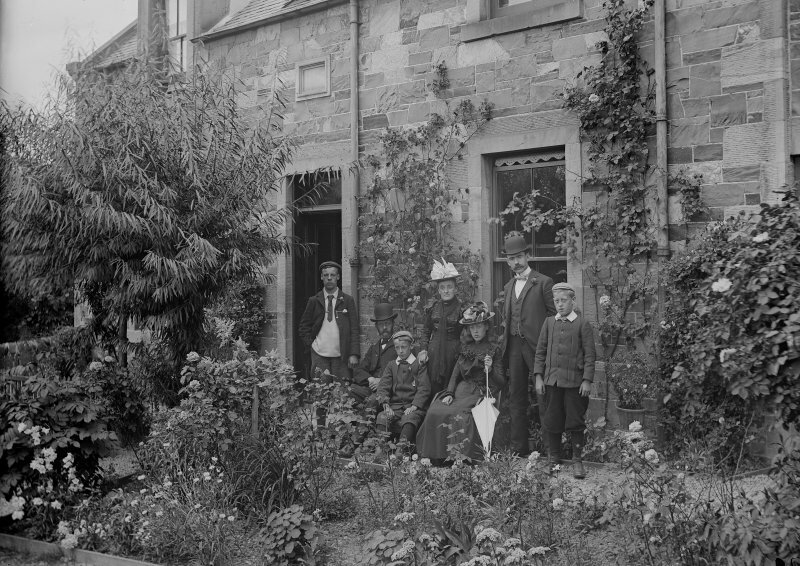 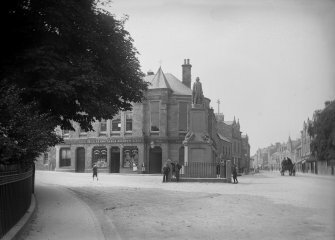 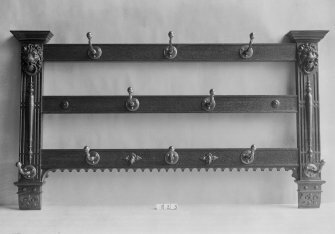 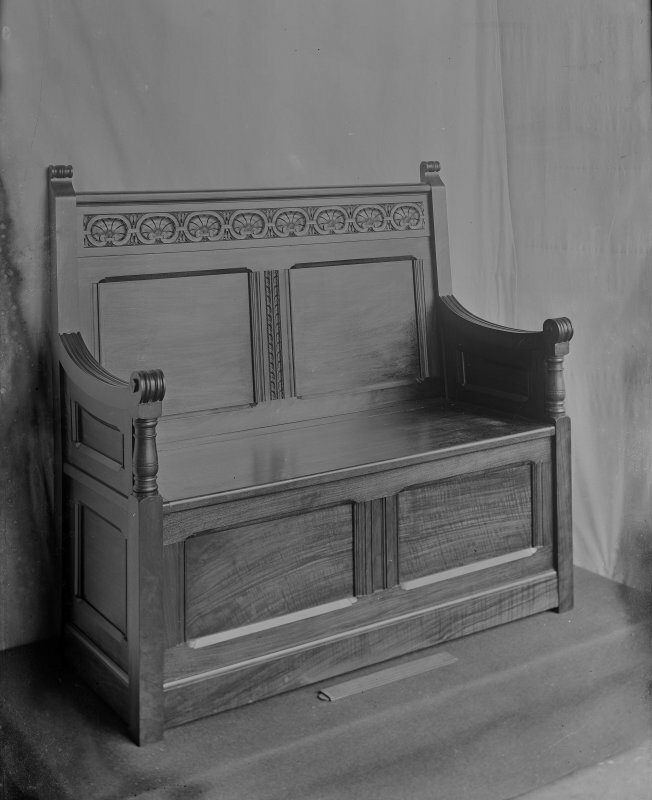 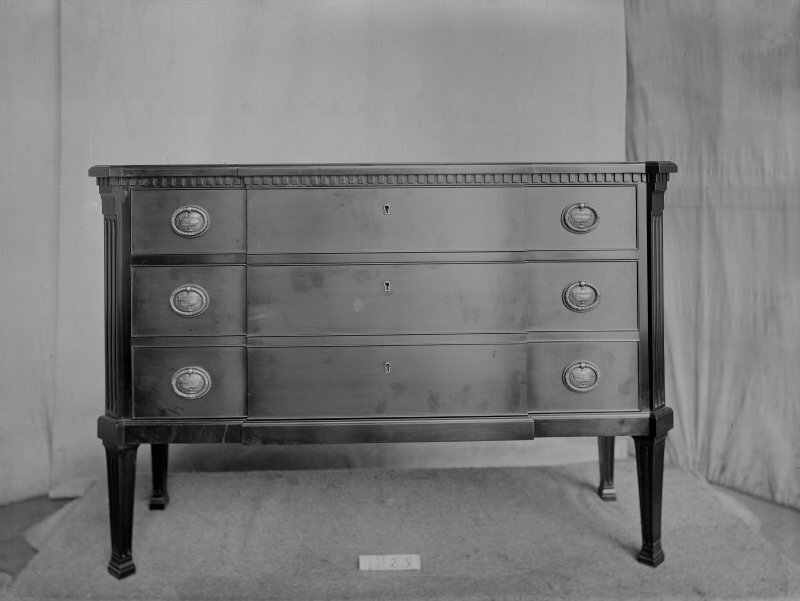 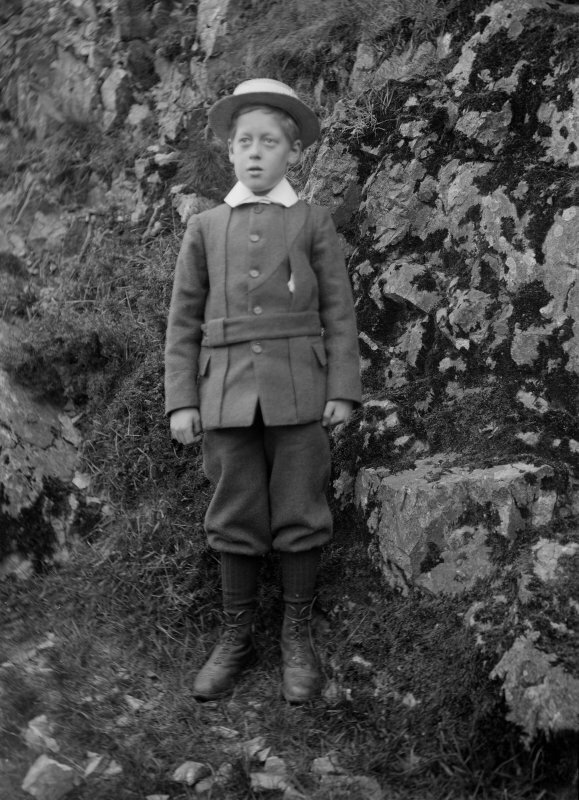 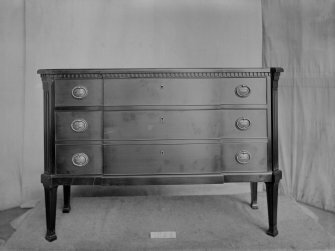 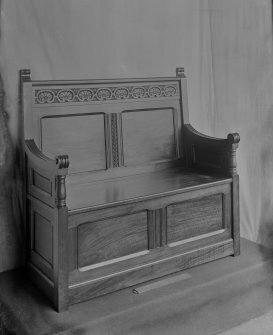 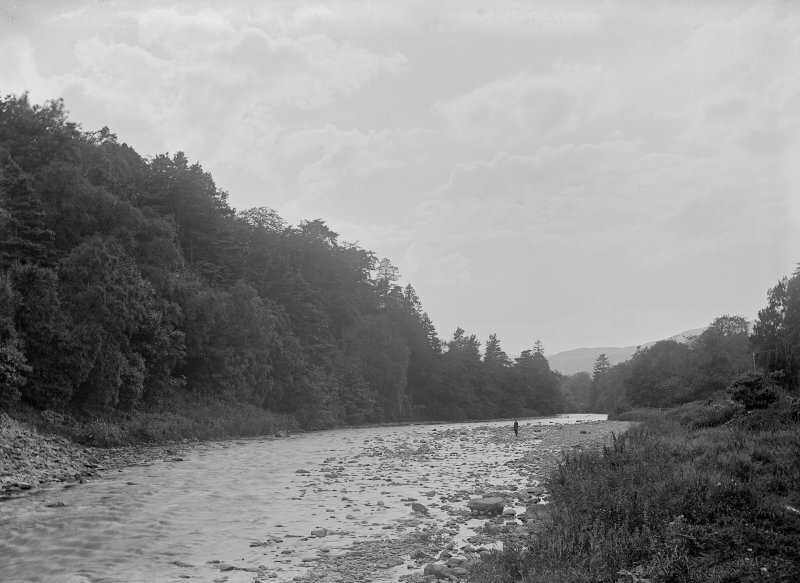 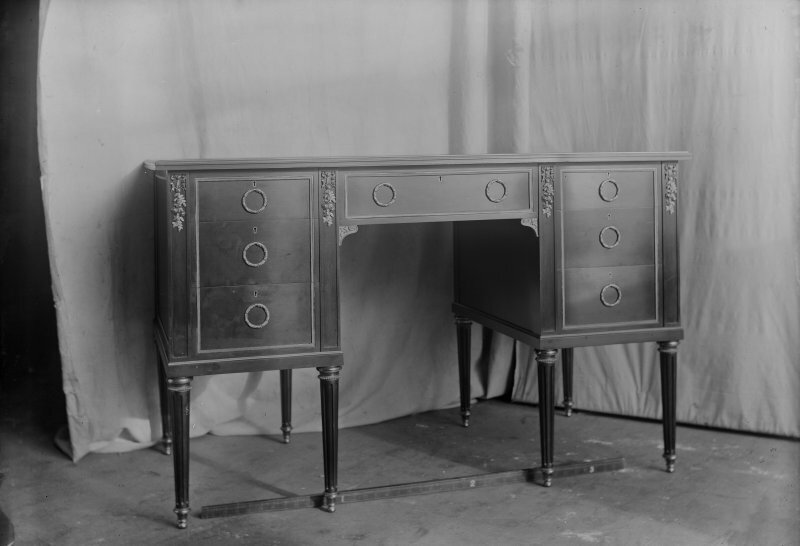 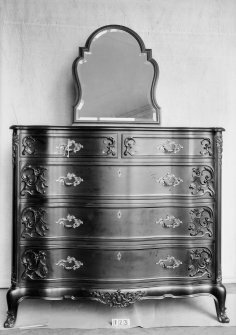 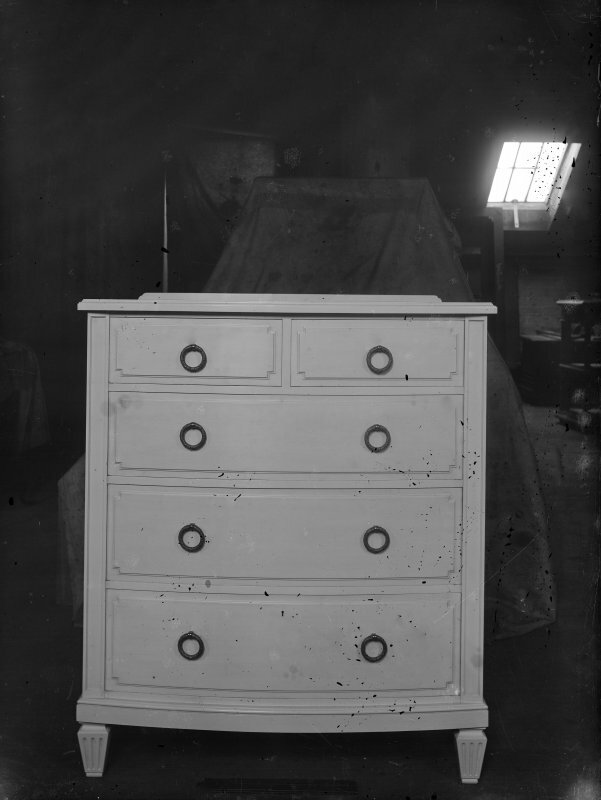 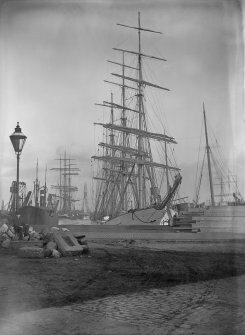 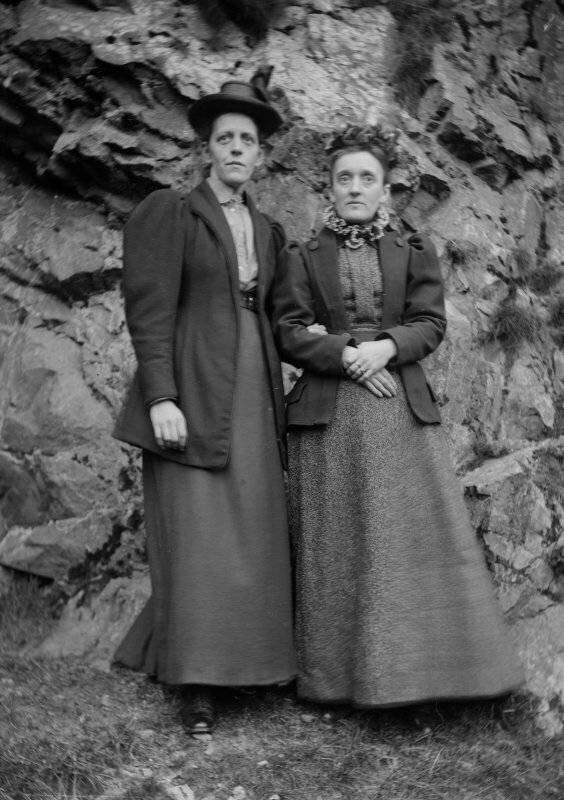 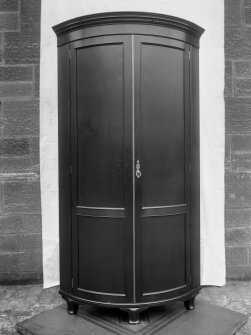 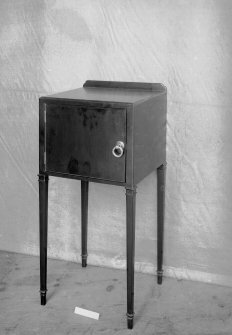 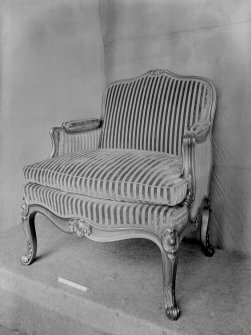 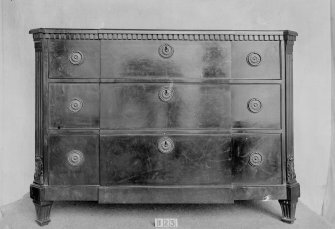 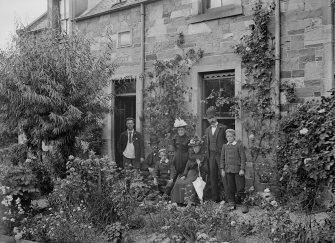 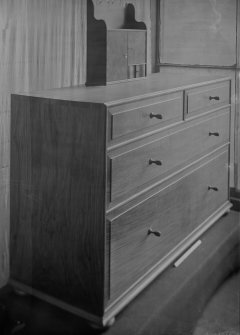 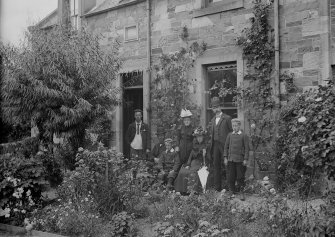 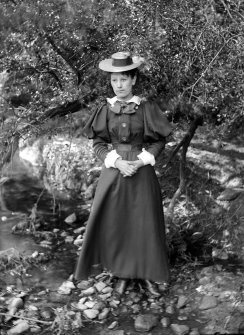 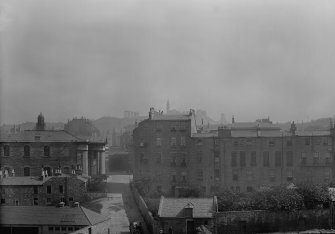 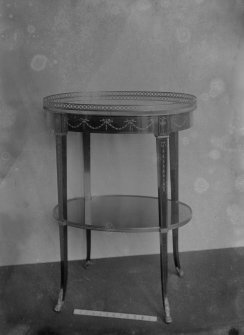 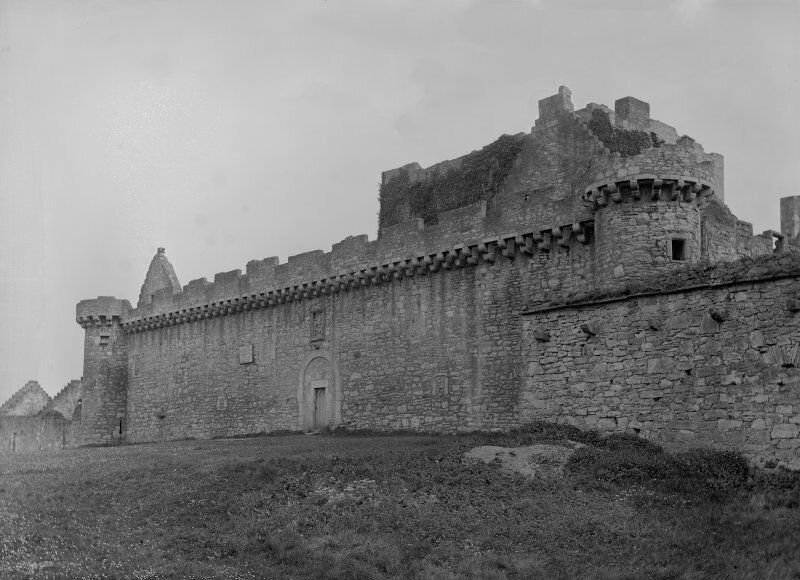 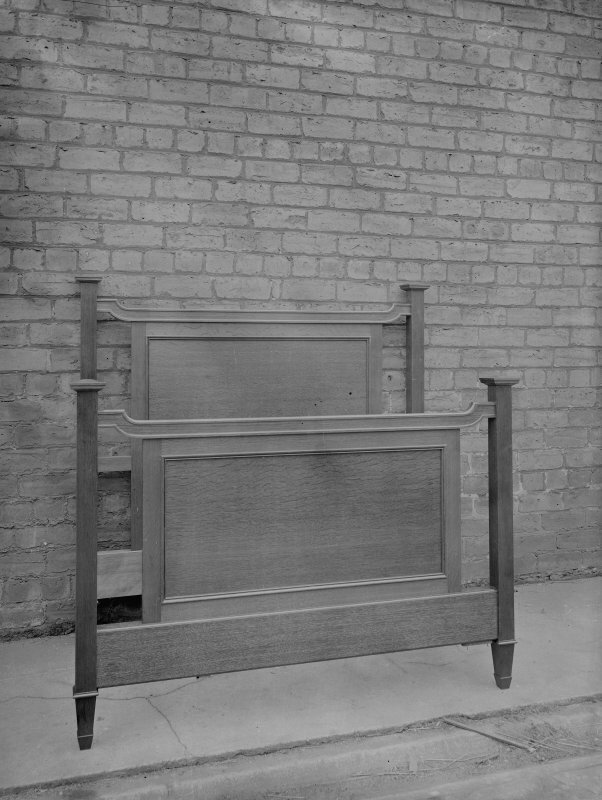 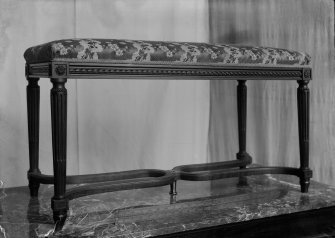 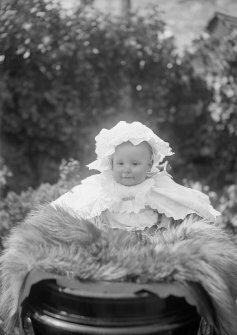 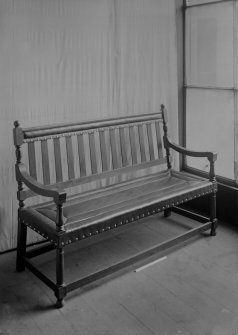 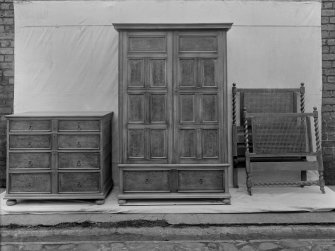 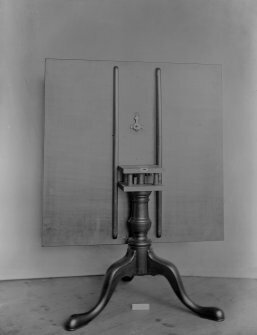 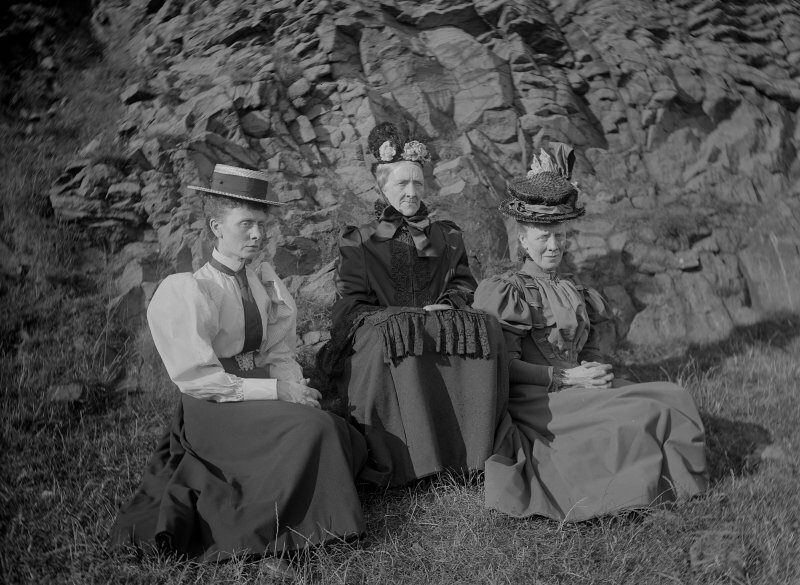 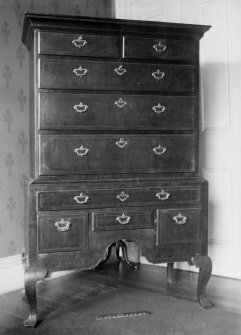 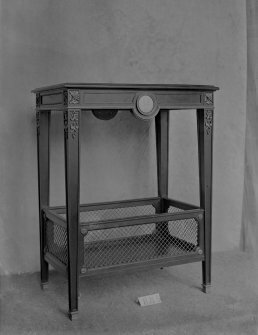 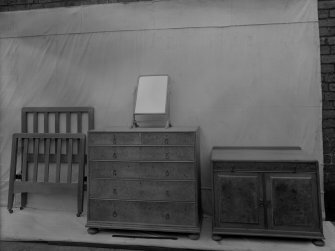 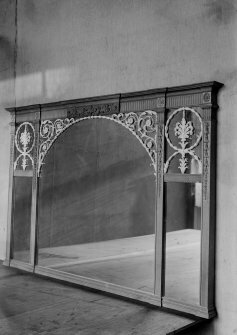 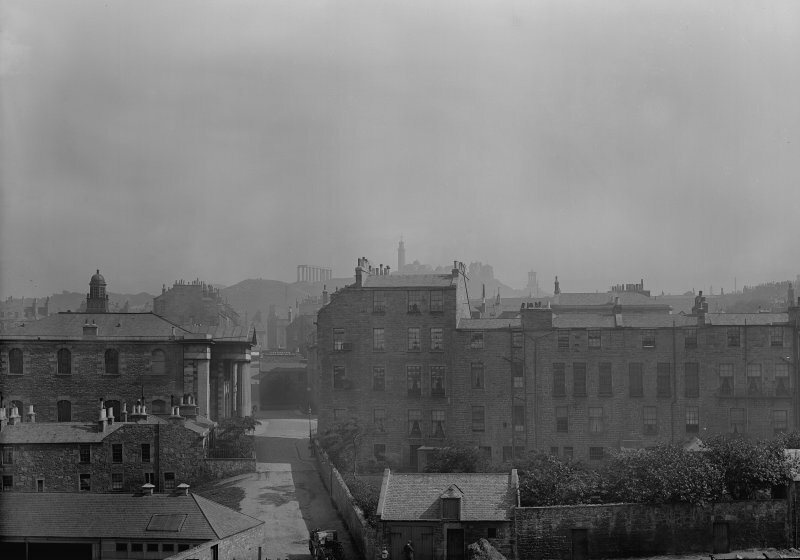 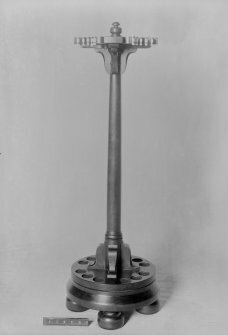 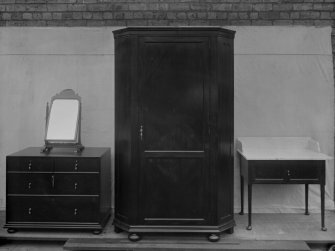 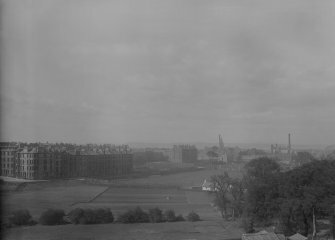 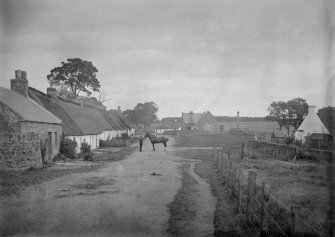 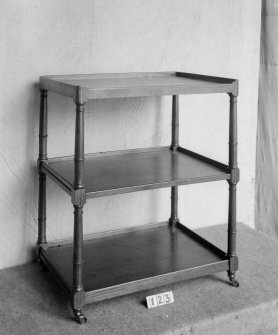 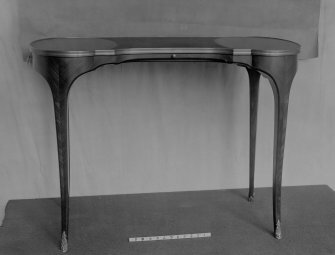 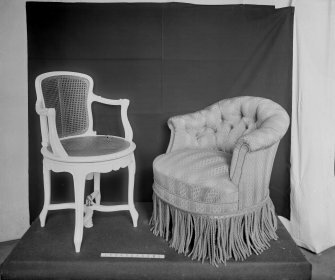 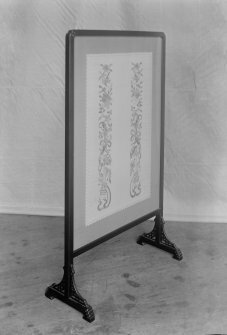 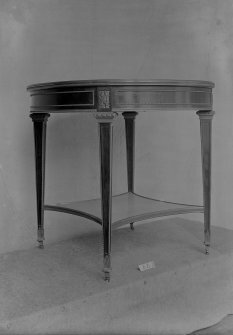 RCAHMS has an extensive collection of drawings and photographs from this company including 13 wooden storage boxes containing 562 original glass plate negatives mainly showing furniture but also family photographs. 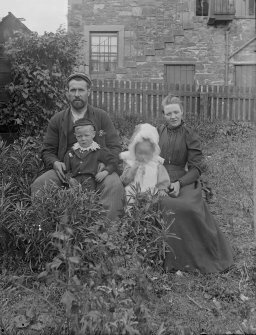 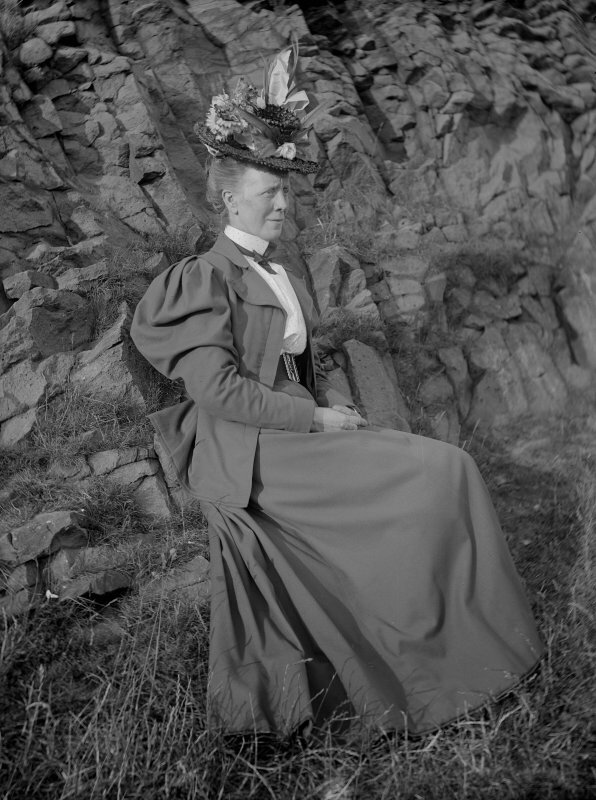 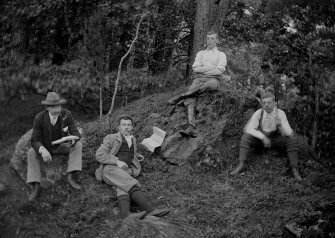 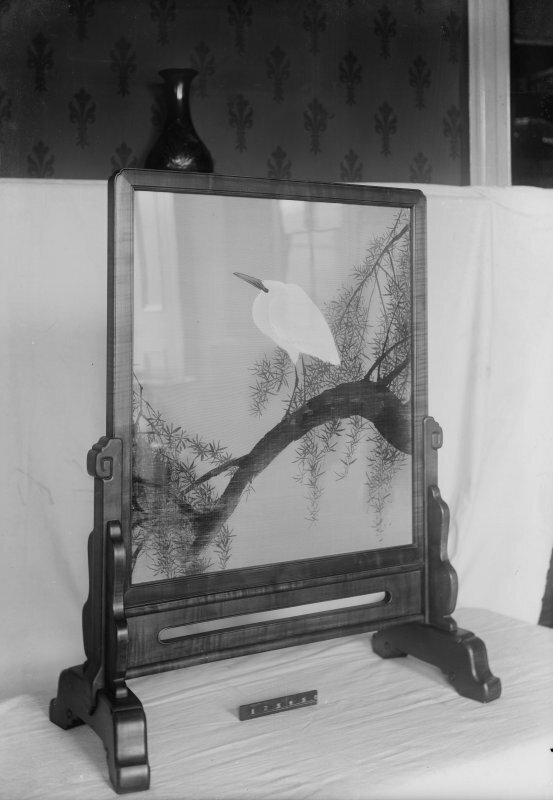 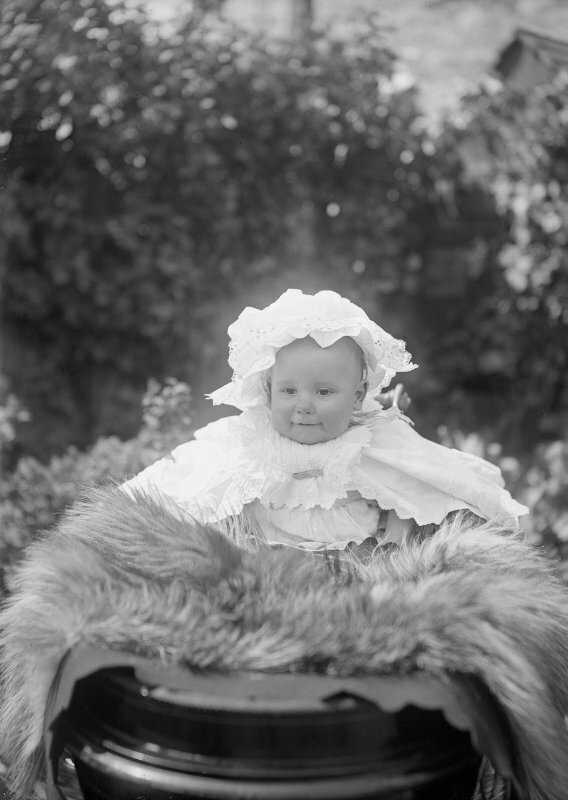 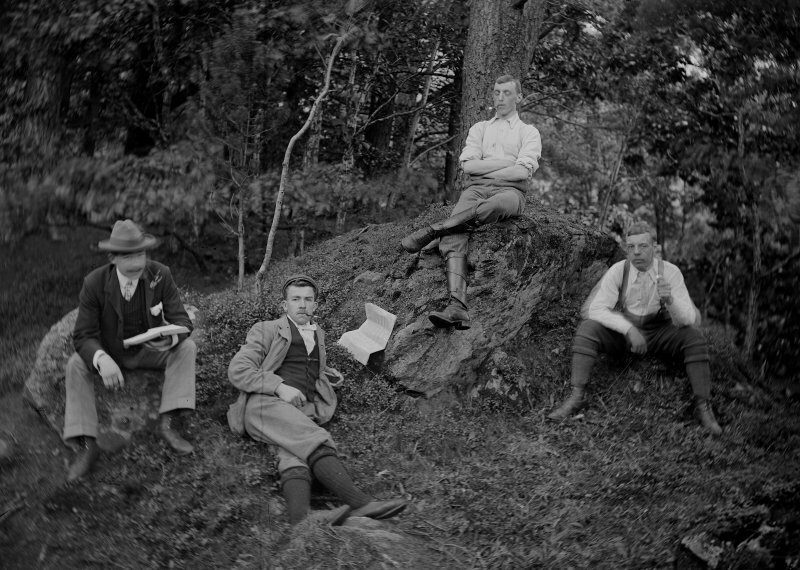 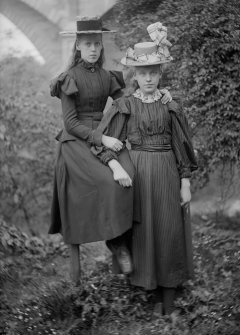 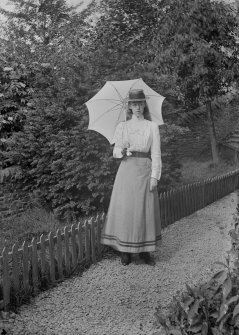 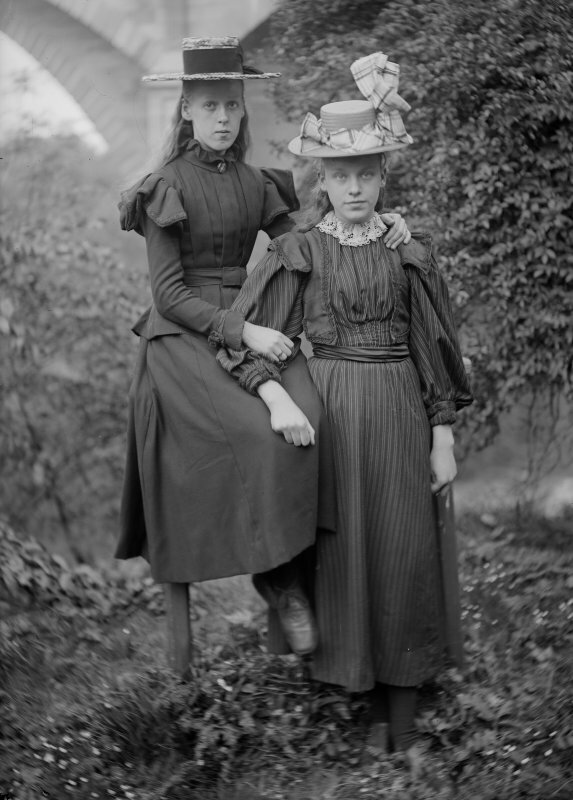 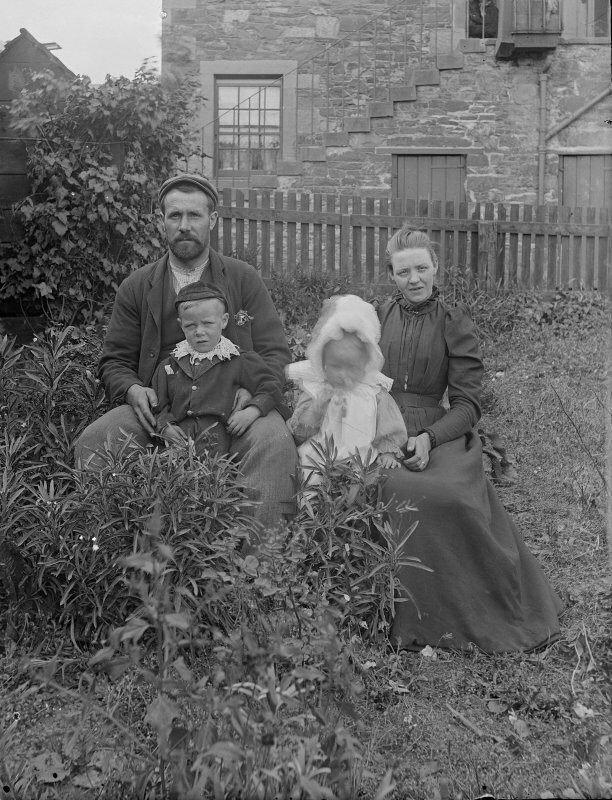 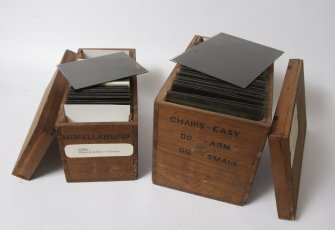 The glass plate negatives have now been digitised as well as rehoused to ensure their long-term preservation. 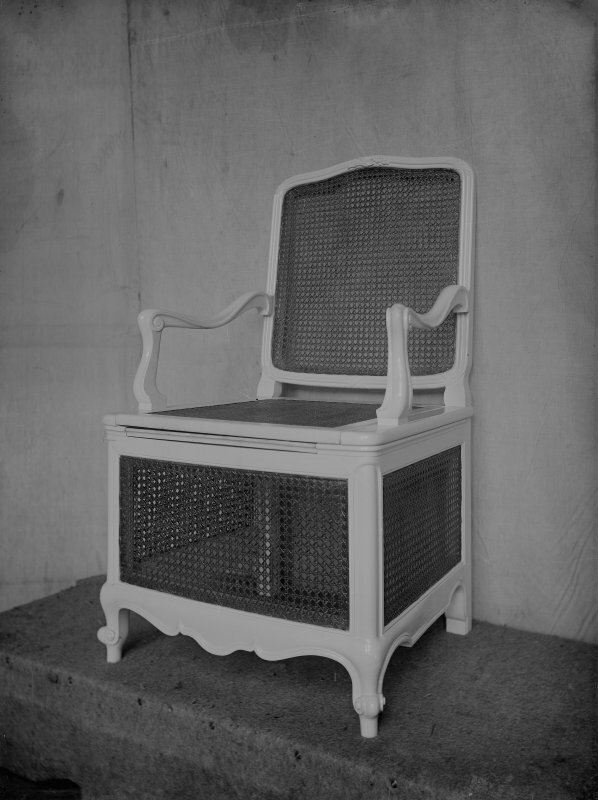 Chair, screen, cupboard & towel rail. 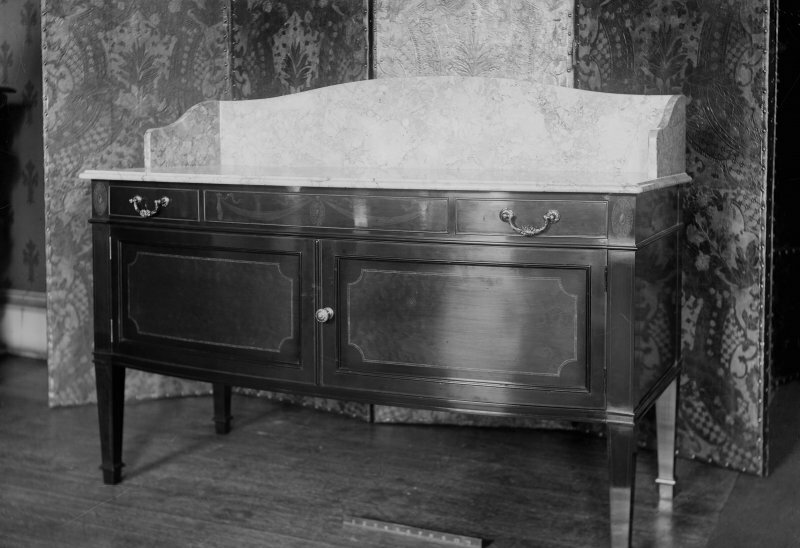 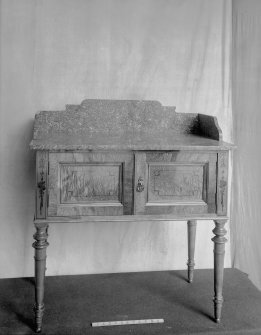 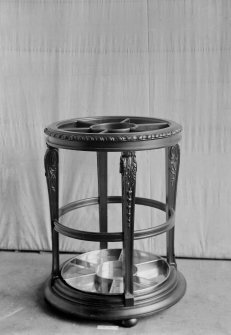 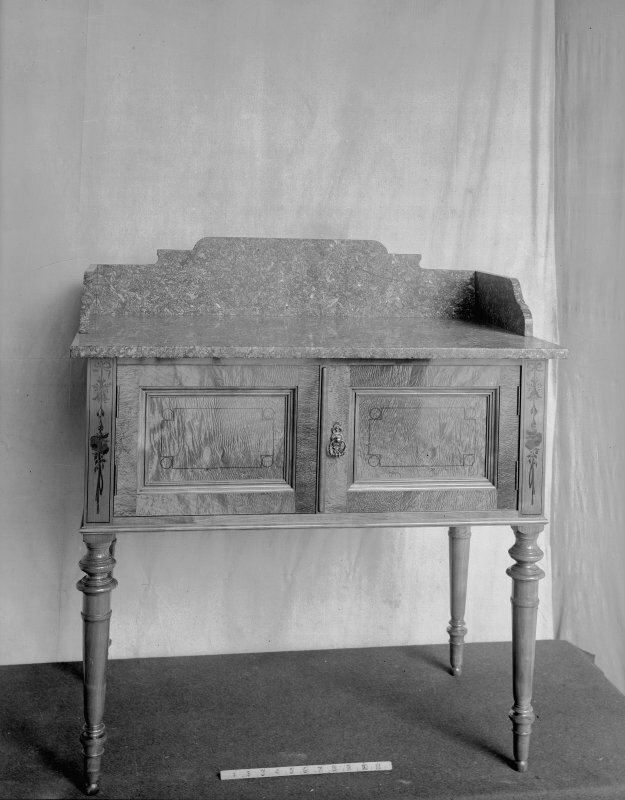 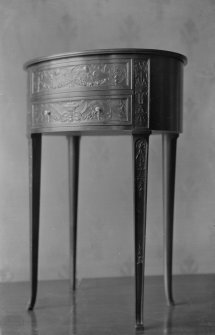 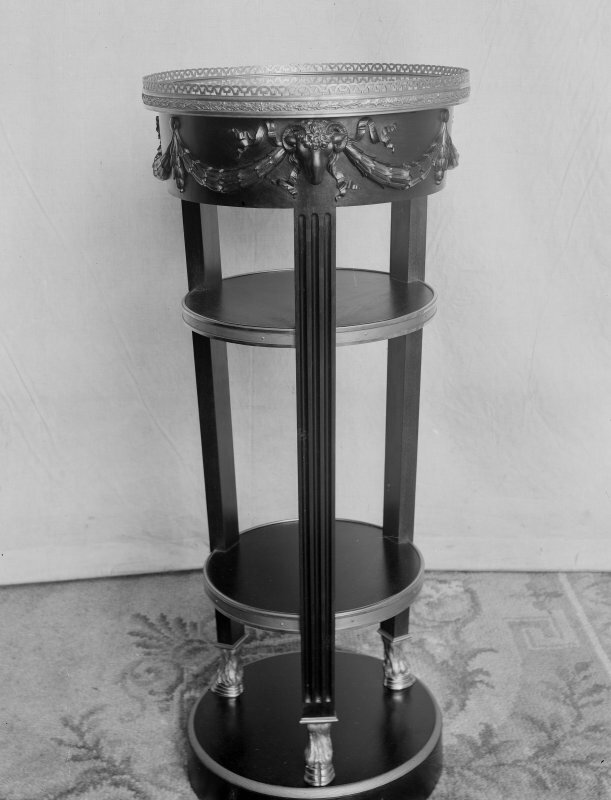 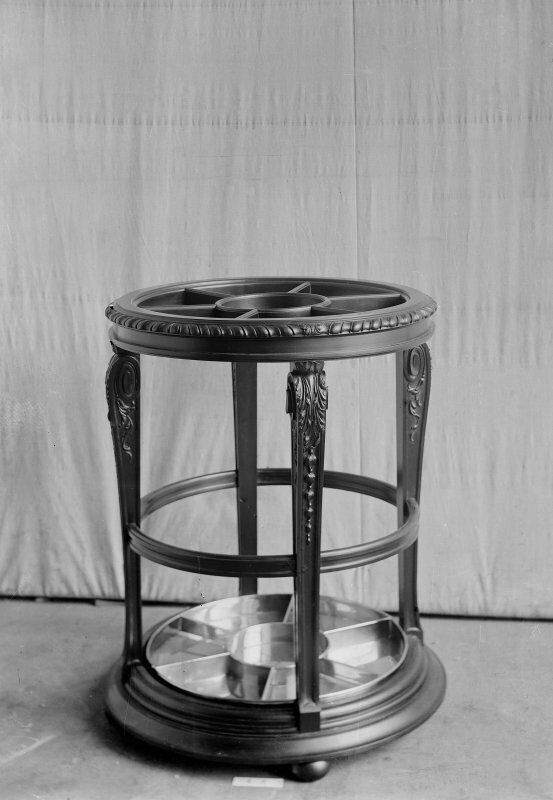 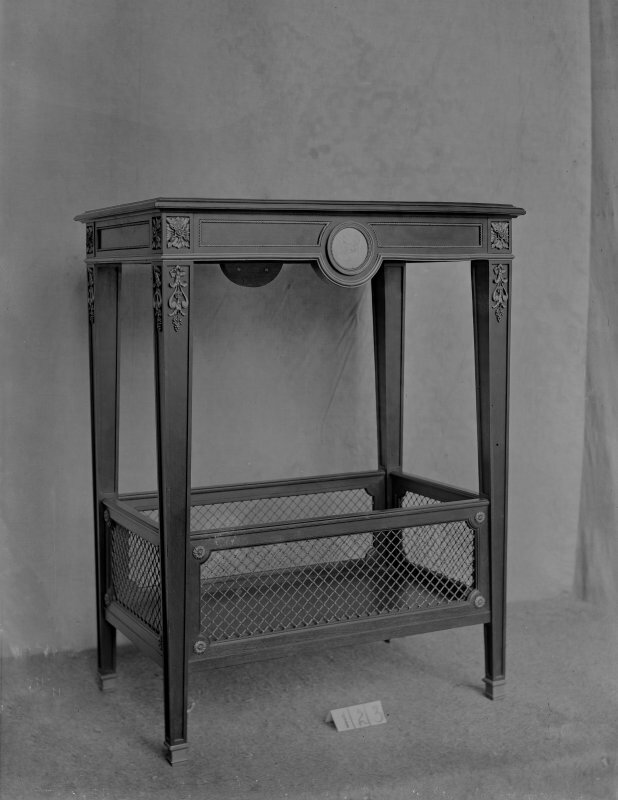 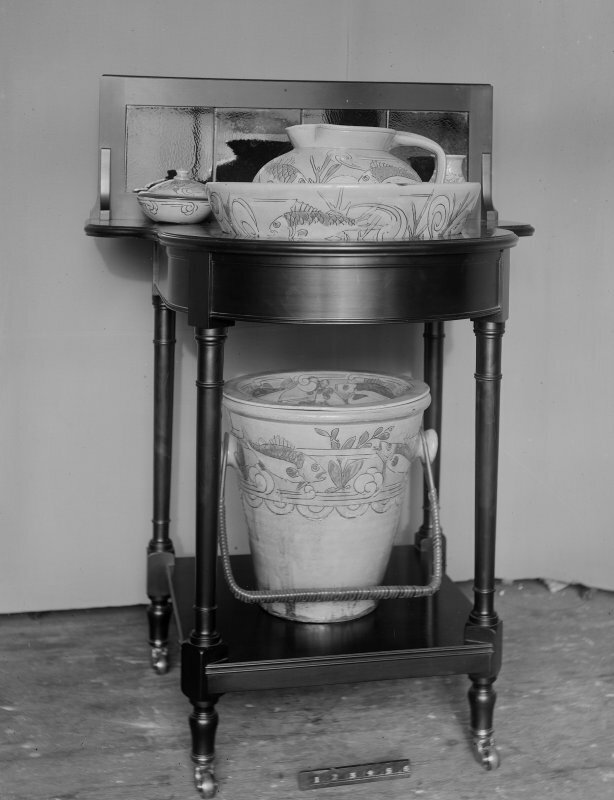 Washstand with basin, ewer and pail. 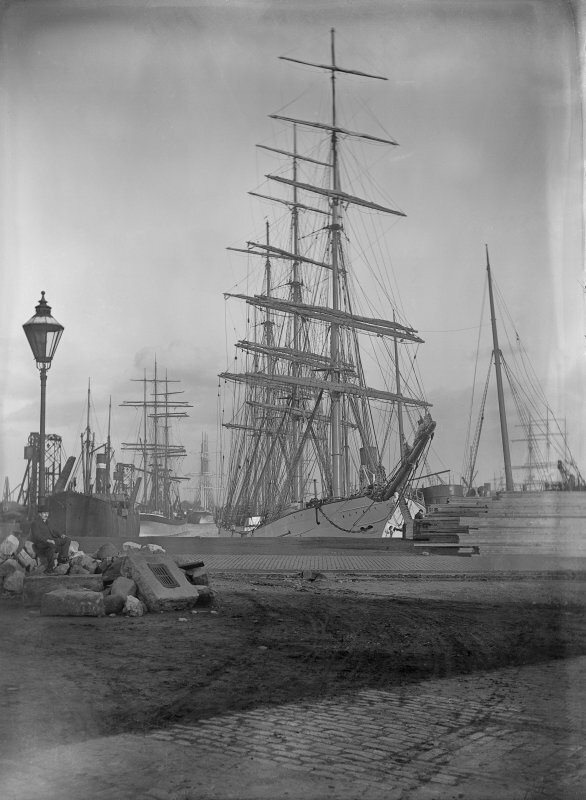 View of tall ship the "Altair" in unidentified harbour. 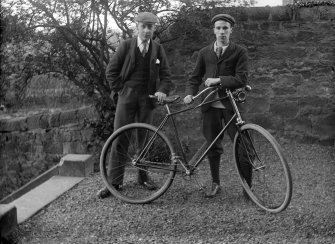 Portrait of two men with bicycle. 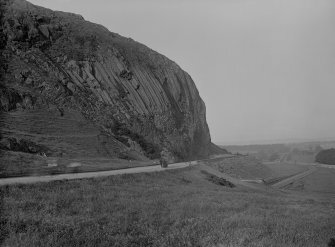 General view, with horse, landau and driver in front. 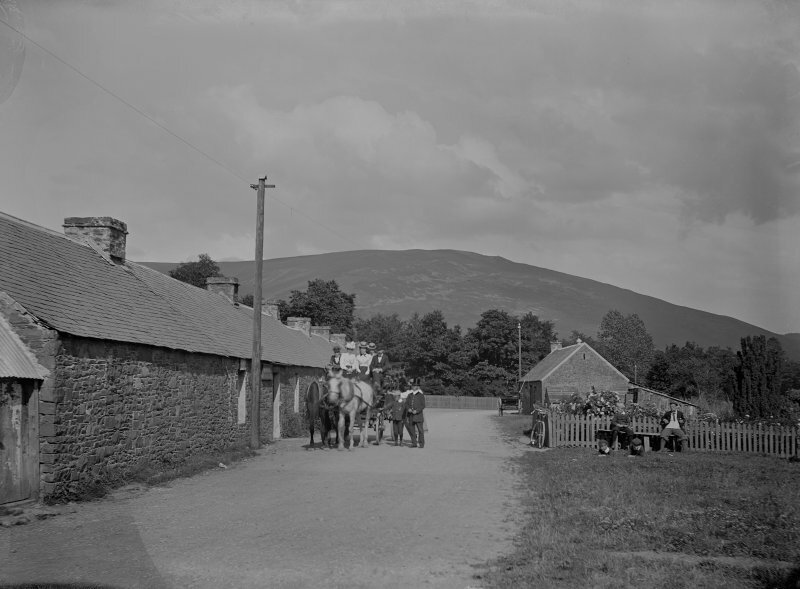 Village street view with open topped carriage. View of monument to Mungo Park. 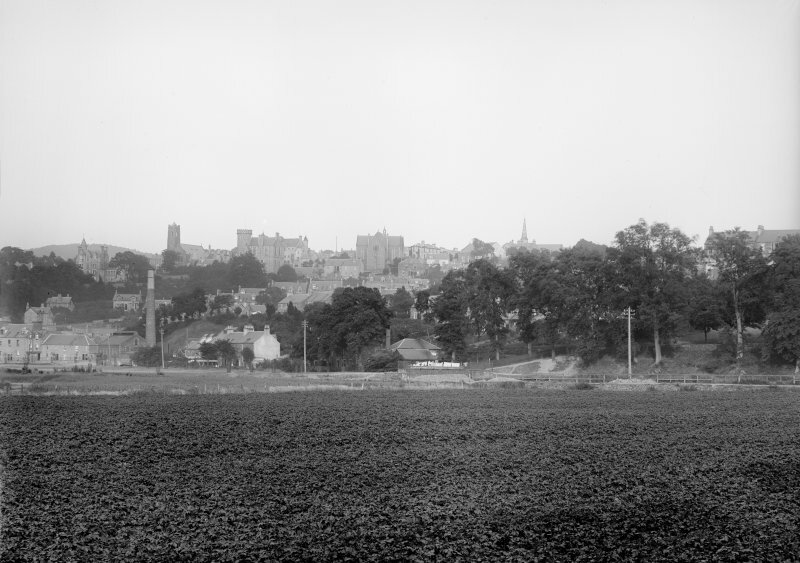 General view of unidentified church ? 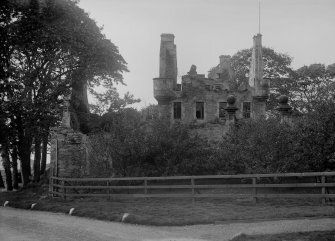 and ruins. 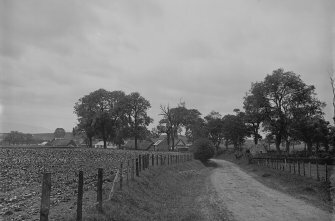 View of farm through trees. 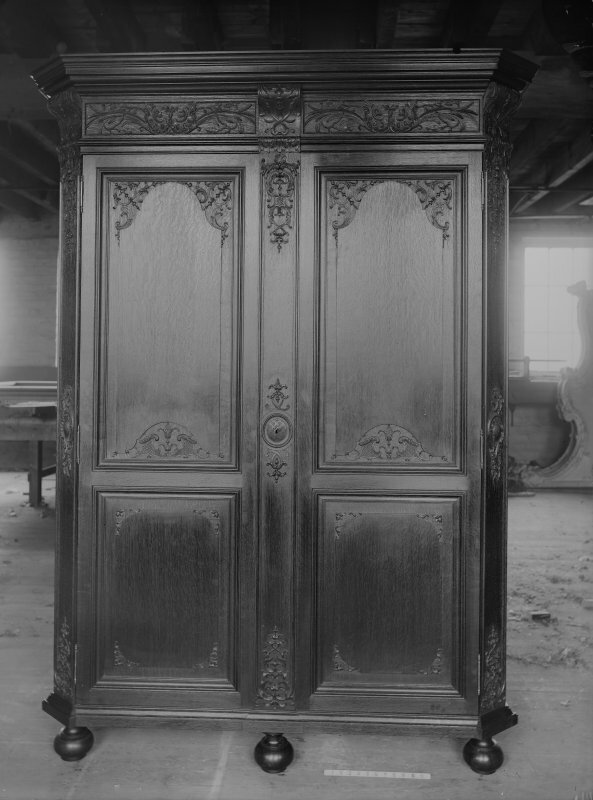 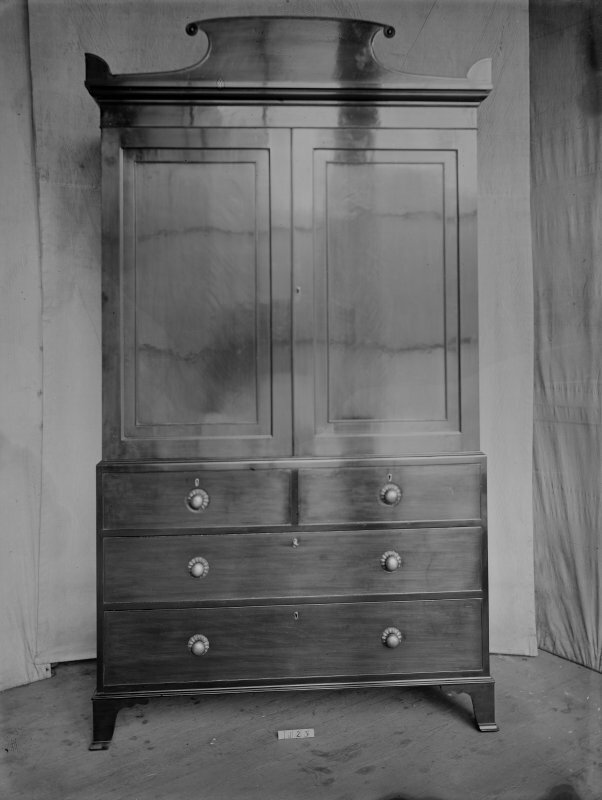 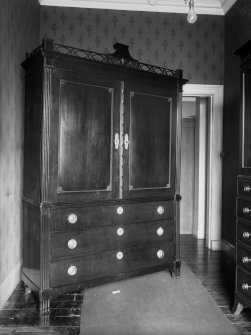 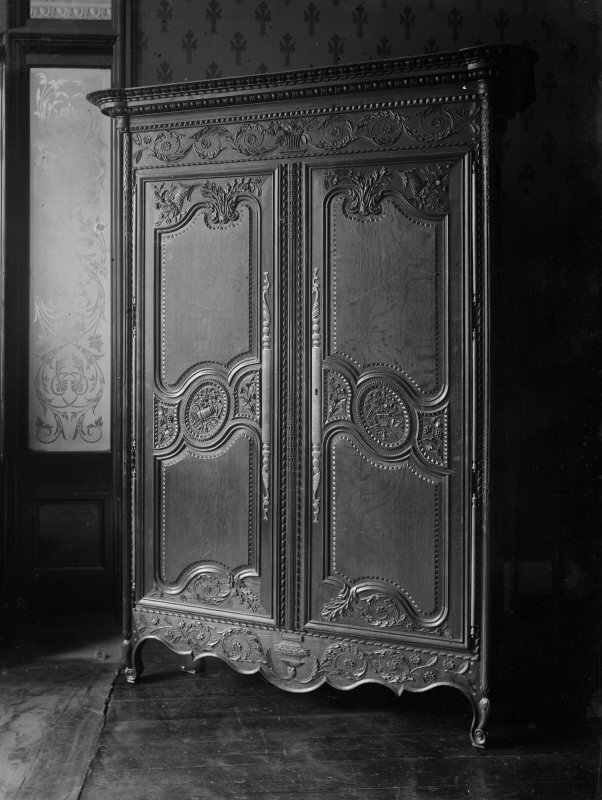 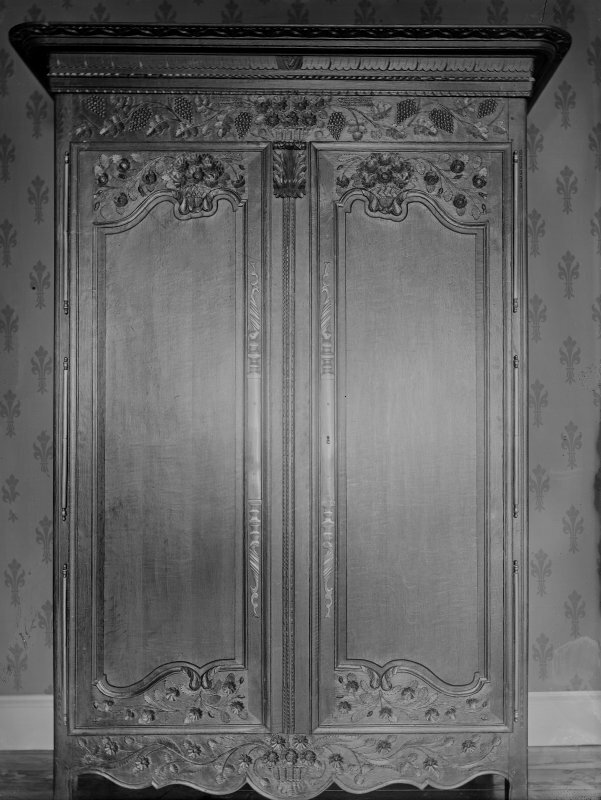 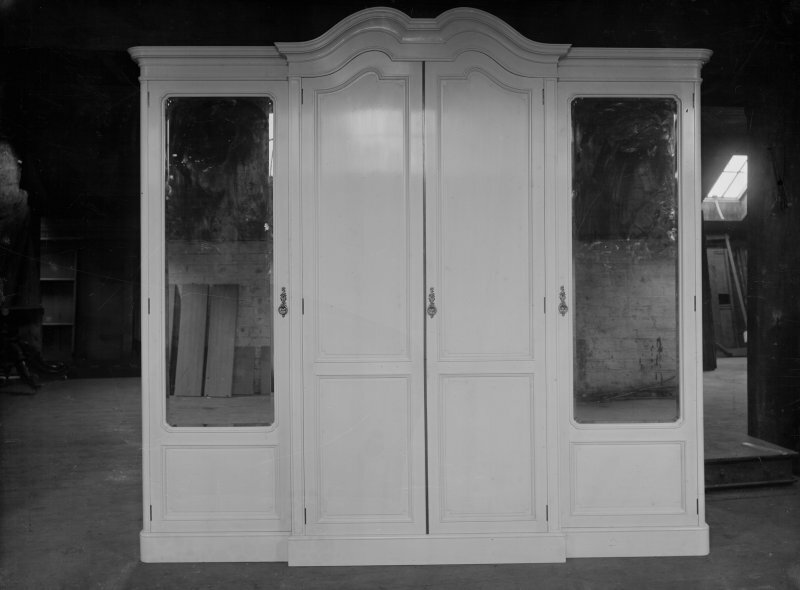 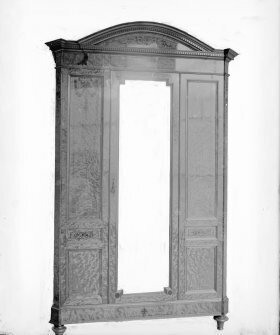 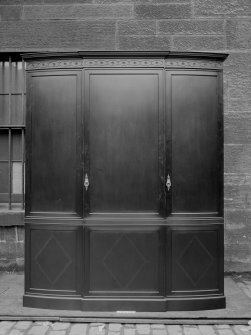 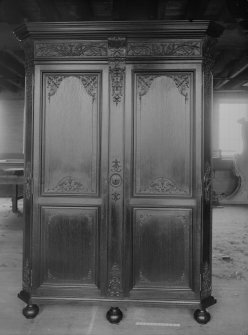 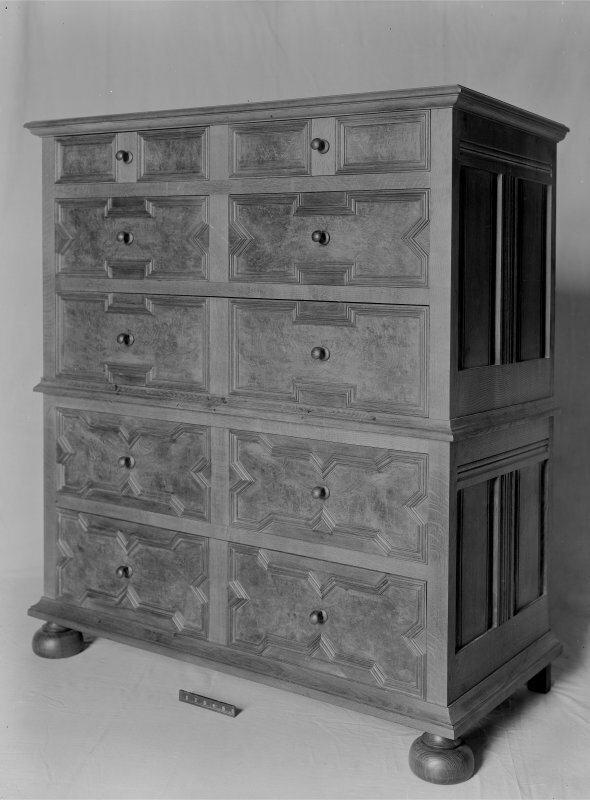 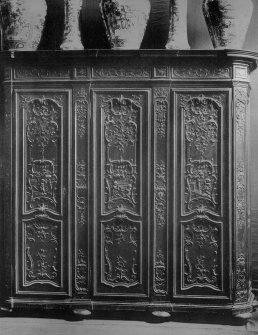 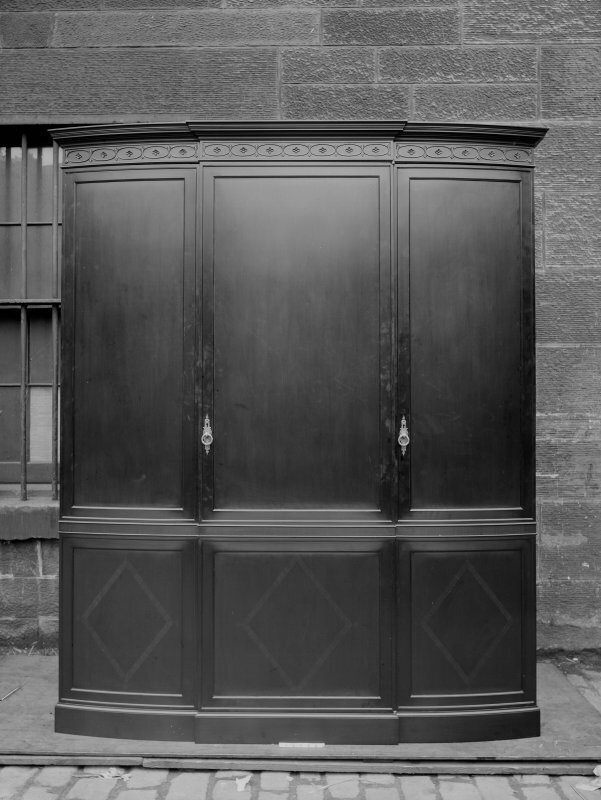 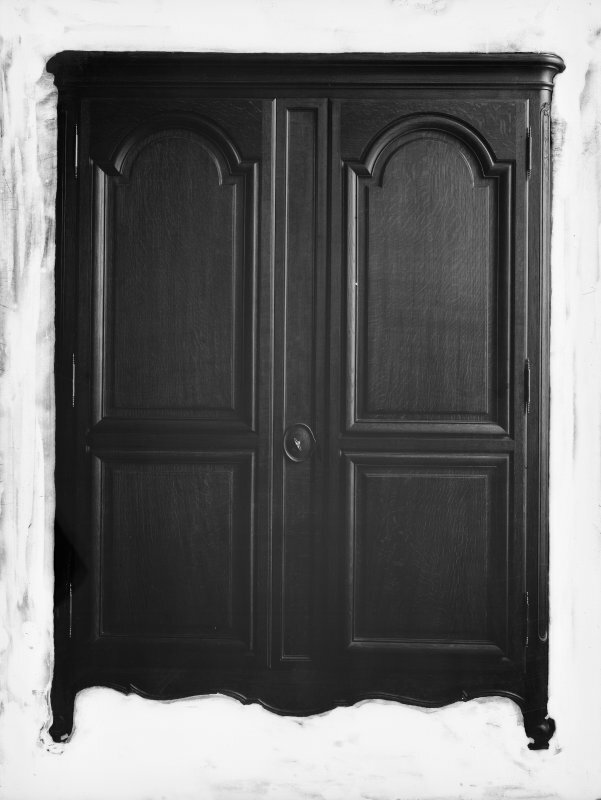 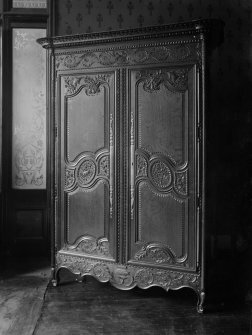 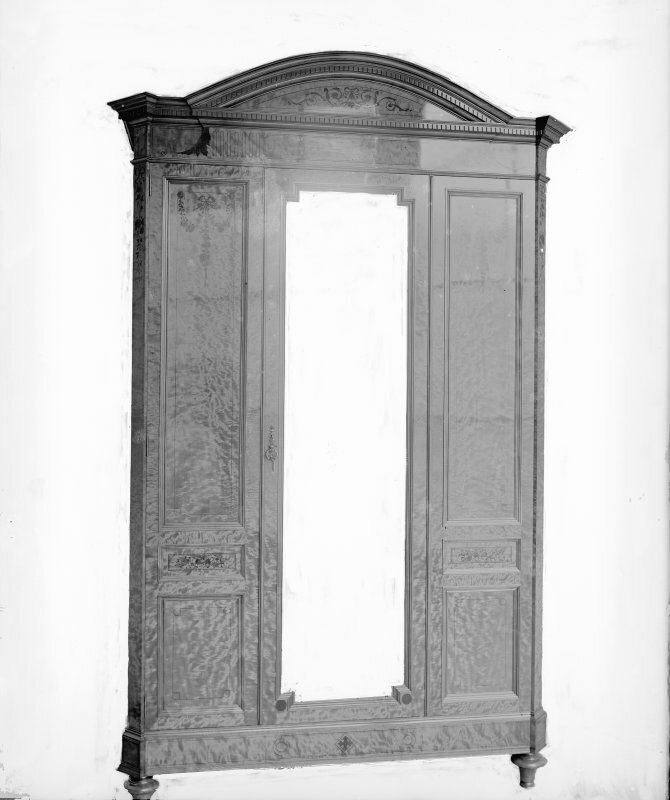 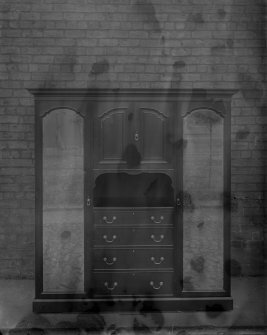 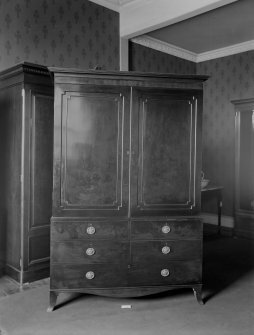 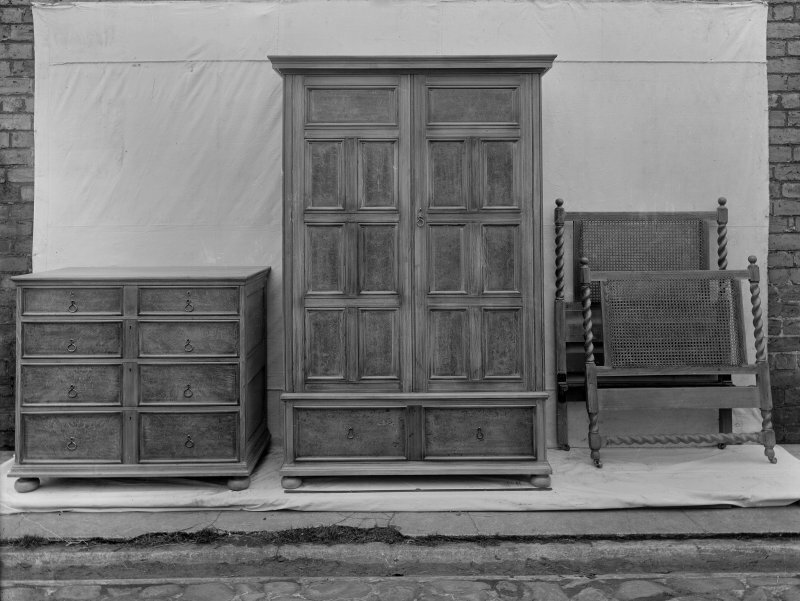 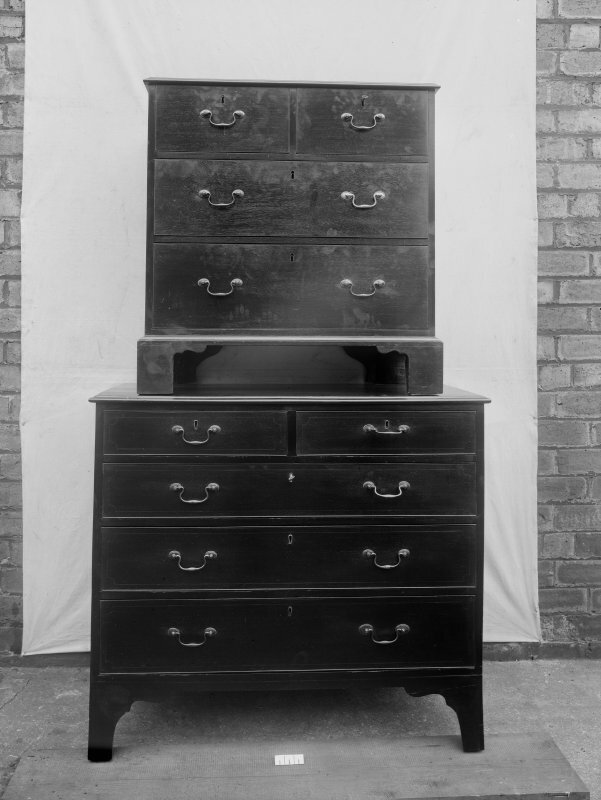 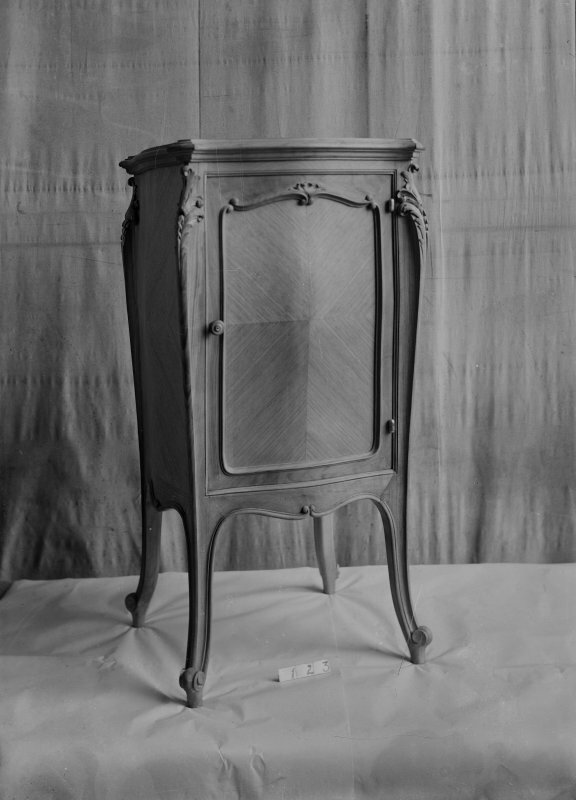 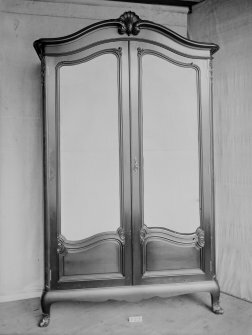 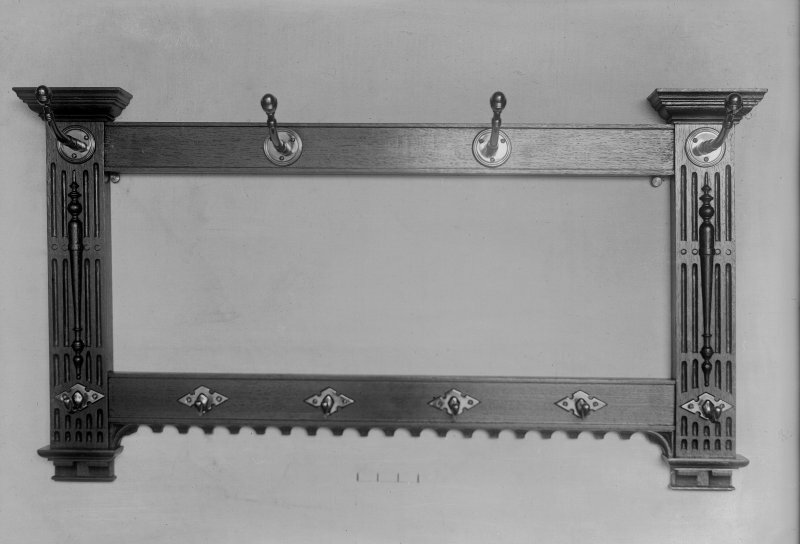 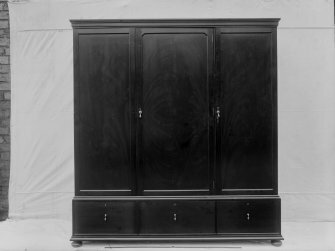 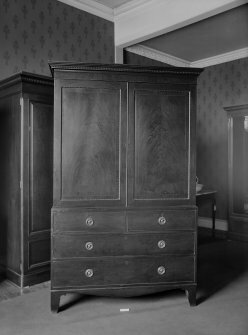 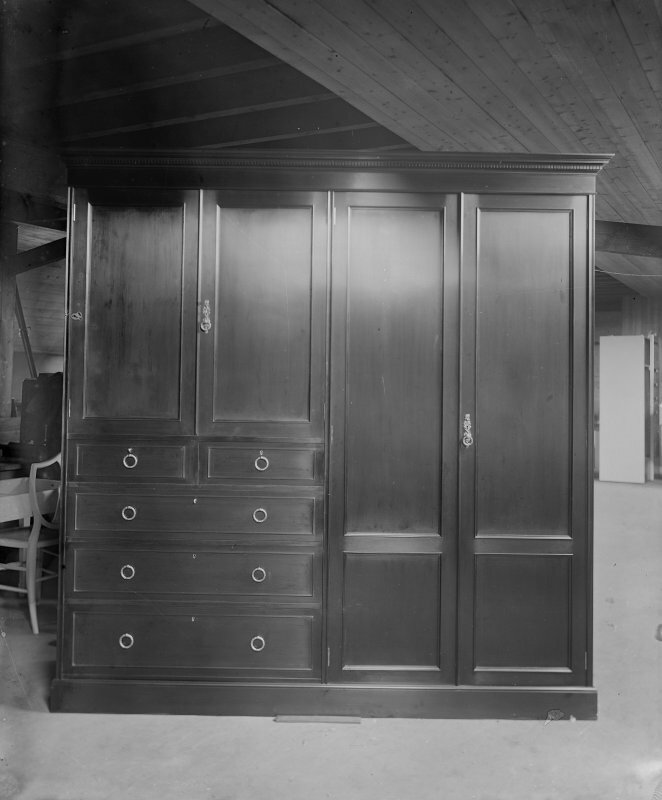 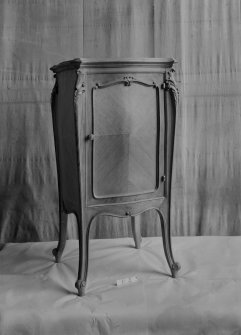 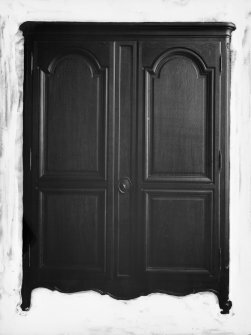 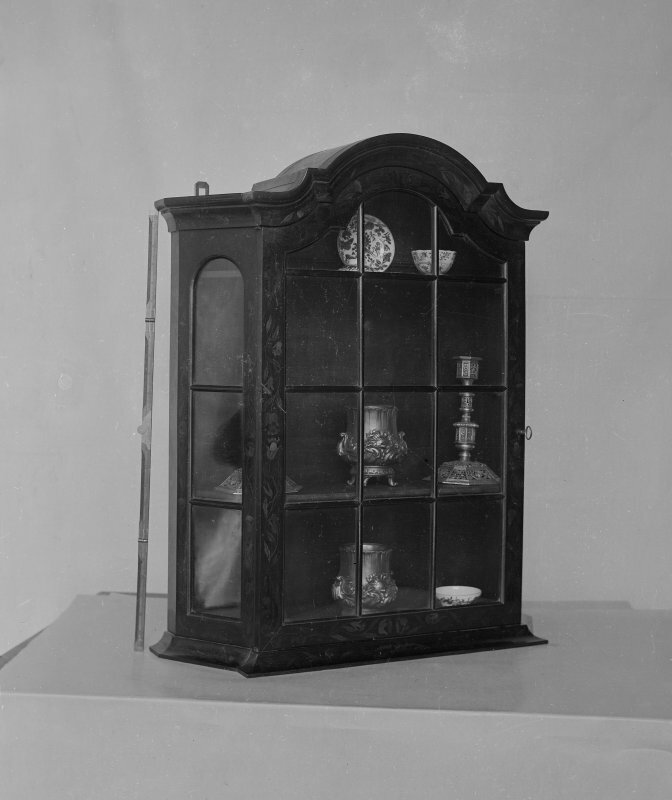 Carved wardrobe - copied from catalogue "Exposition de Bruxelles , 1888"
Wardrobe with three drawers, in situ. 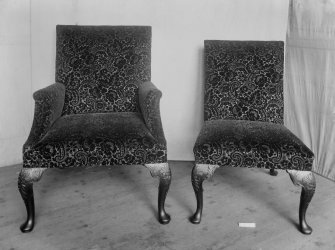 Pair of chairs with tapestry seats. 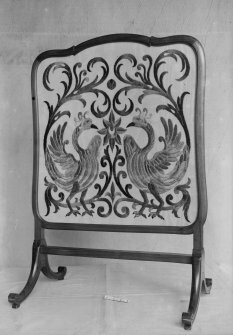 Matched pair of fabric covered chairs. 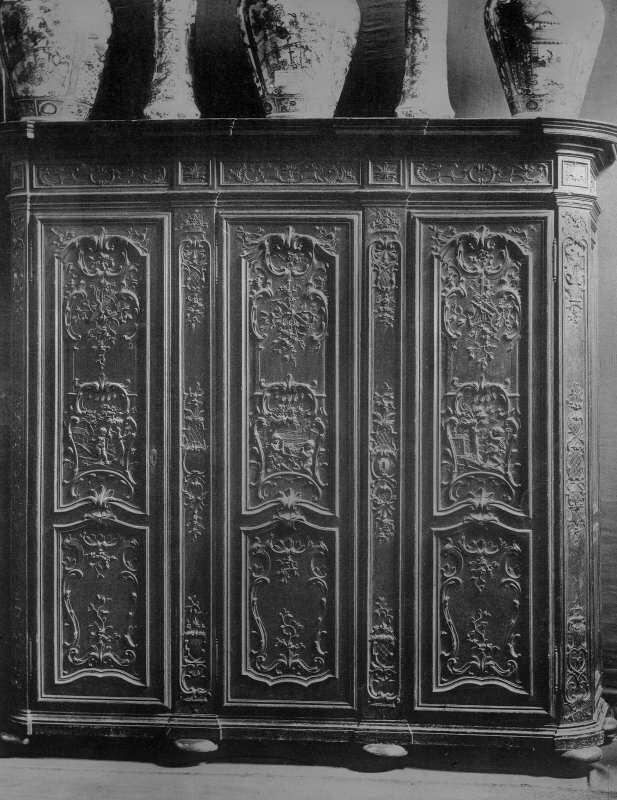 High backed carver, decorated with angels. 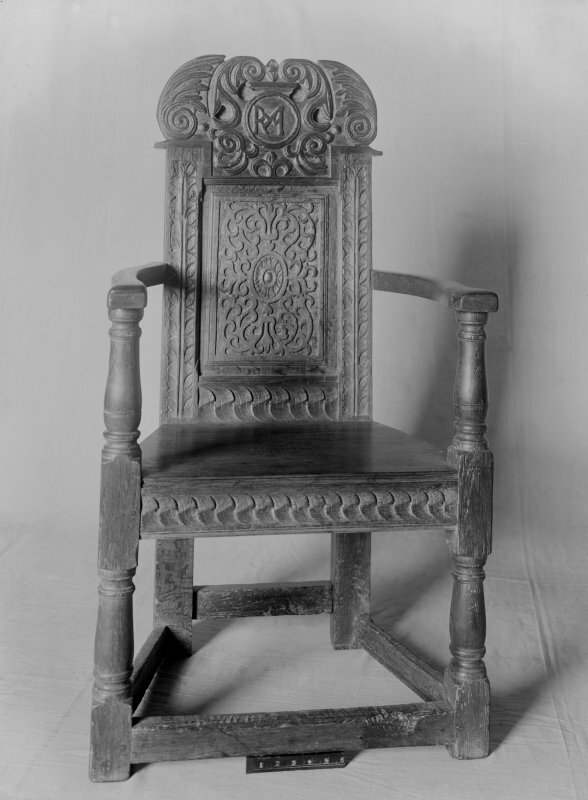 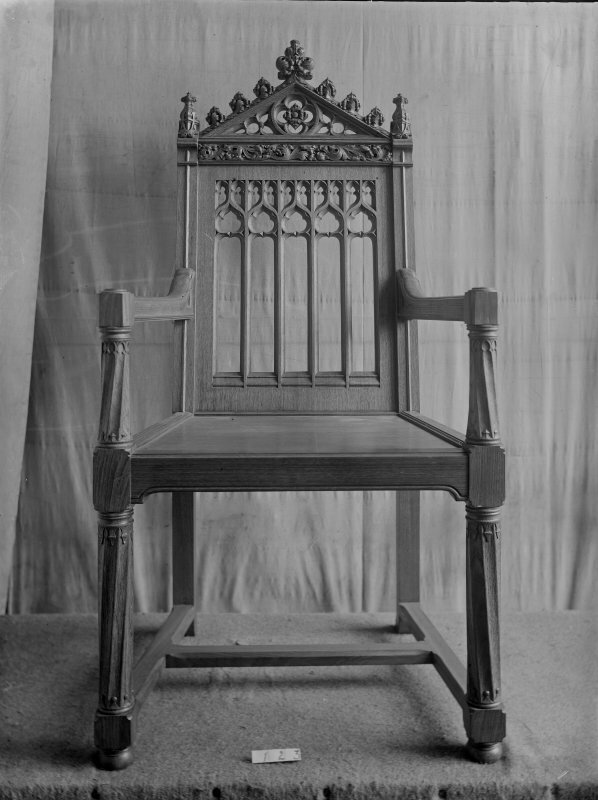 Highbacked carver decorated with crowns. 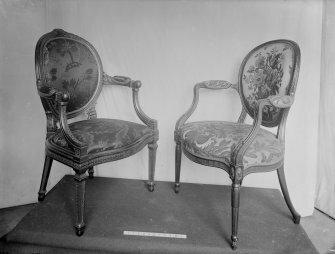 Matched pair of tapestry armchairs with round table. 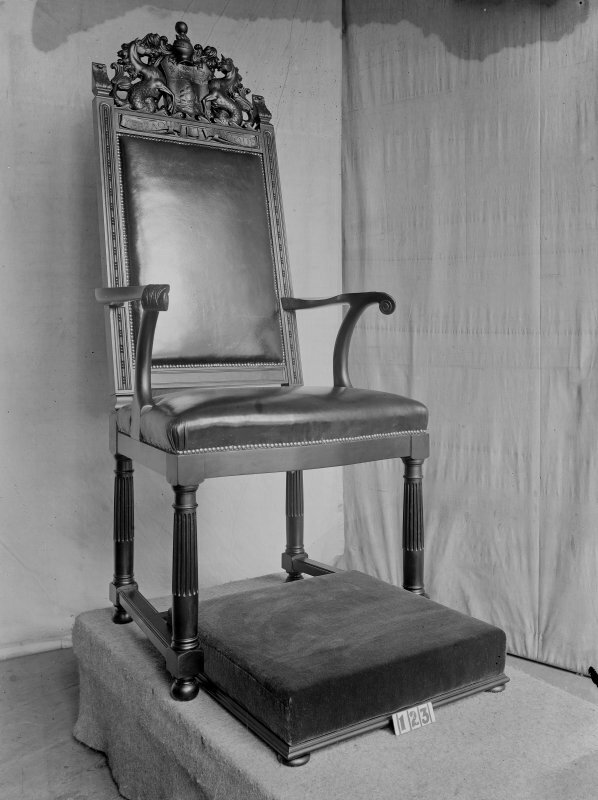 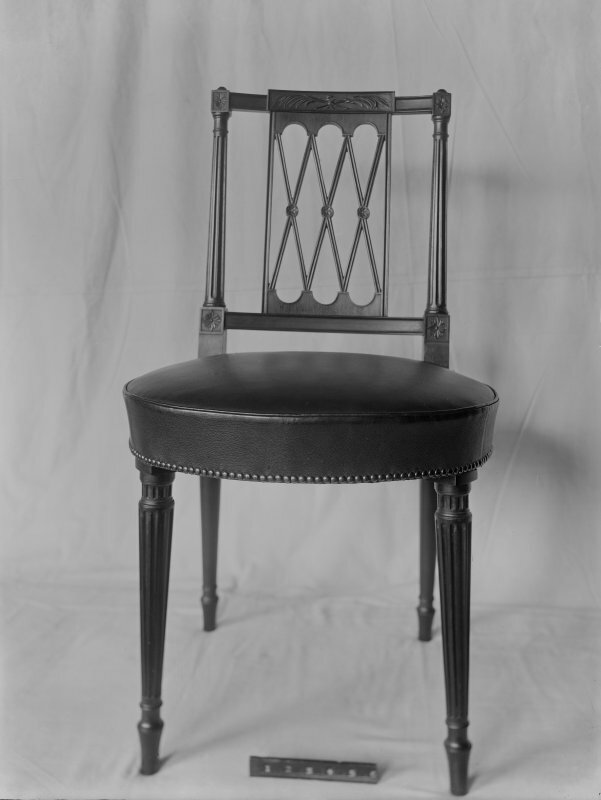 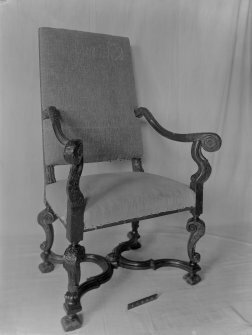 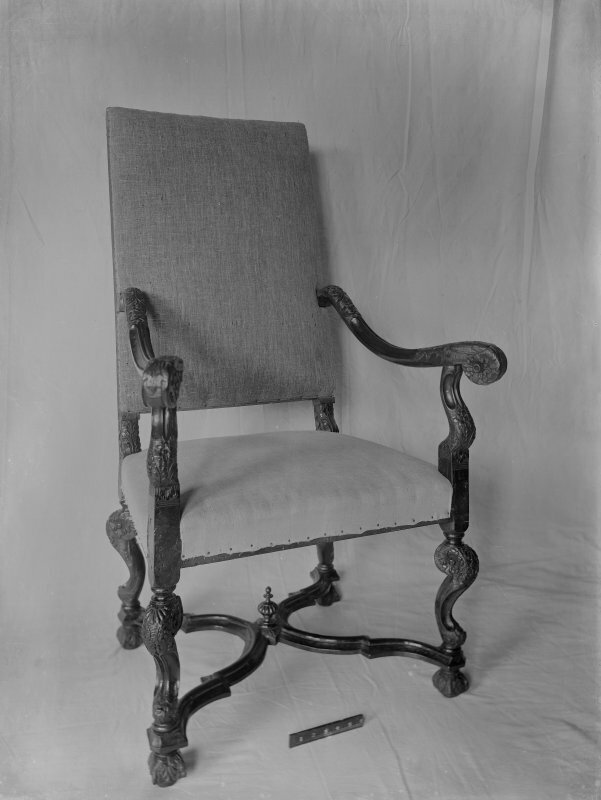 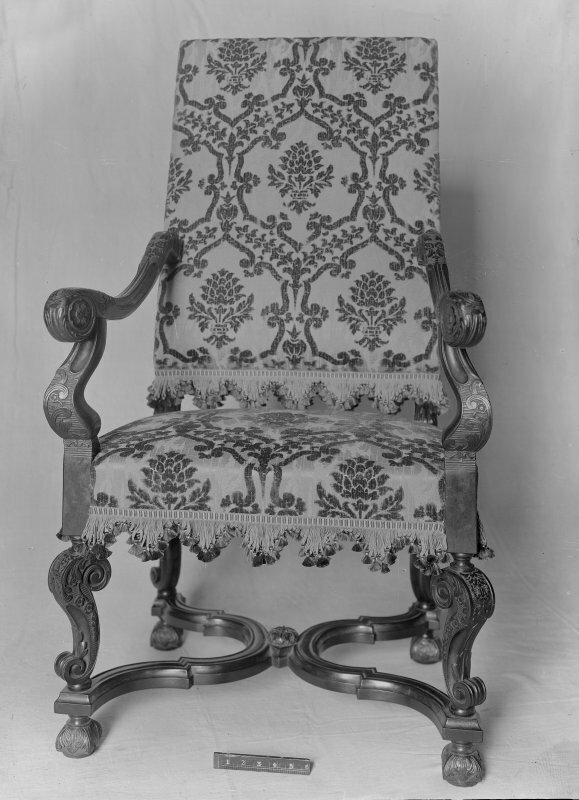 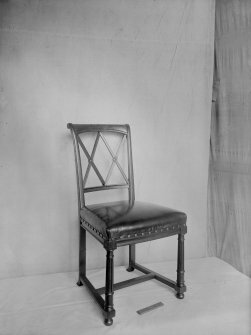 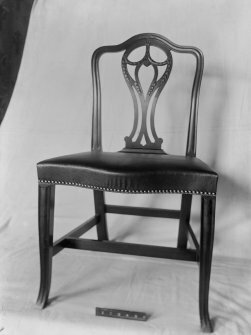 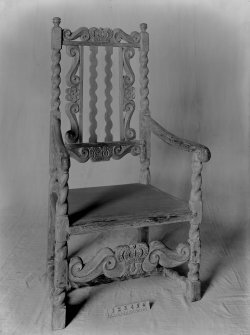 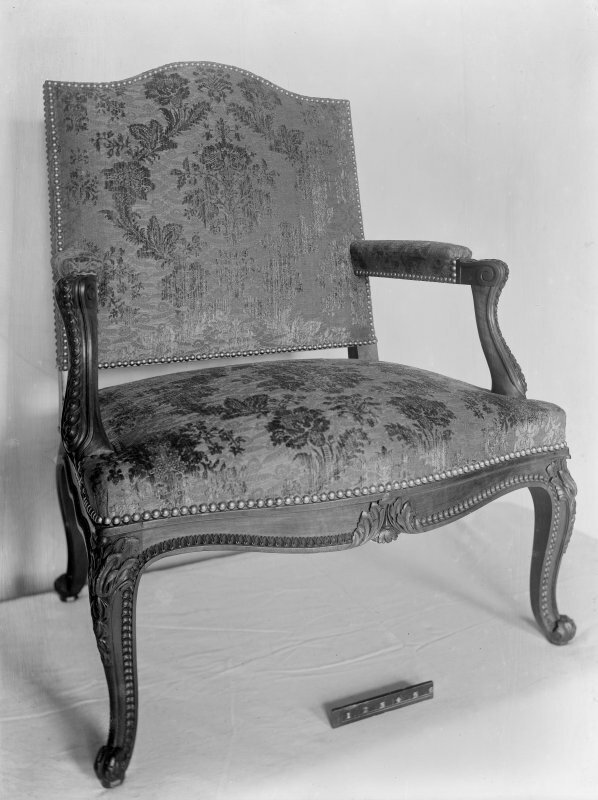 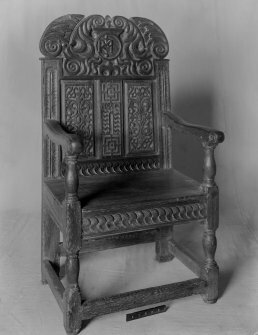 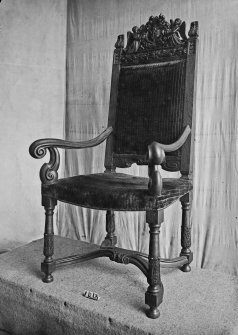 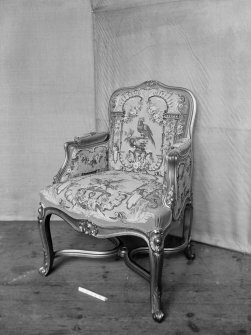 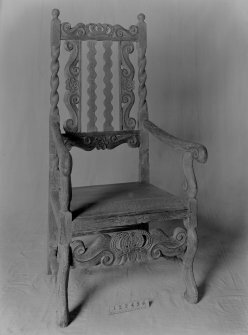 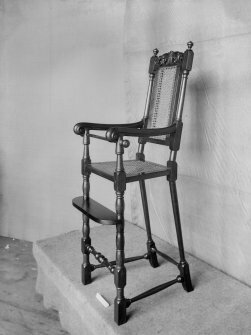 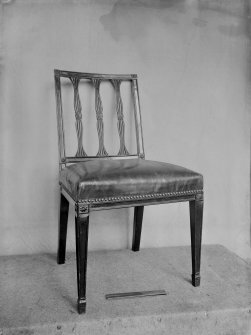 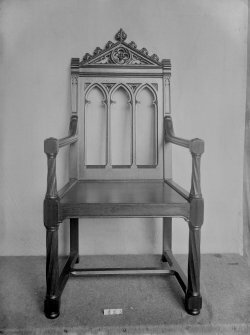 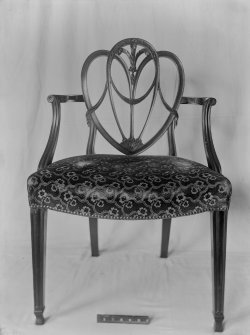 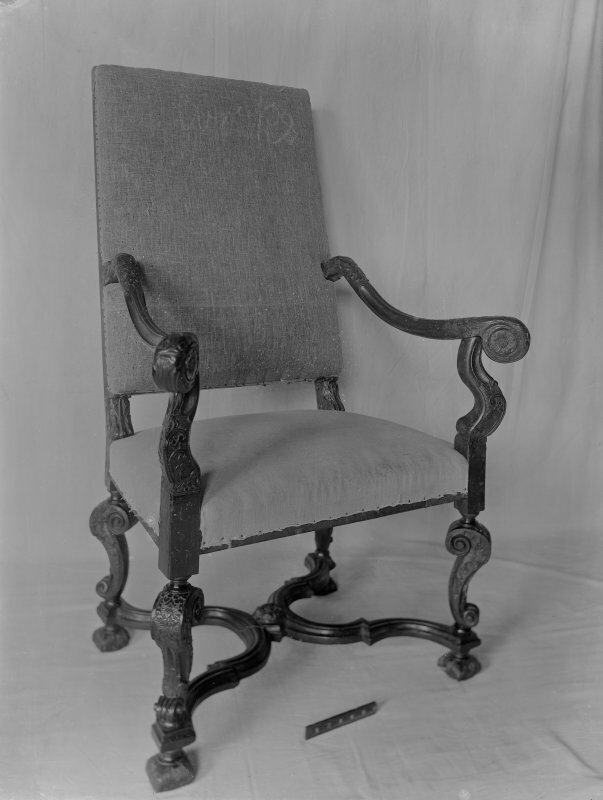 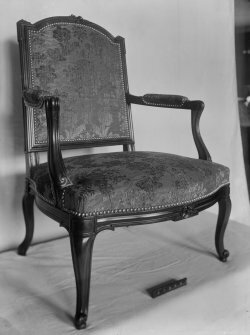 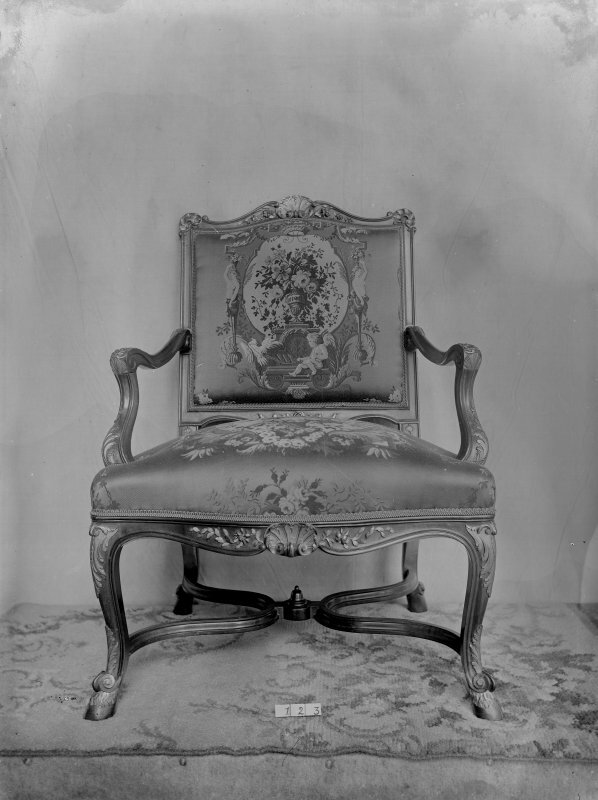 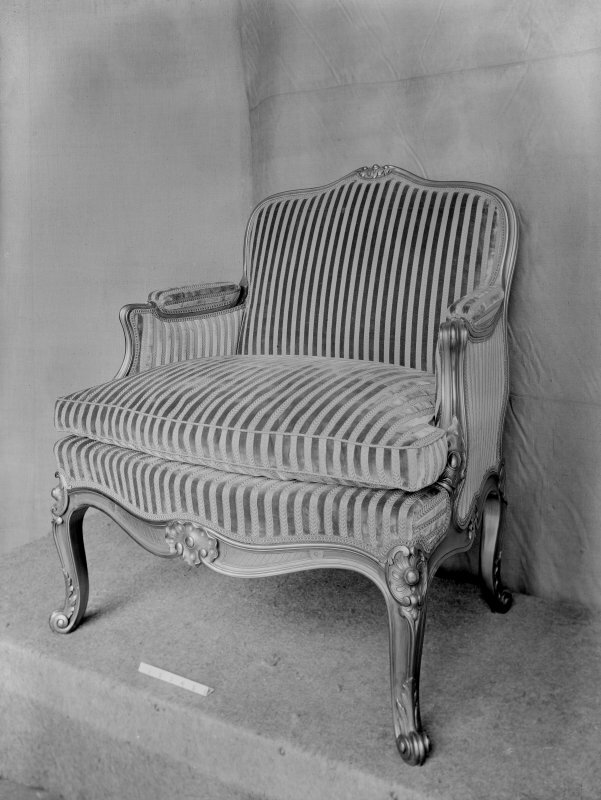 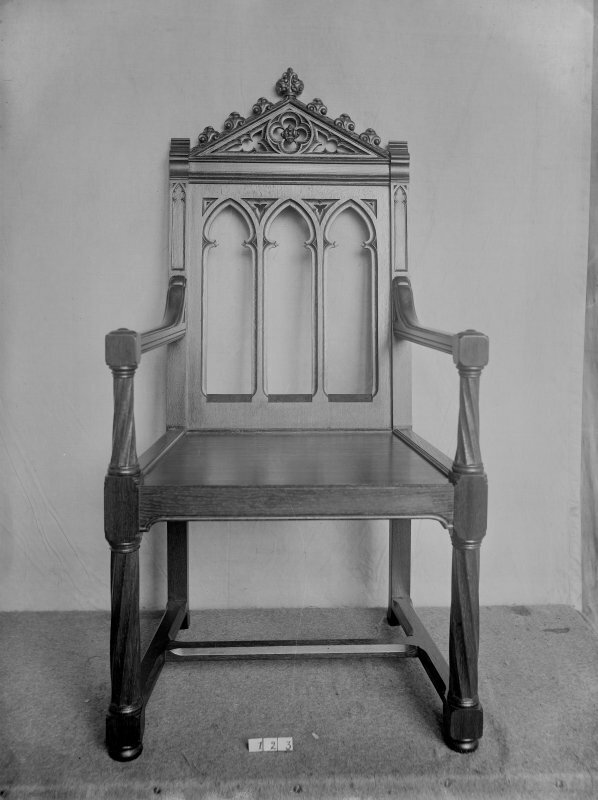 Highbacked chair with heraldic carving "Terraque Marique" - By Land and Sea the motto of the Merchant Company of Edinburgh. 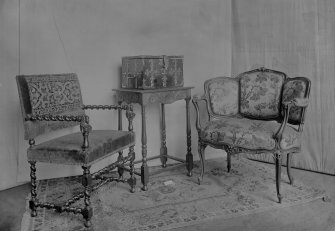 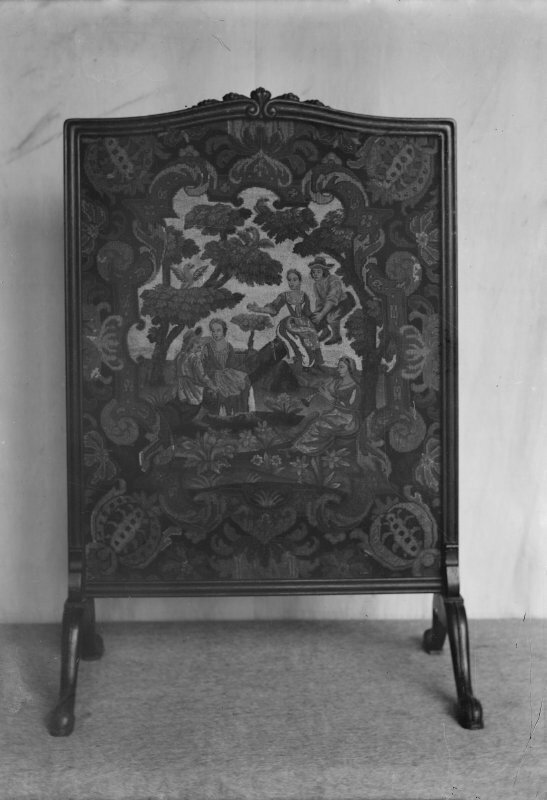 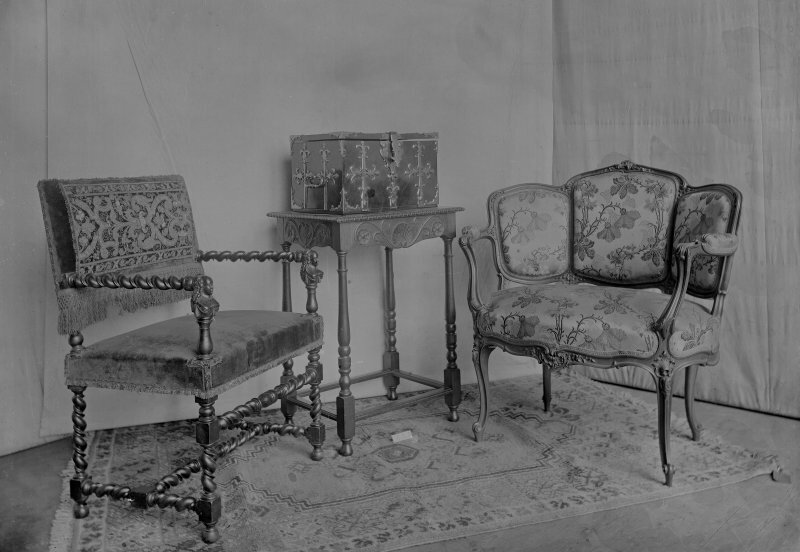 Two ornate tapestry covered chairs, occaisional table and metal bound chest. 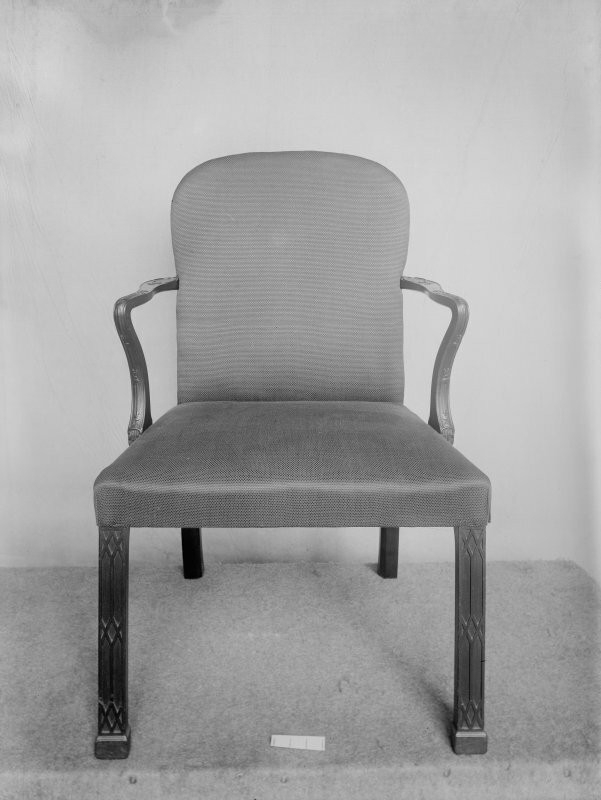 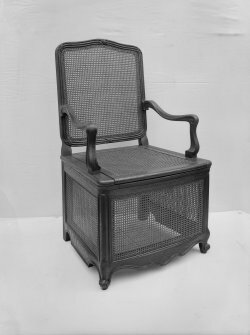 Woven armchair and apolstered club chair. 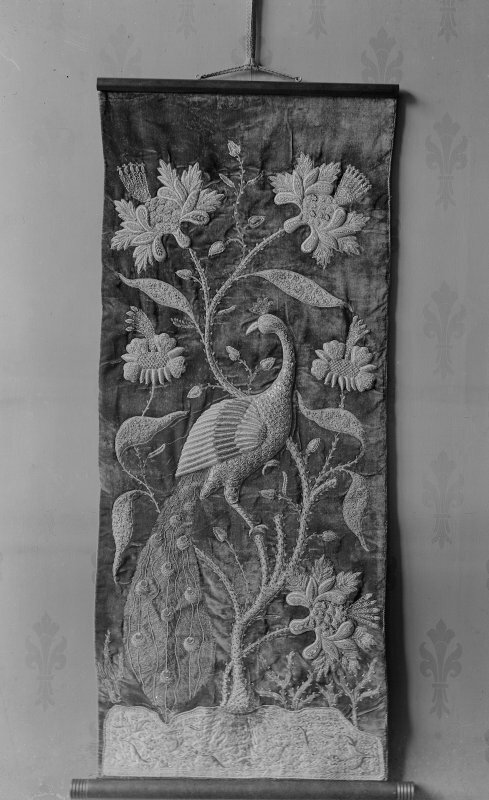 Highbacked cared carver, decorated with flowers, shells and crowns. 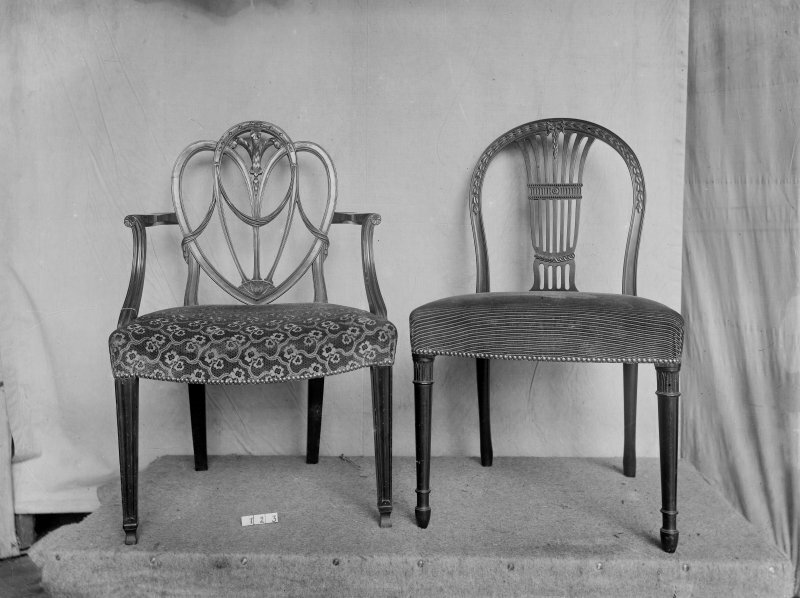 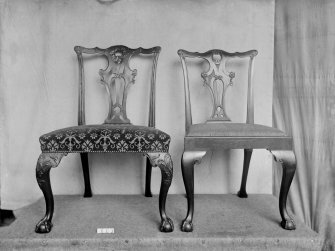 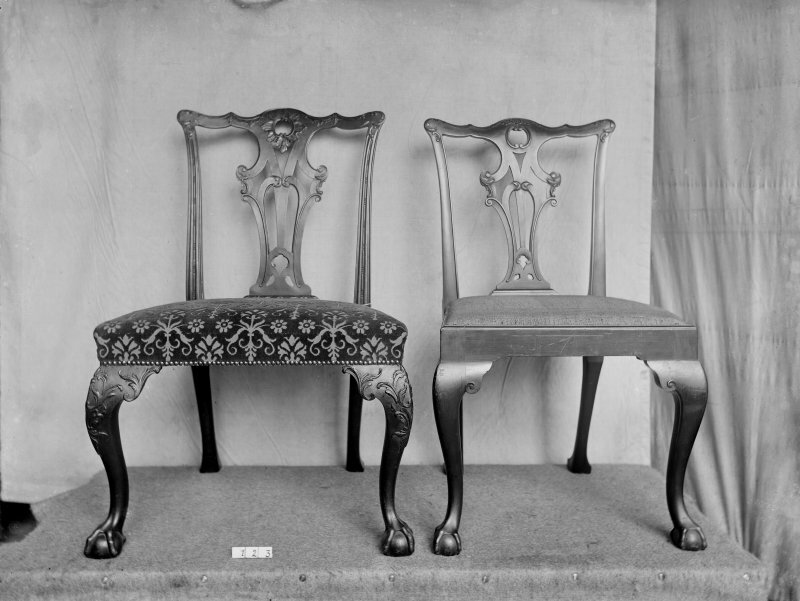 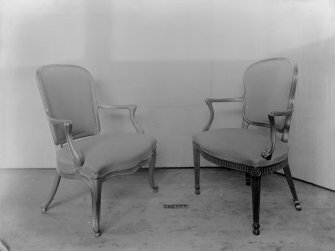 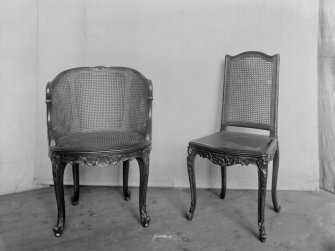 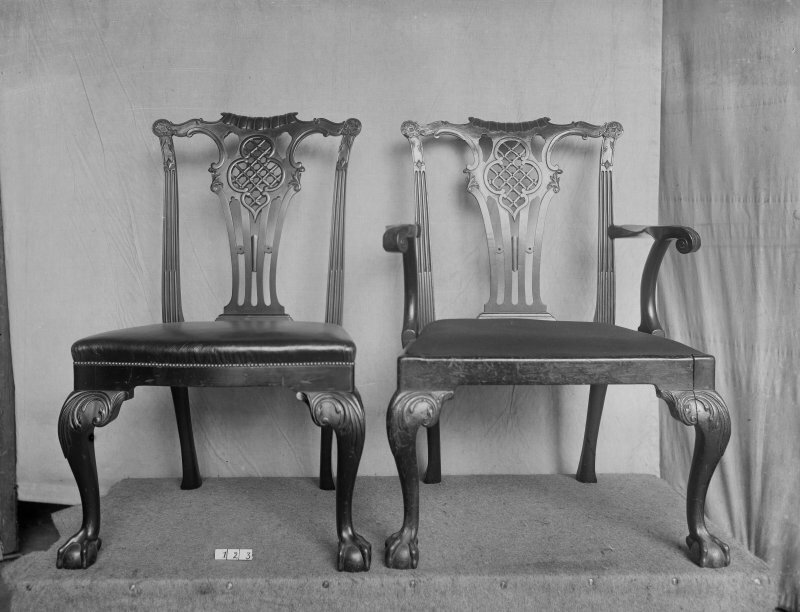 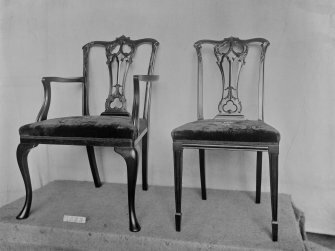 Pair of decorated open armchairs. 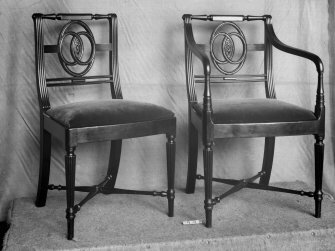 Pair of vase back dining chairs. 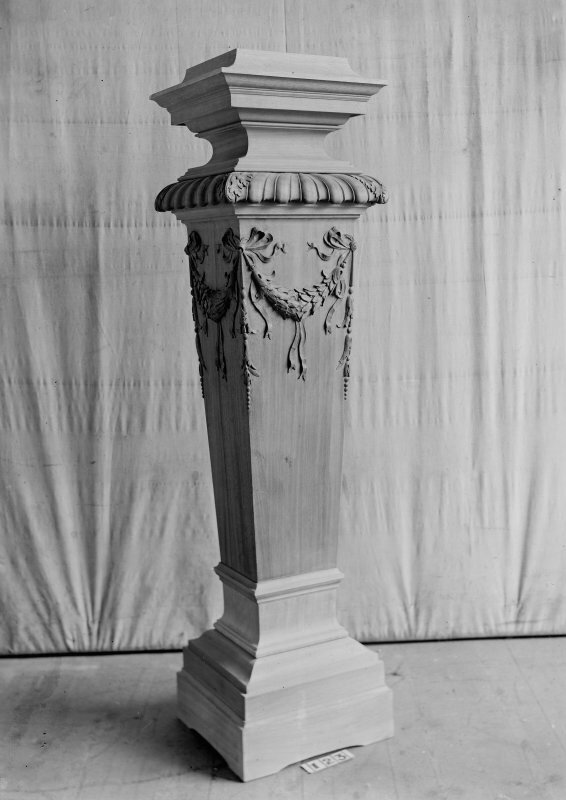 Vase back, dining and carver chairs. 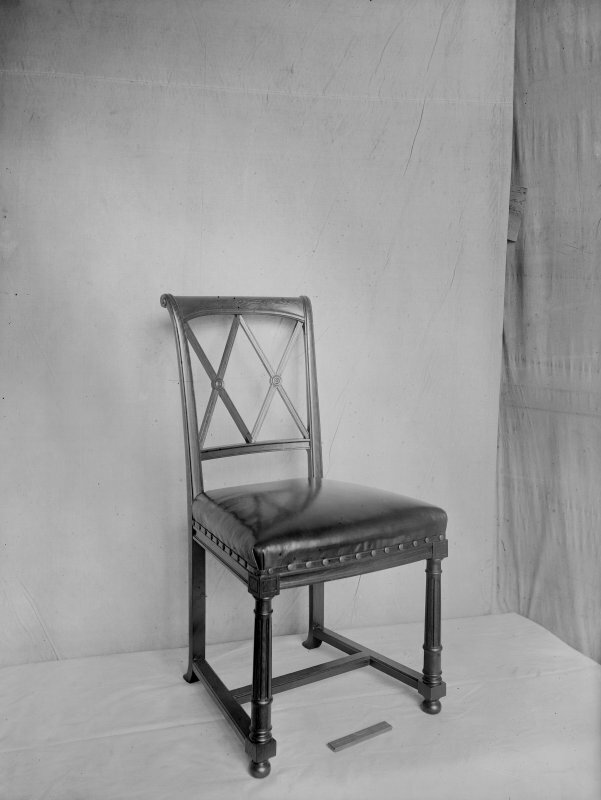 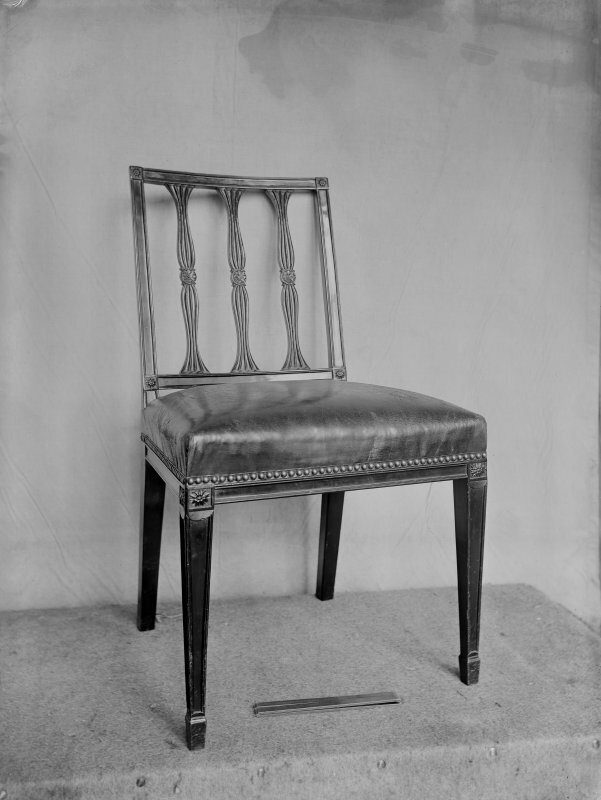 Dining and carver "Chippendale" style chairs. 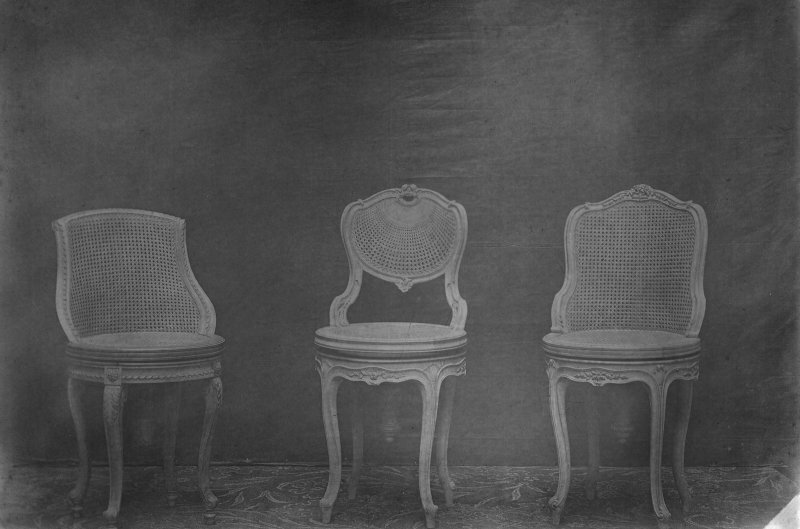 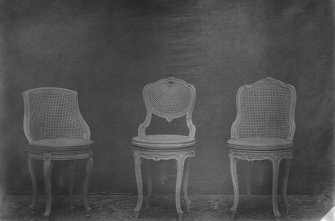 Three different woven chairs - positive on glass. 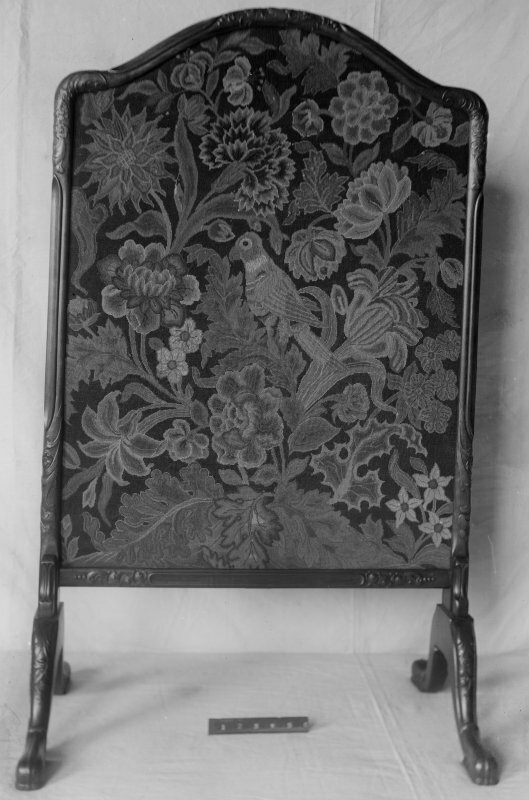 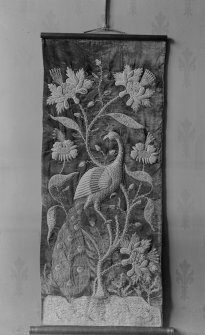 Tapestery armchair, decorated with birds. 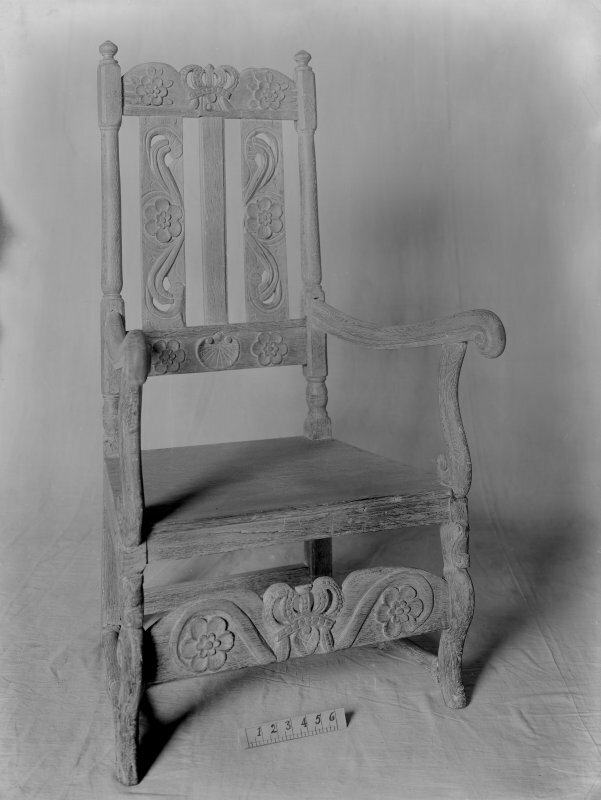 Rustic carved highbacked chair with initials R A.
Vase backed, dining and carver chairs. 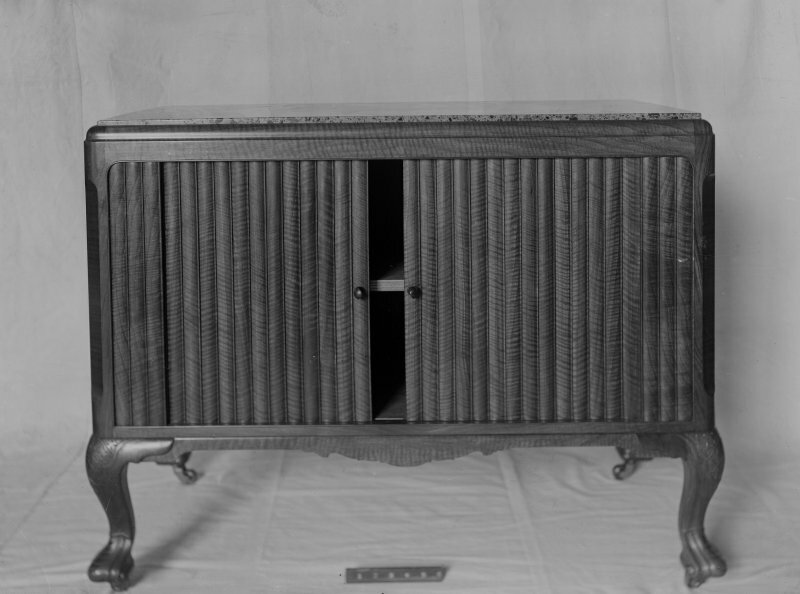 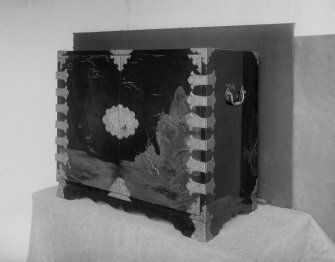 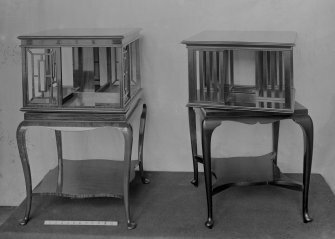 Original wooden glass plate storage boxes from the Whytock and Reid Collection. 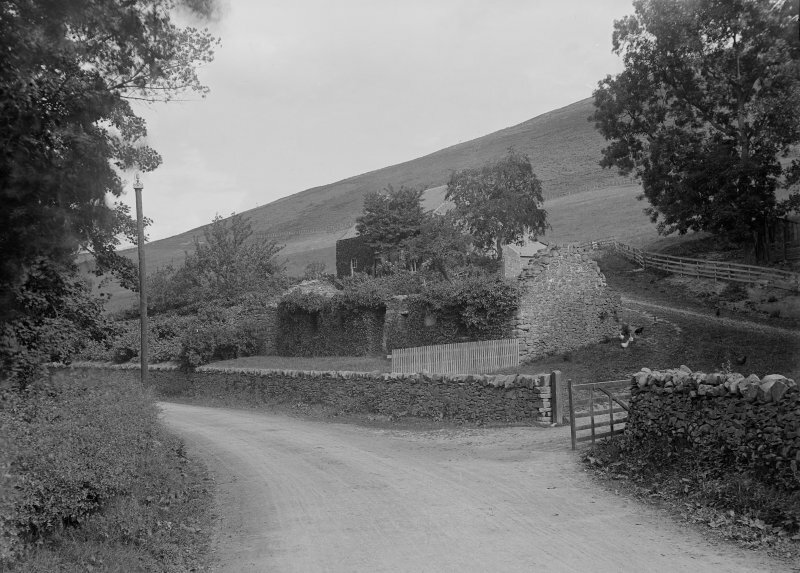 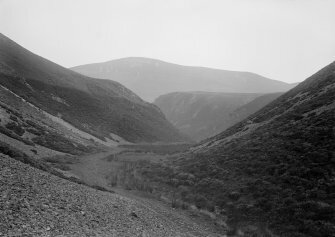 Unknown location, general exterior landscape. 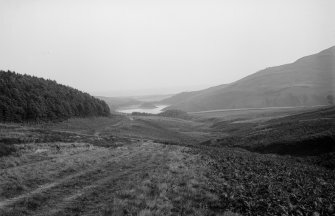 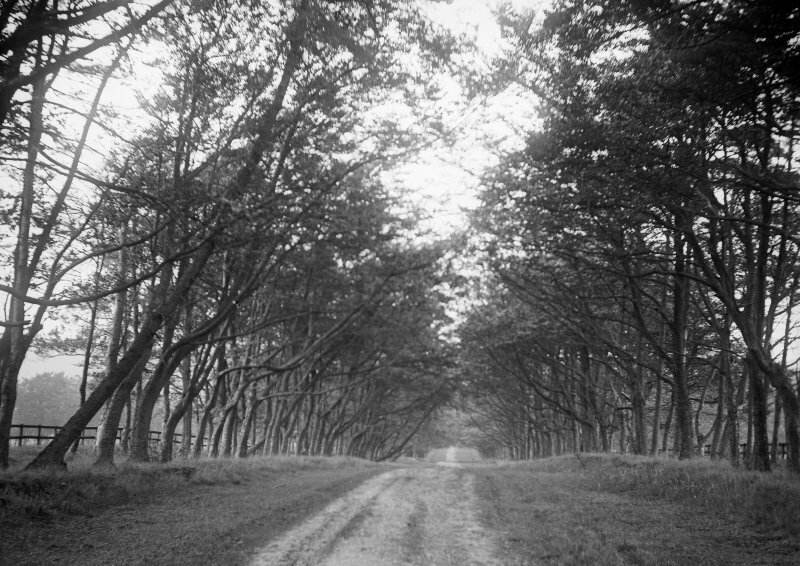 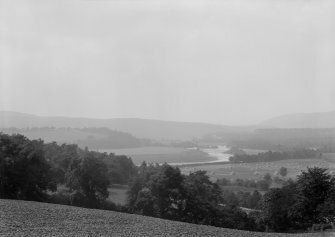 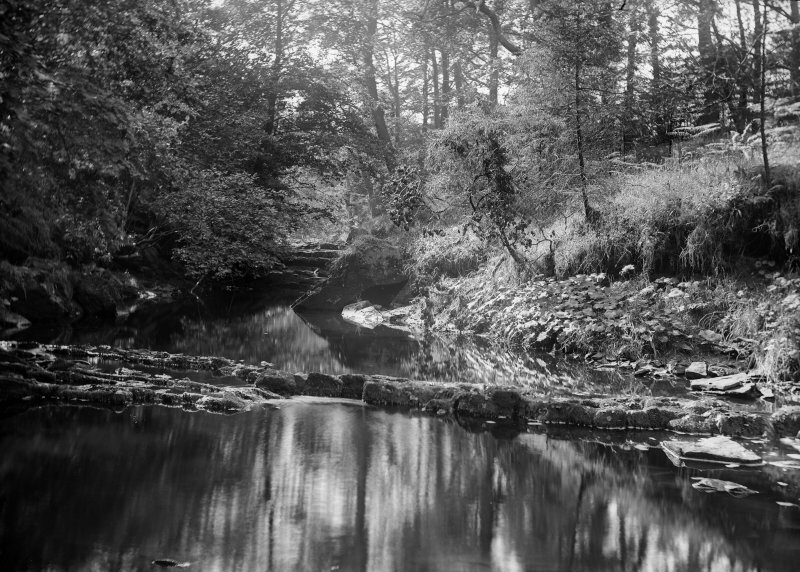 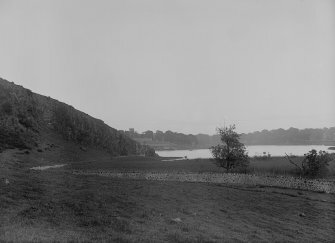 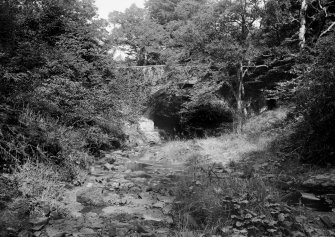 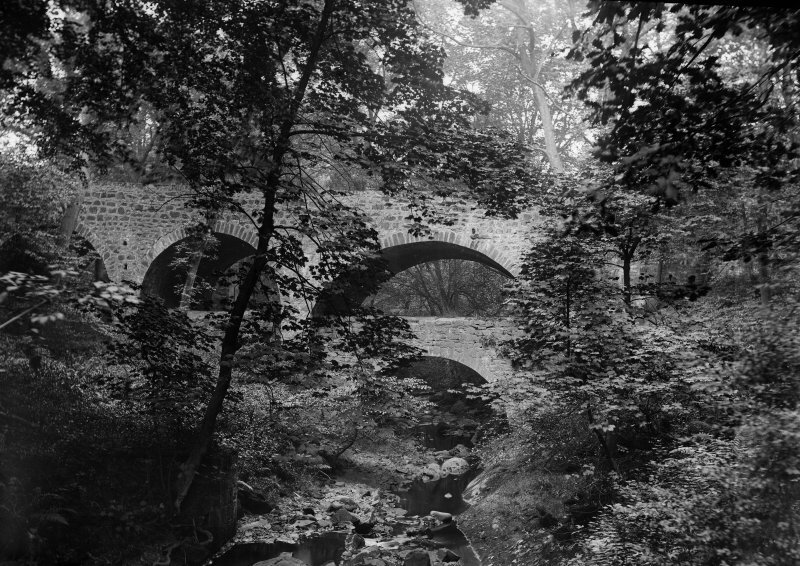 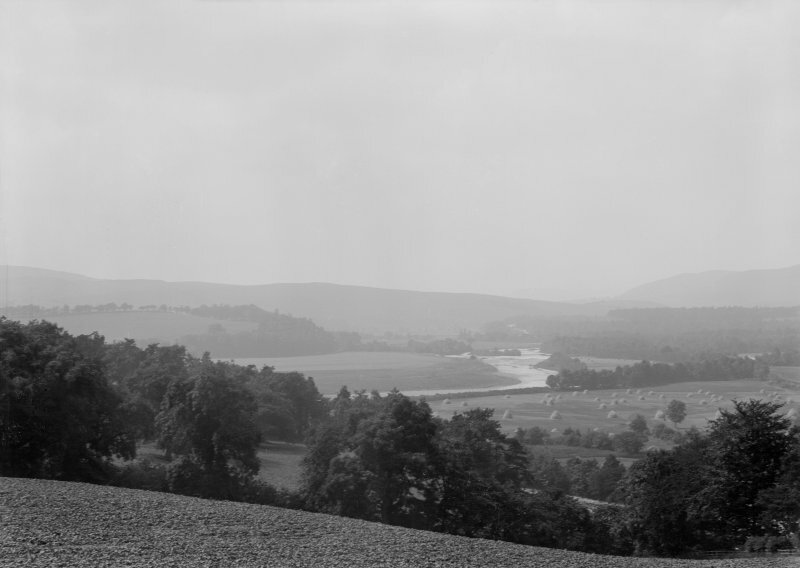 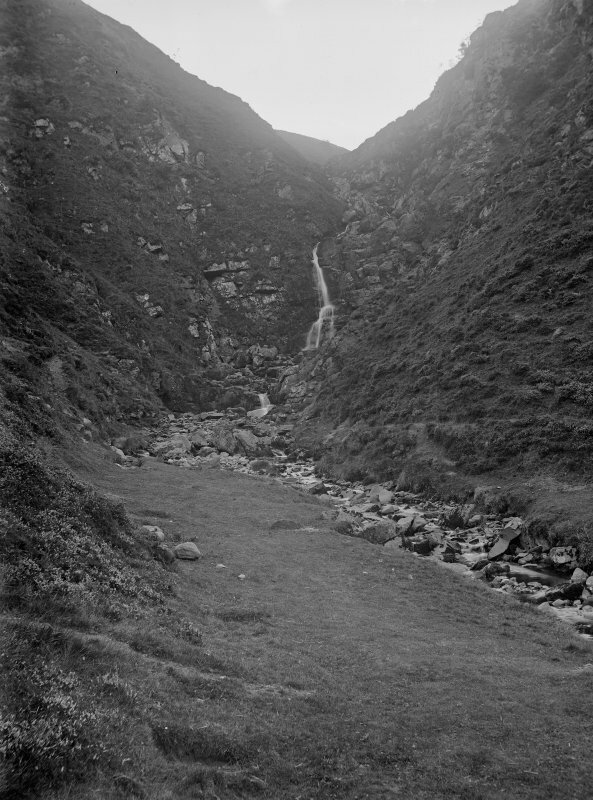 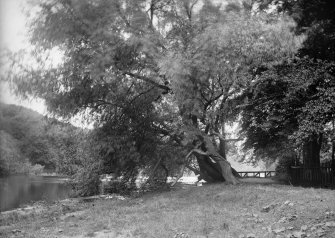 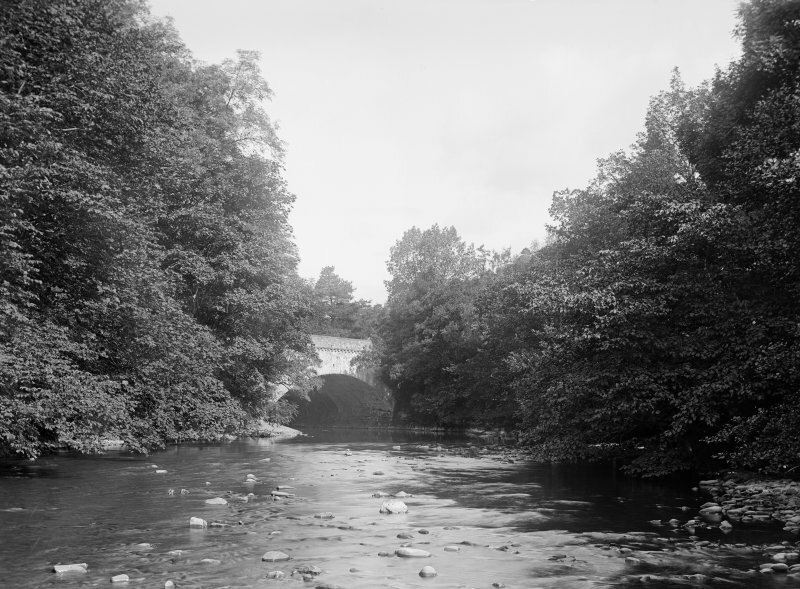 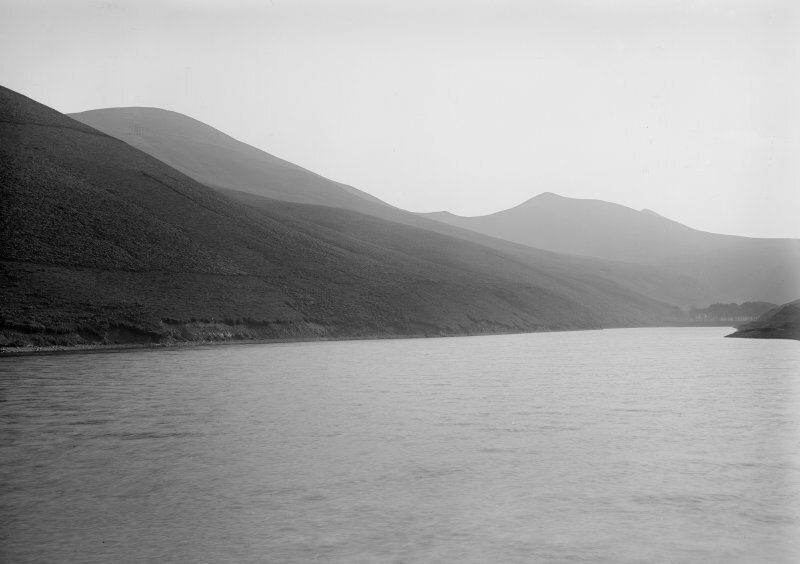 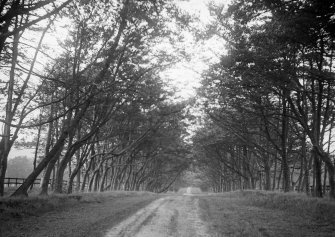 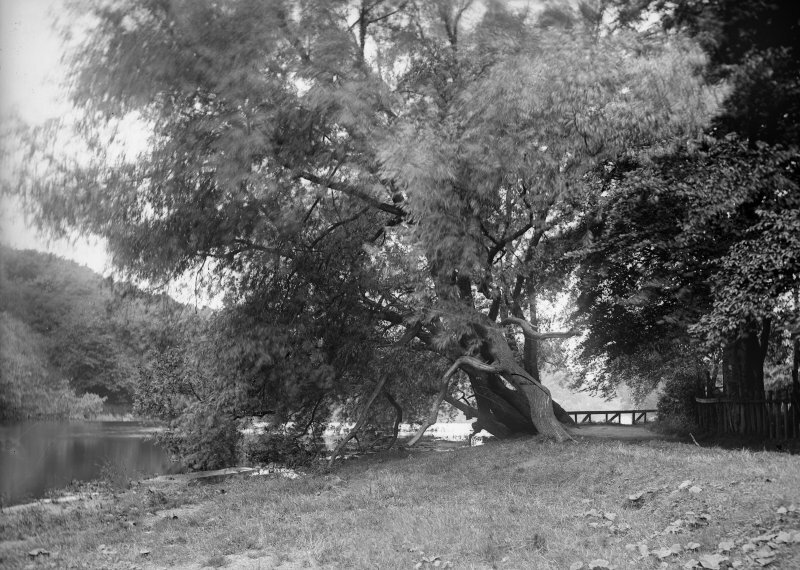 Unknown location, general landscape view. 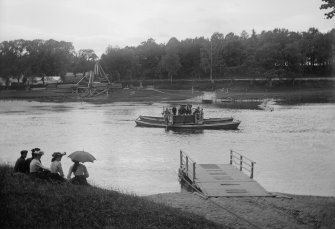 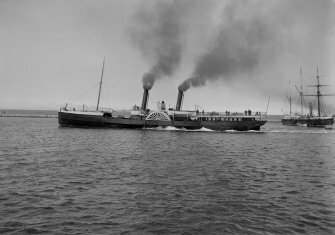 Unknown location, view of cable driven ferry. Chesterfield style sofa in situ. 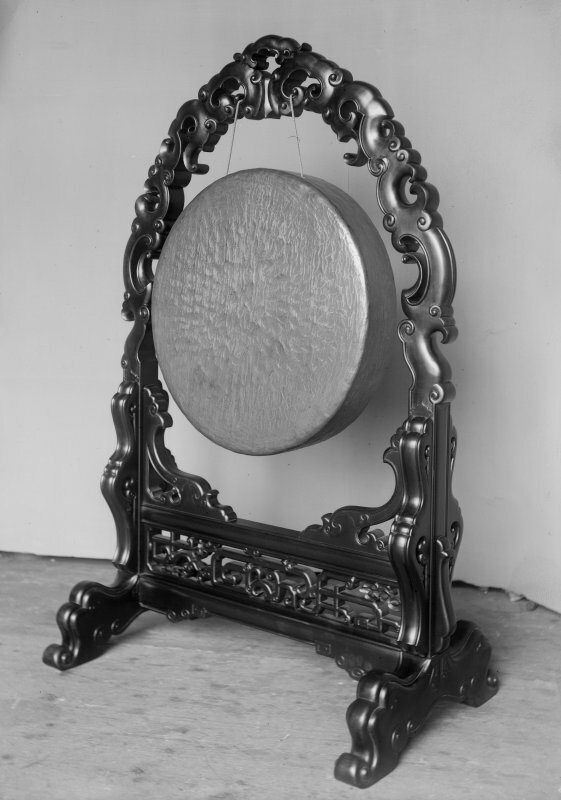 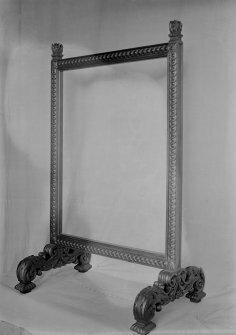 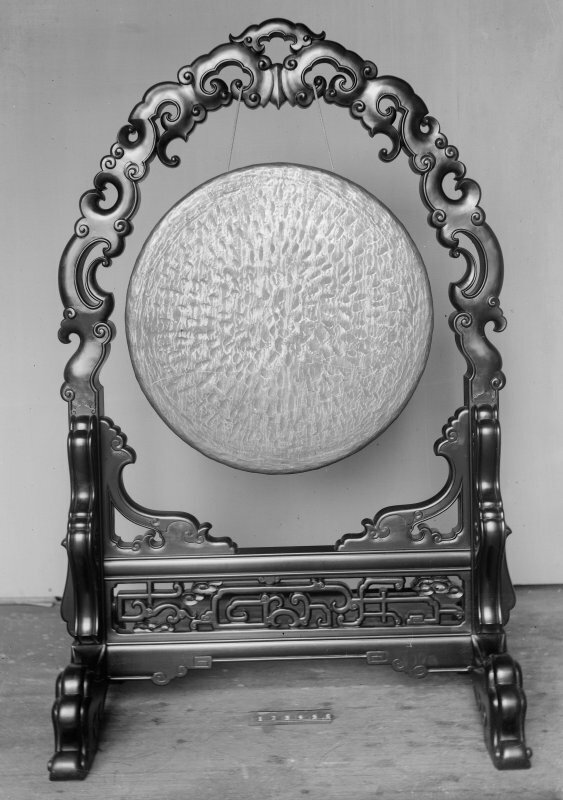 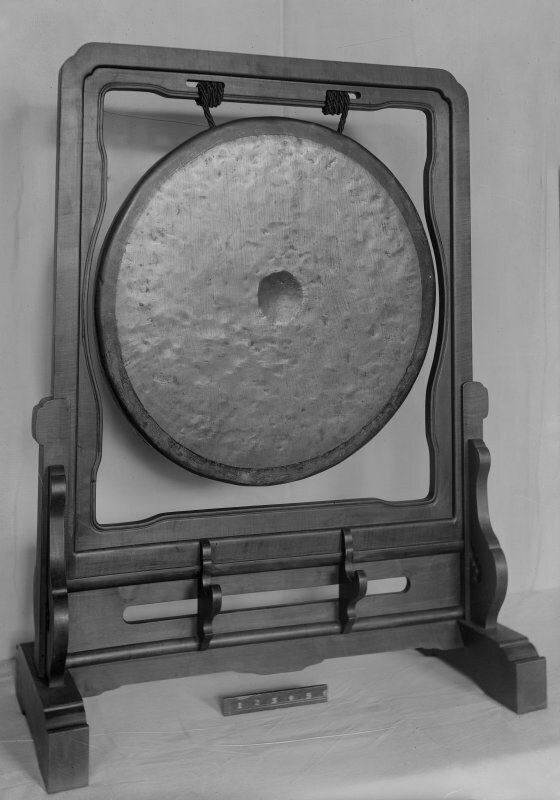 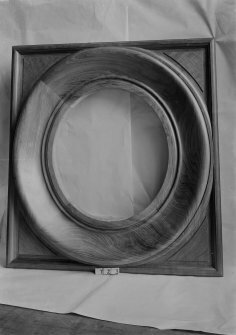 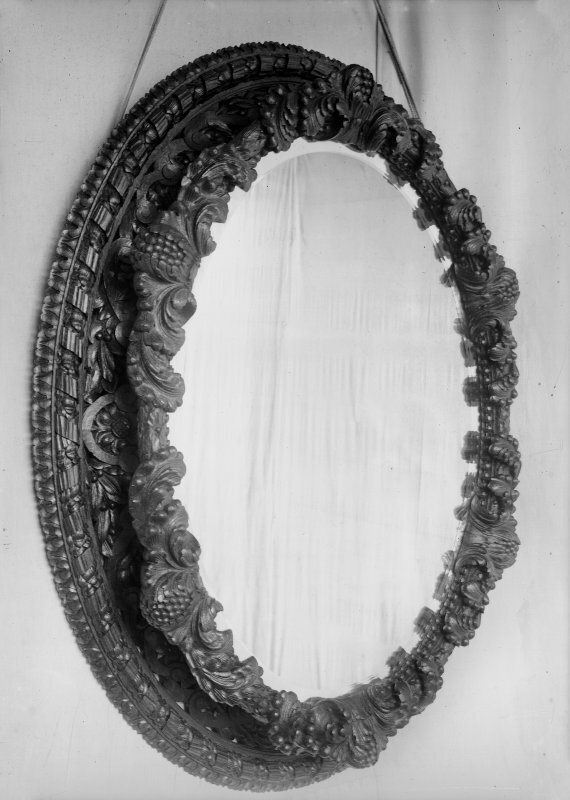 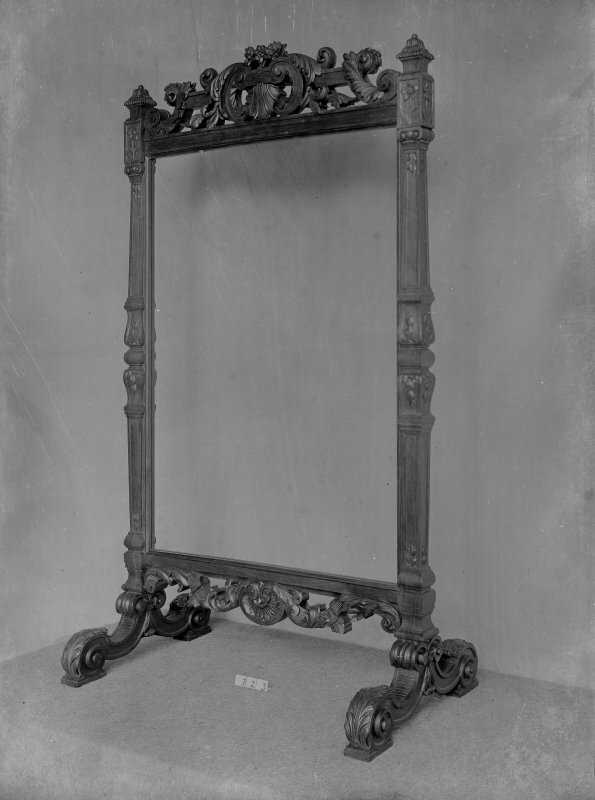 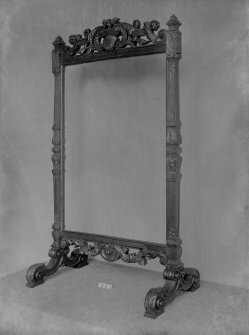 Wooden frame for bust/mirror ? 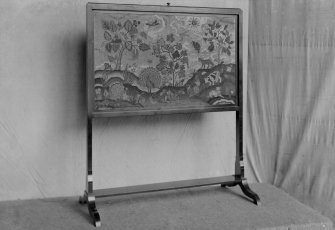 Leather inlaid desk top ?. 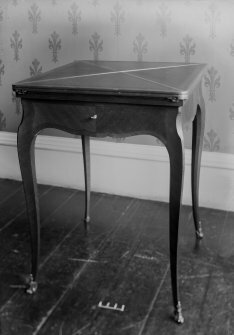 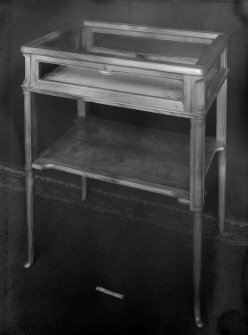 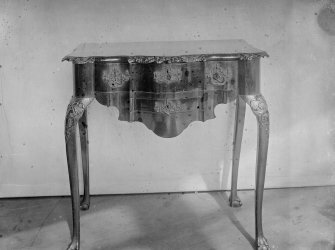 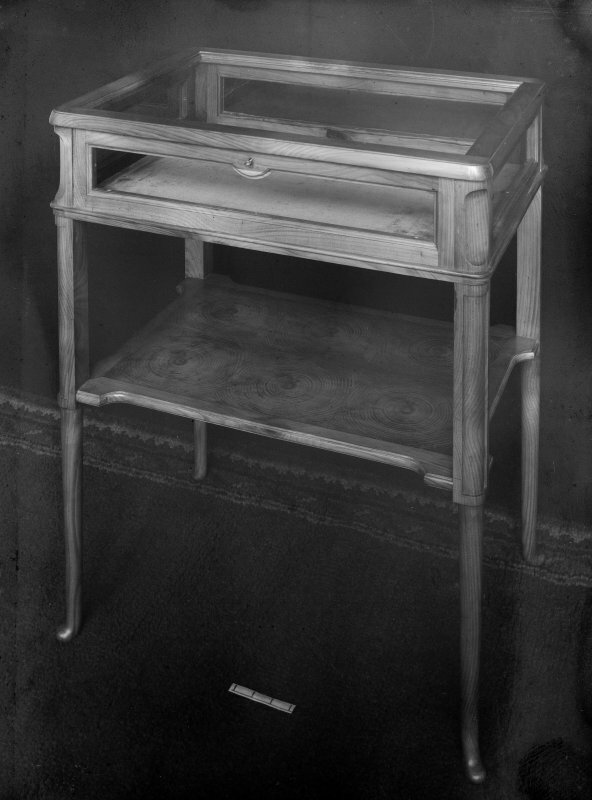 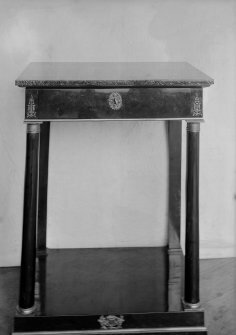 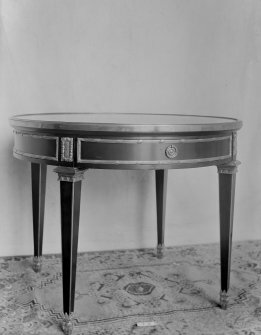 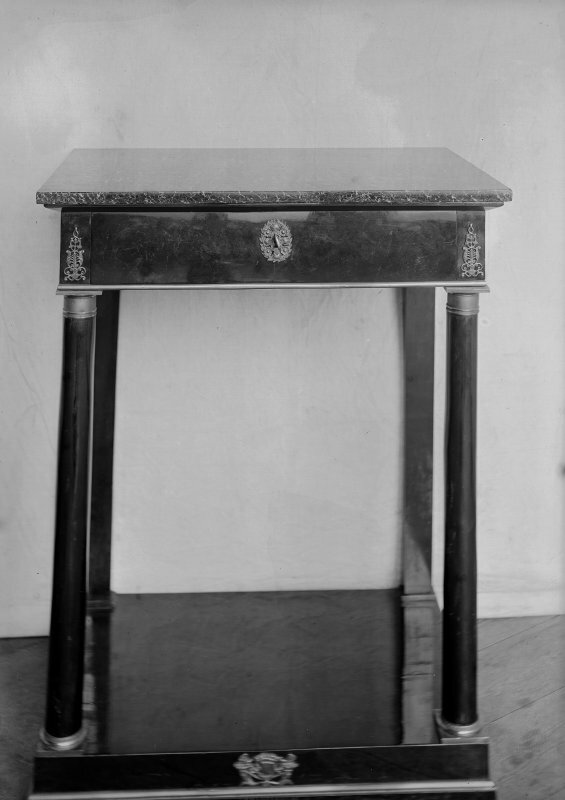 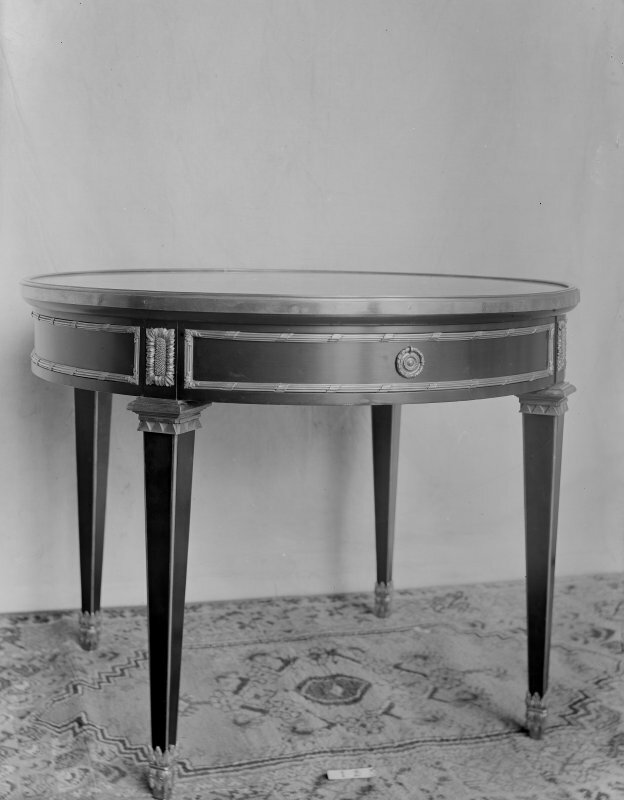 Hall table fancy brass foot covers and drawers extended. 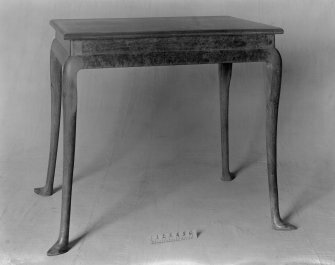 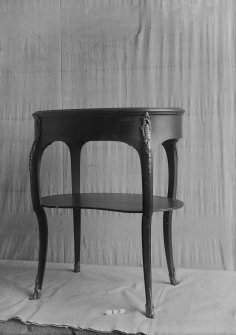 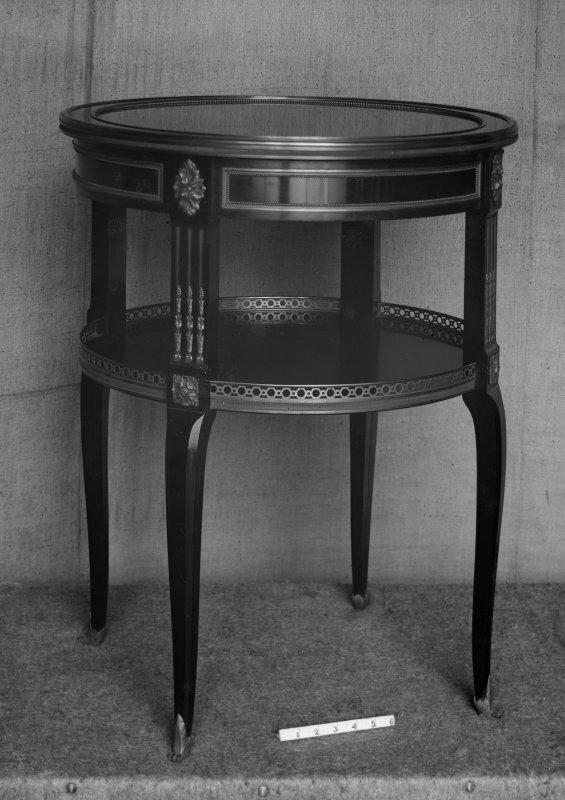 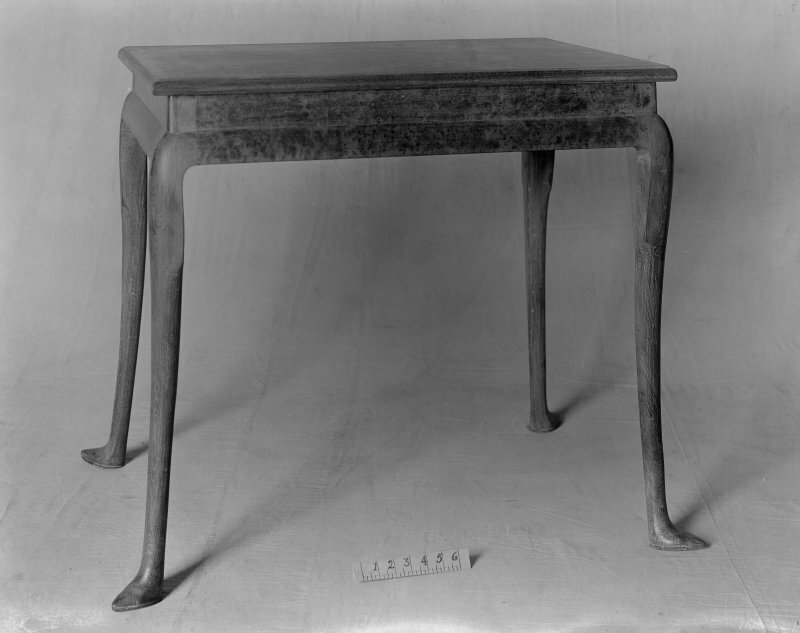 Table with drop sides in woven cane. 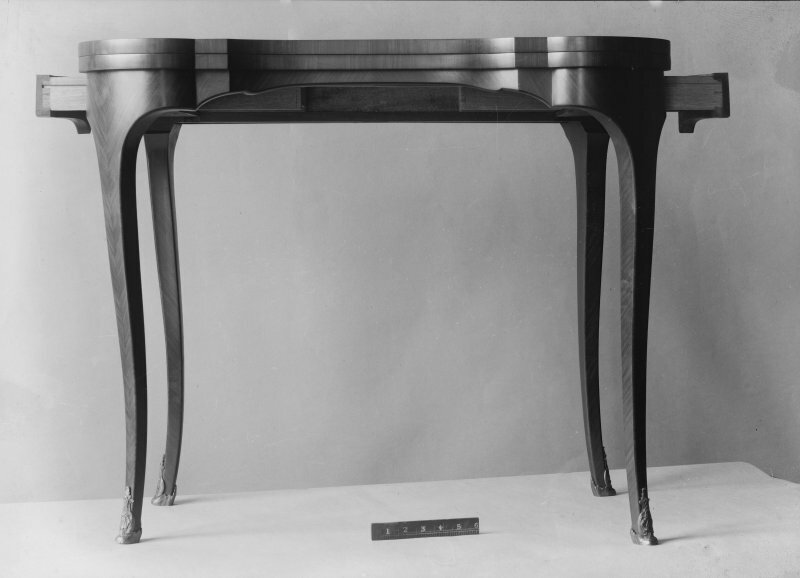 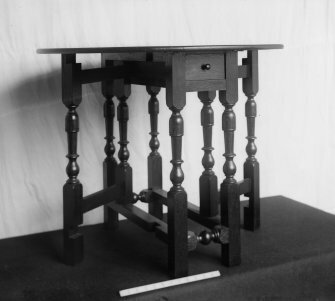 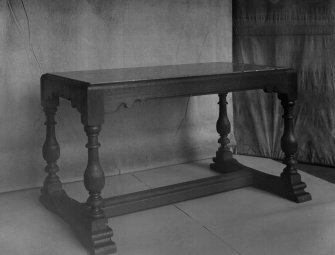 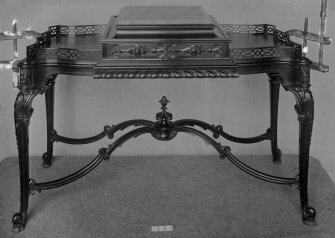 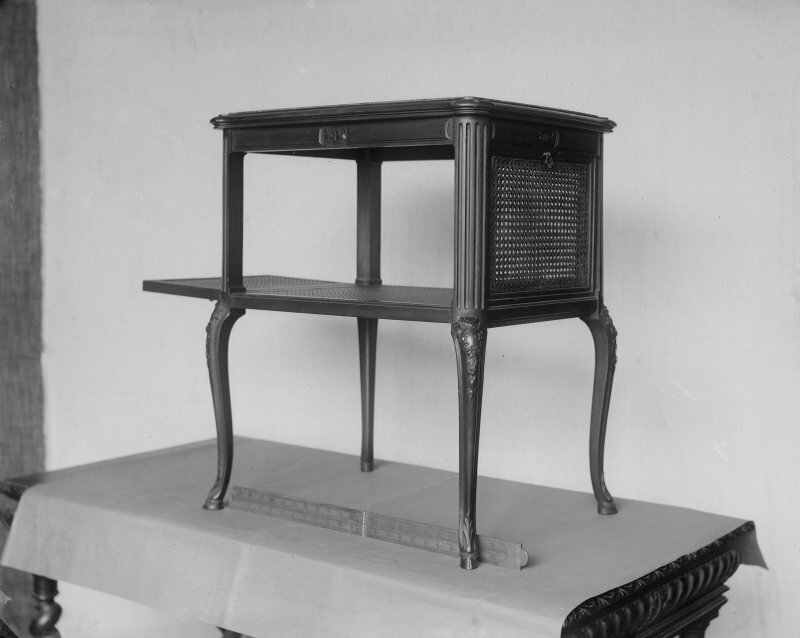 Long table with five drawers. 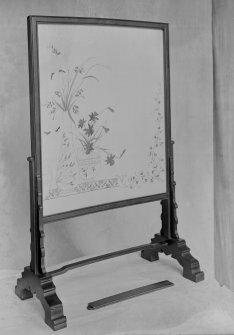 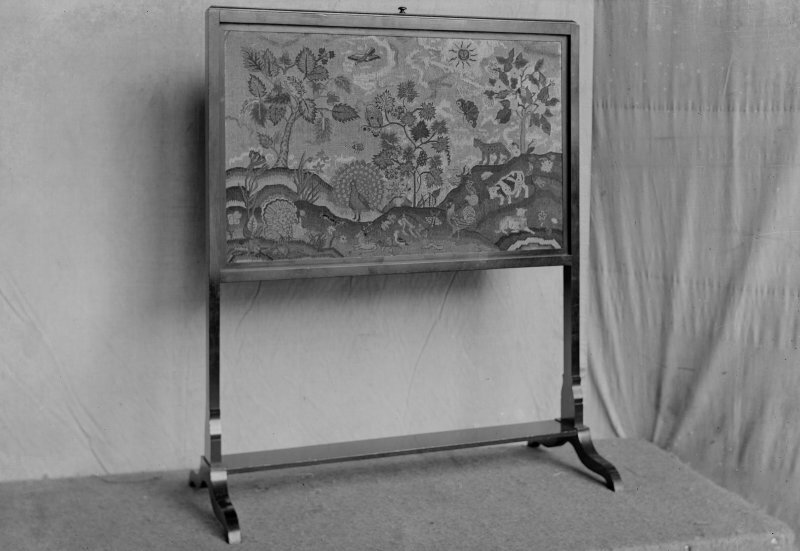 Marquetry table top, inlaid with flowers. 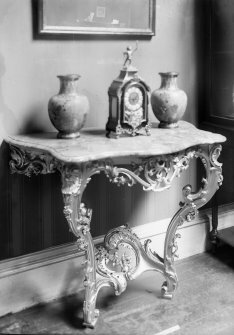 Roccoco style console table in-situ. 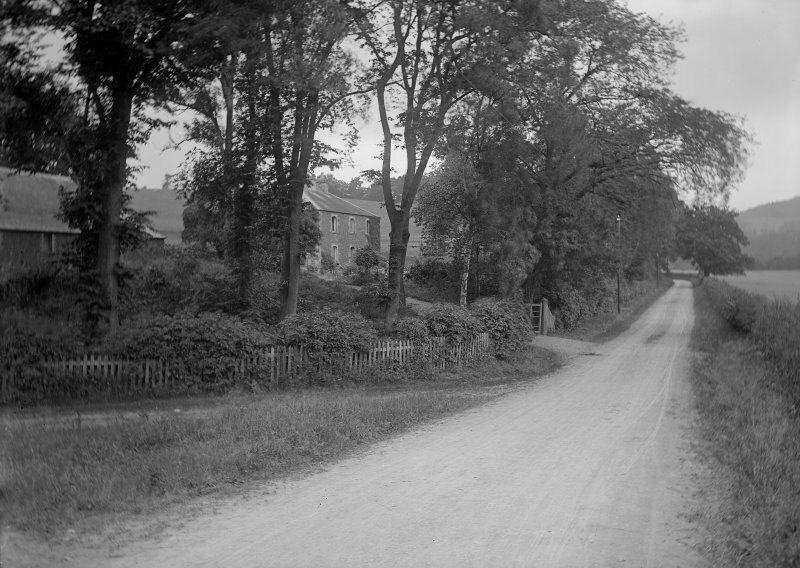 General view on unknown hamlet. 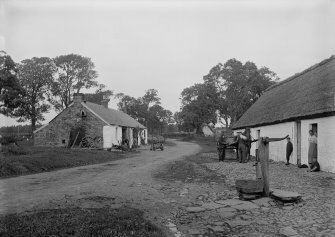 General view of village with market cross. 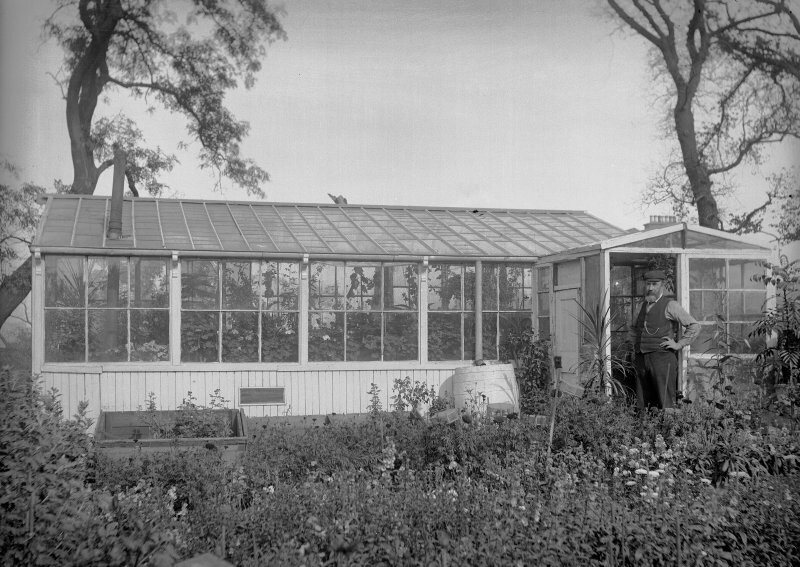 Unidentified view of glasshouse and garden.